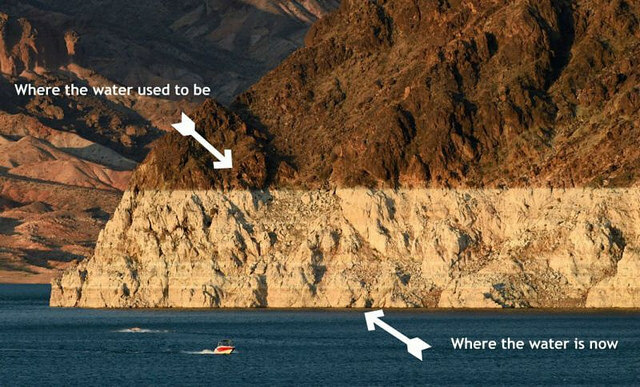 The rise of mechanized agriculture practices and industries coupled with 14 years of extreme drought has almost completely dried out one of the largest lakes in the United States. Empty docks that once floated atop the water now sit along the cliffs that were previously the lake’s shores. California is also in serious trouble thanks to its rapidly increasing population density. Even though California supplies nearly 100% of the strawberries, almonds, grapes, carrots, and avocados consumed in the United States, the soil is rapidly drying out and prices are rising astronomically. The droughts end up being a major contributor to the creation of forest fires. 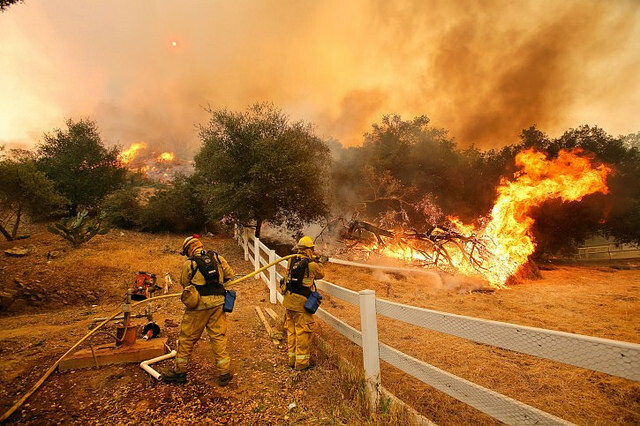 Thanks to the presence of high winds and dried out vegetation, these fires are able to spread rapidly across forests and into urban areas, thereby increasing the risk and danger of putting them out. 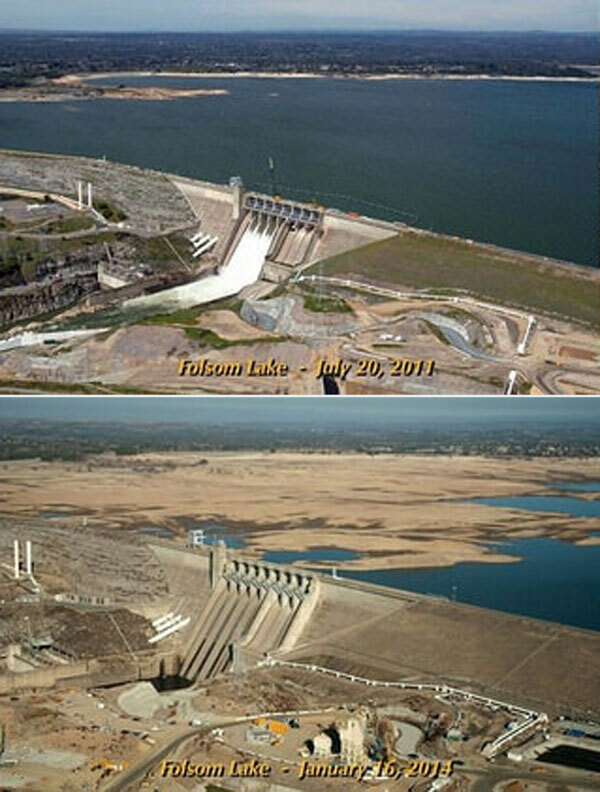 California is now in its third year of severe drought and the entire landscape is starting to resemble before/after postcards. 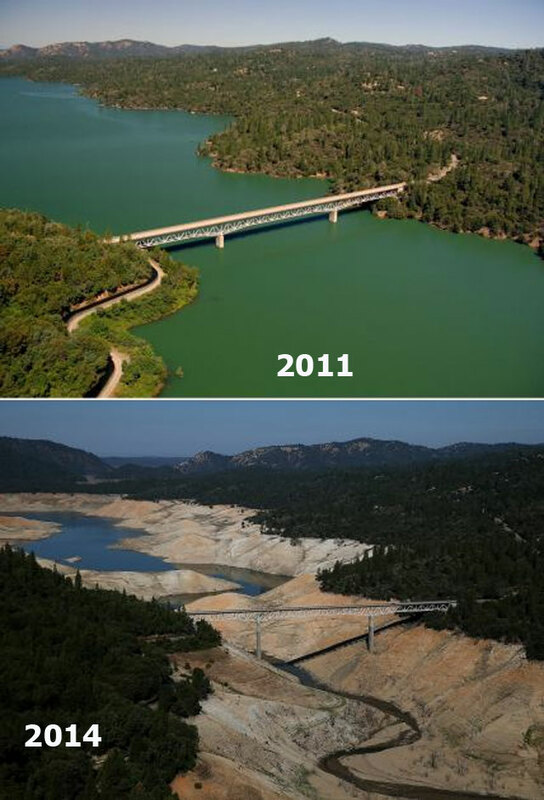 Case in point, Lake Oroville. Local marinas have receded into what little deep water remains and the section the Enterprise Bridge once crossed is now a frightening scene. The greenhouse effect produces methane gas in the atmosphere, thus causing the temperatures to rise. 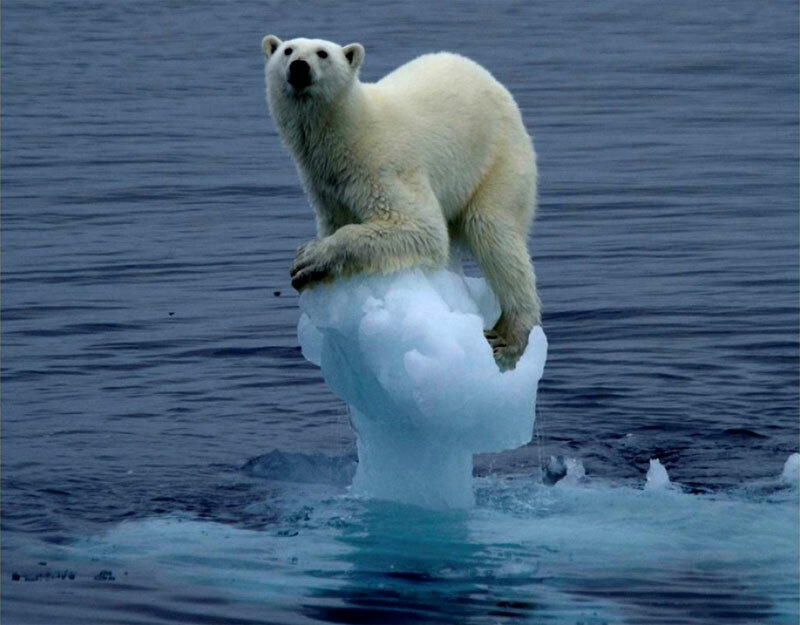 Thanks to this new heat wave, glaciers and ice sheets are melting at an alarming rate that is only accelerating thanks to the release of even more methane gas stored in the ice. 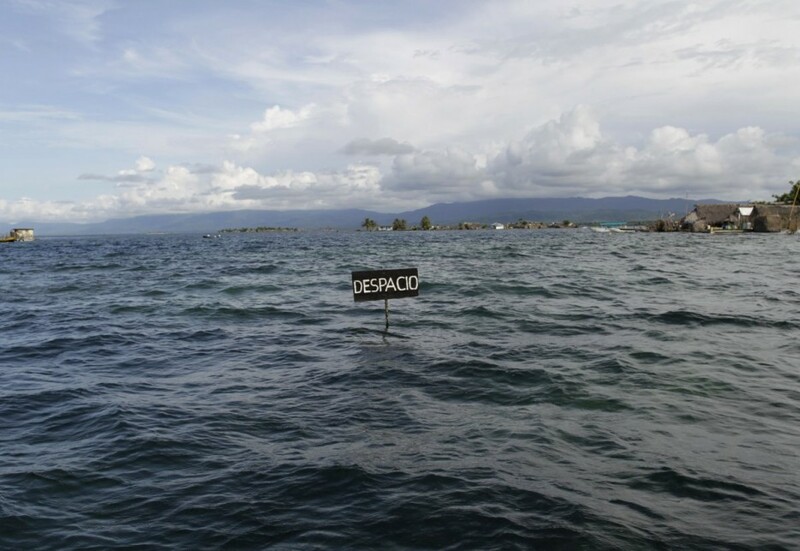 Thanks to the rising sea levels caused by the melting ice, islands and beach properties all over the world are beginning to be flooded. When all the glacial ice has melted, the estimated sea level will be 216 meters higher than it is now, swallowing countless coastal regions. While it may not seem populated at first glance, the polar regions of the world are home to a vast amount of flora and fauna unique only to this region. All of this biodiversity is slowly being lost thanks to human actions causing global warming. As the sea level rises, so does its pH balance. This means the waters across the globe are slowly growing more acidic thanks to the higher levels of carbon dioxide producing carbonic acid, which in turn causes harm to the wide array of marine life in the ocean. Due to the newly acidic water, coral reefs such as the Great Barrier Reef in Australia are being poisoned to death. The high levels of carbonic acid means that marine organisms such as coral, are unable to maintain their bone structures and are dying off. 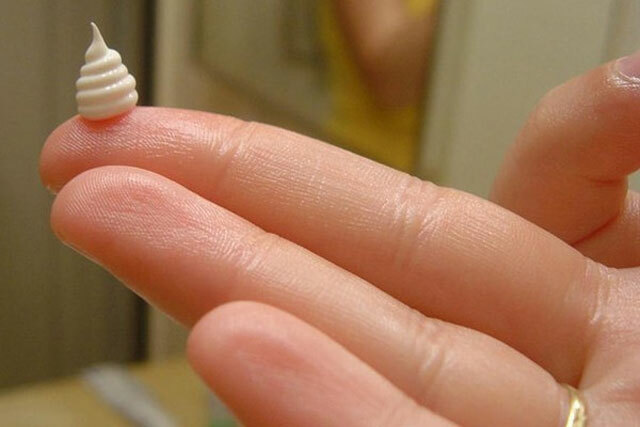 The acid levels aren’t only affecting the reefs in the ocean. 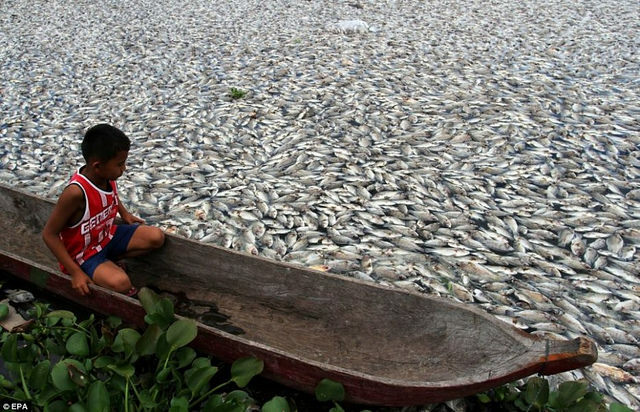 Millions of fish around the globe are unable to survive the acidic waters and many of them die before floating adrift in a sea of death. 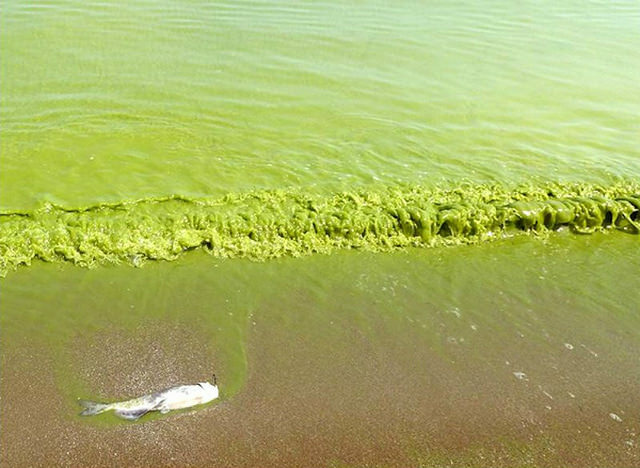 Over 500,000 people were left without water when Lake Erie on the border of the United States and Canada was polluted thanks to a rise in toxic algae. The source? Large amounts of chemicals and pesticides from crops being washed into the lake thanks to the rain. 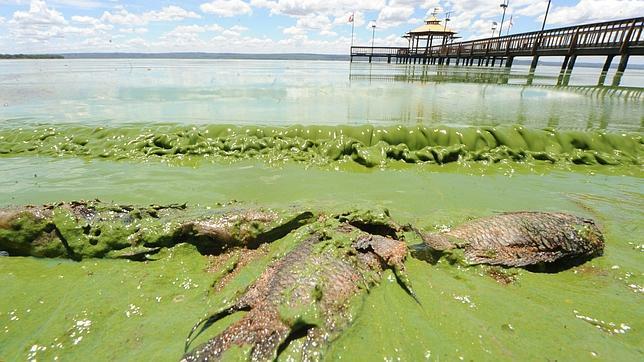 Pollution is also present in Lake Ypacarai in Paraguay, situated between the cities of San Bernardino and Areguá. In 2012, the blue water turned green thanks to toxic algae thriving in the polluted waters. 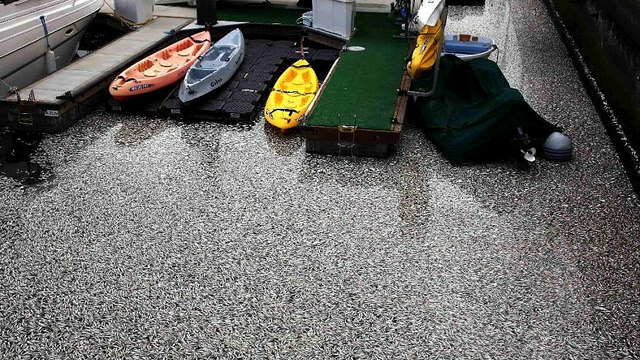 The chemicals come from local factories and tanneries that dump their waste into the lake. 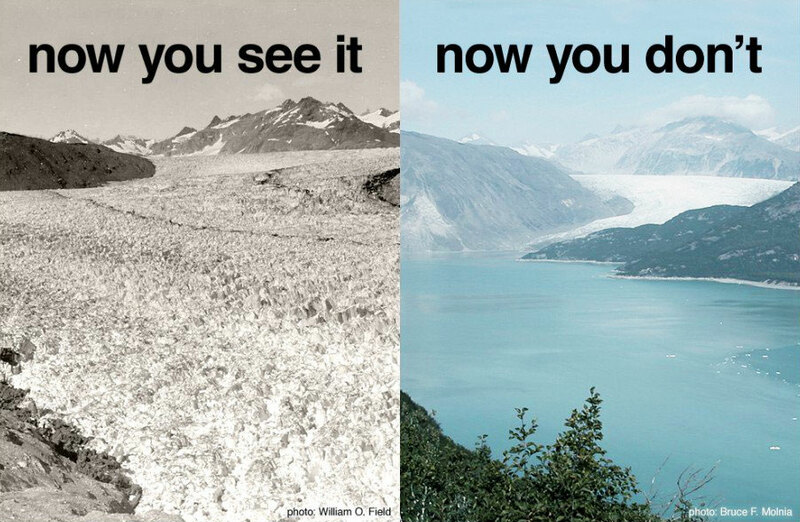 Water reserves and lakes aren’t the only things affected by the climate change. 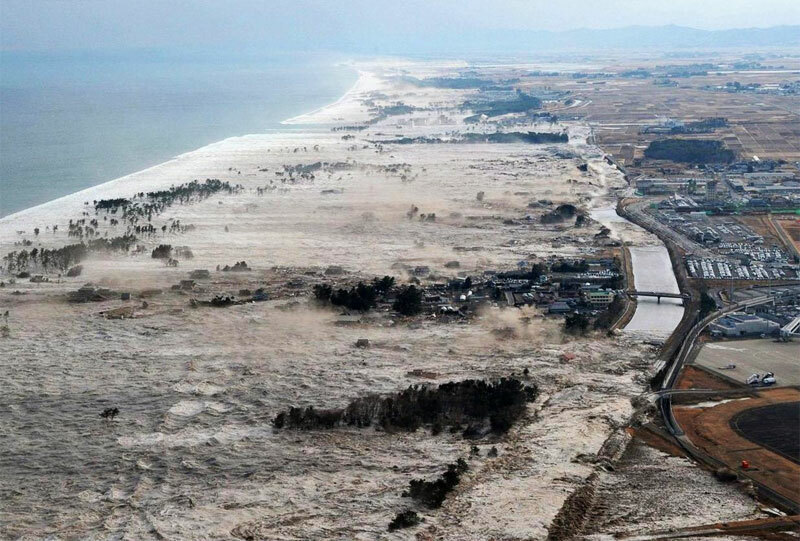 The Earth’s entire water cycle is experiencing a series of drastic and unpredictable changes, causing multiple natural disasters along coastlines all over the world. Strange and unnatural changes are starting to appear in rain cycles across the globe. 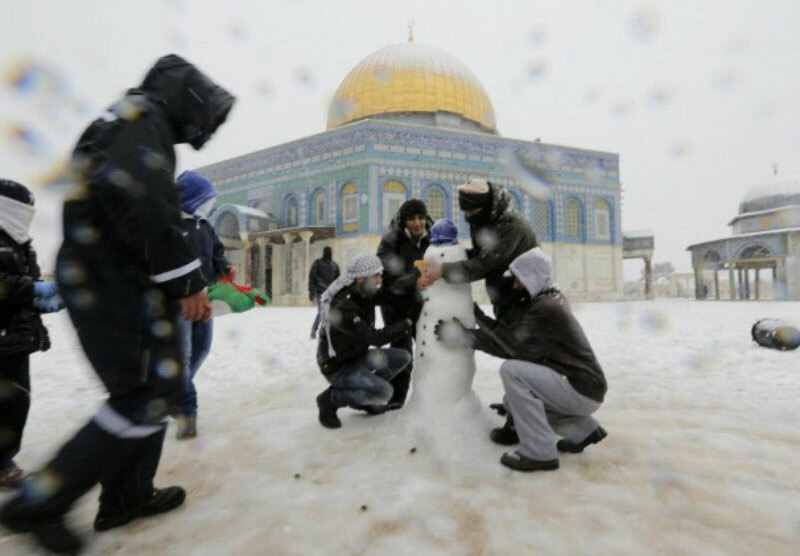 Even the more extreme climates have taken a hit, such as the uncommon snowfall that took place in Jerusalem in December 2013. Typhoons have been happening with more and more frequency in recent years and are steadily growing stronger. 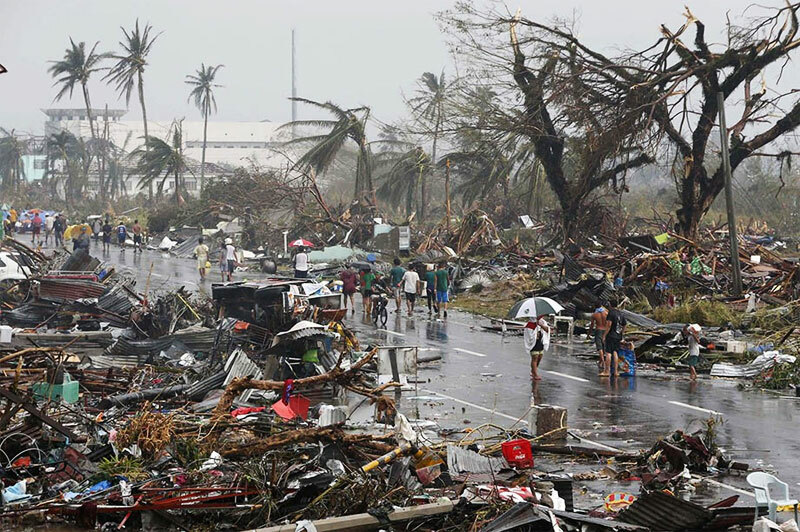 Super-typhoons are now starting to appear in the world, such as the super-typhoon that passed through the Philippines and left behind more than 10,000 deaths. Dust storms are common phenomena in many parts of the world, but they are beginning to spread and affect other regions. 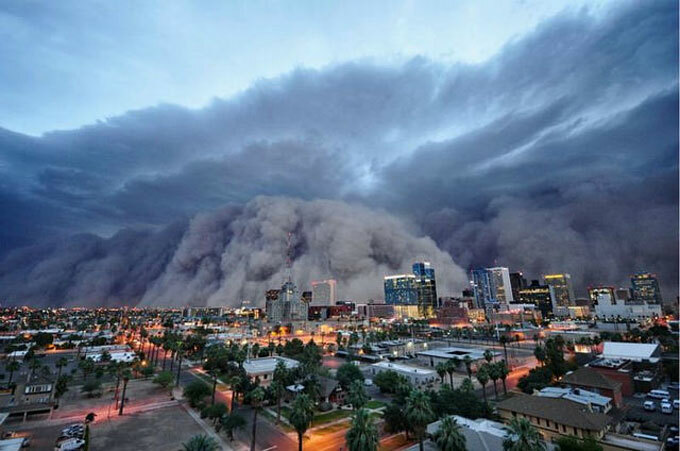 Thanks to a combination of droughts, high winds and indiscriminate deforestation, dust storms are beginning to affect urban areas and large cities. The dramatic effects of climate change means that many regions have either a shortage or an excess of precipitation. 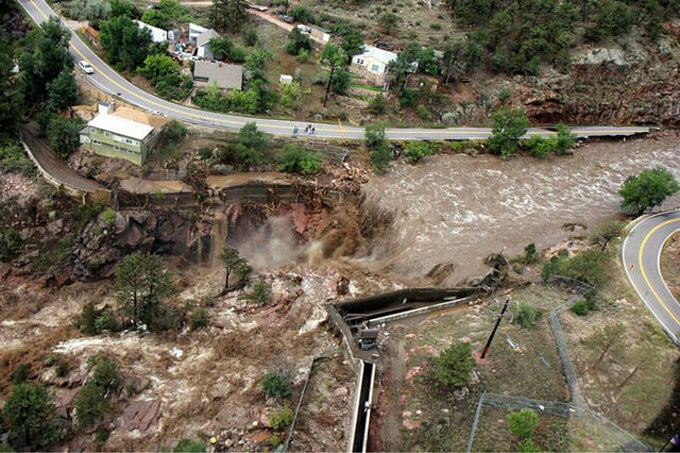 Excess water causes massive floods, one of the most common natural disasters in the world. 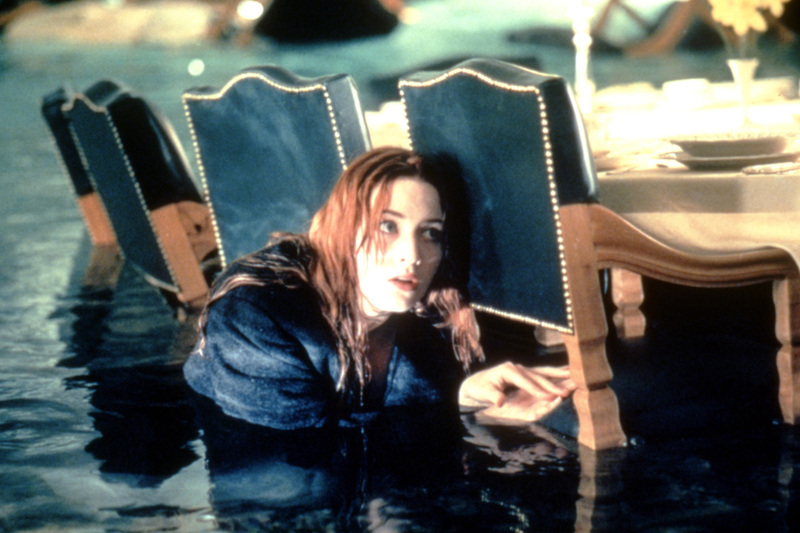 It’s estimated that over 3.2 million people died due to flooding during the twentieth century. In 2012, a tropical depression formed in the Atlantic. 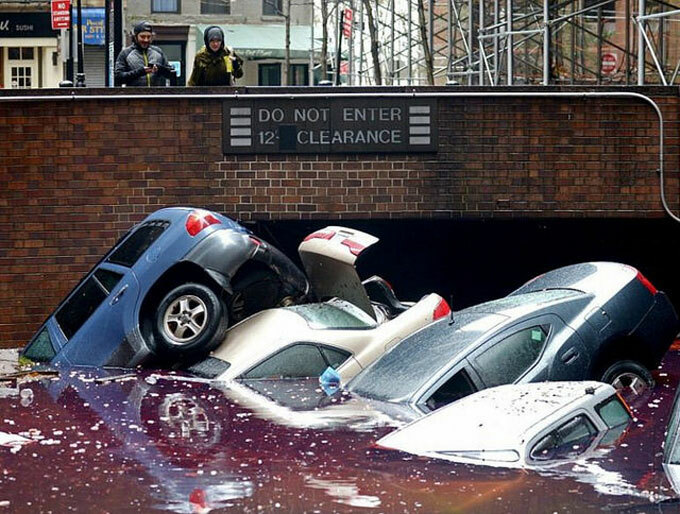 The depression grew into one of the largest hurricanes in the Atlantic on record, Hurricane Sandy. At a terrifying 1100 miles across, the hurricane swept across North and South America, causing the most damage from a hurricane since Katrina hit. In 2005, Hurricane Katrina formed over the Bahamas before crossing Florida and building strength in the Gulf of Mexico. Katrina quickly moved north while reaching winds in excess of 175 mph. The hurricane caused over $108 billion dollars in damage and thousands of lives were lost. 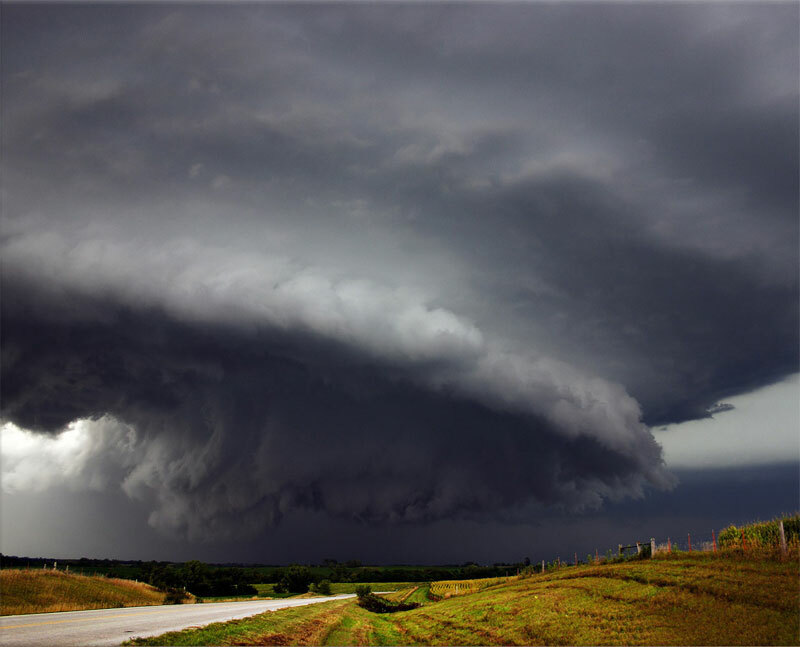 Huge storms with rotating wind patterns are the most likely to cause tornadoes, and thanks to the drastic changes in weather patterns, more and more of these terrifying funnels are appearing across plains and urban areas all throughout the Western hemisphere. 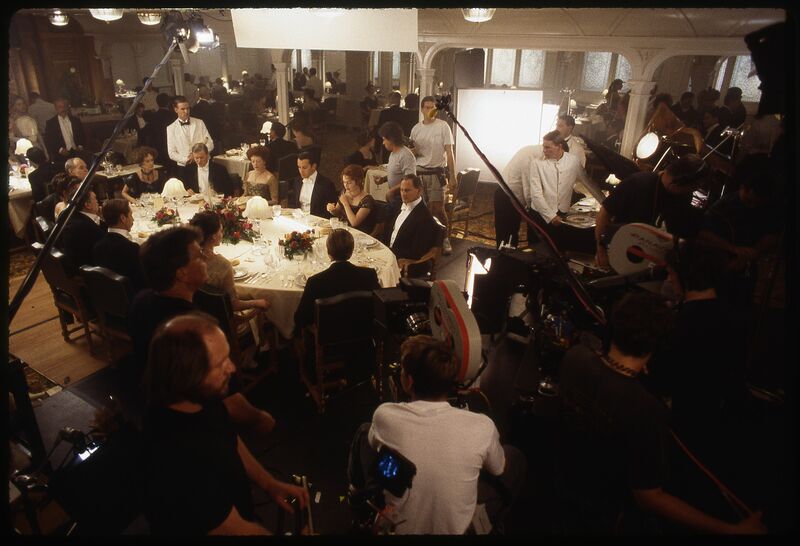 Watching the Titanic continues being as exciting as it was the first time it was realeased in the movie theaters, making everybody cry, laugh and feel worried, and it doesn’t matter how many times you’ve watched Jack and Rose fall in love and dying for it, you’ve never seen these photos that we are about to show you. 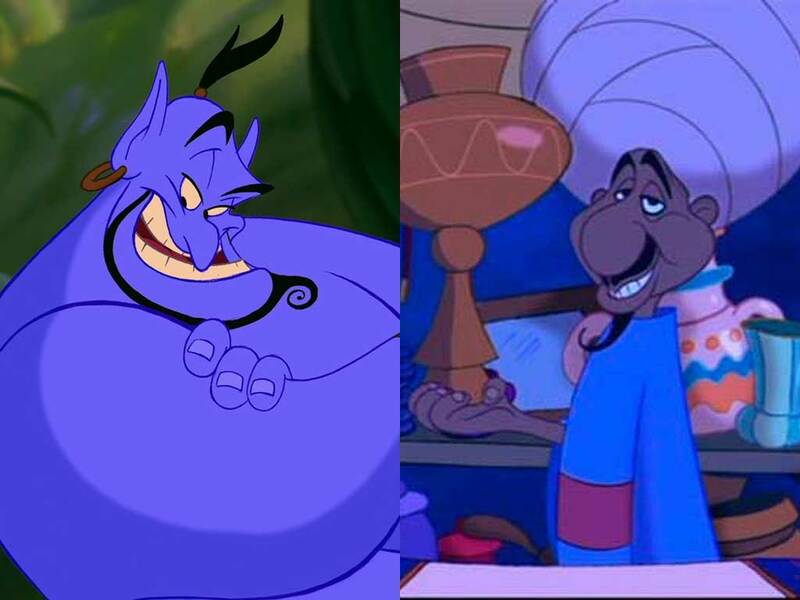 This is where magic dies. 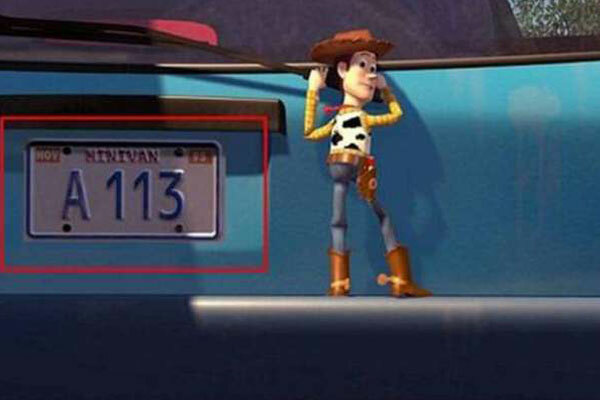 Jack's character claims to have skated over the Lake Wissota, but that artificial lake, wasn't even created yet (until 1912). 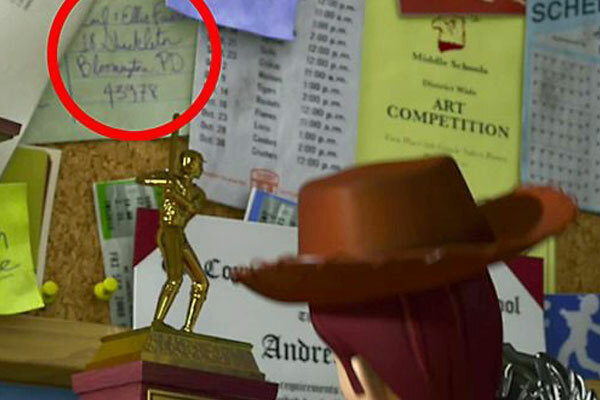 On the other hand, the thing that Rose gives to Jack when he is about to draw her, has the profile of Franklin Delano Roosevelt, American president of 1933 to 1945. 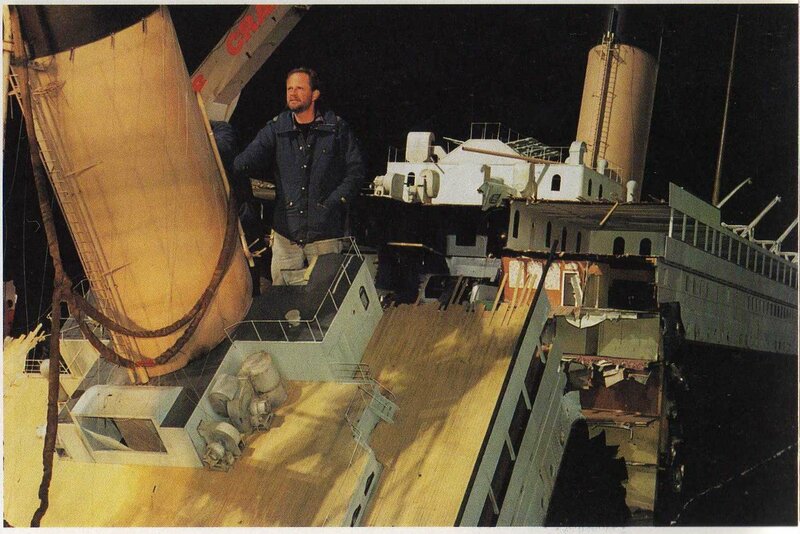 Titanic won a total of fourteen nominations, as Joseph L. Mankiewicz did with All About Eve (1950), and reaped eleven statuettes, matching William Wyler's Ben-Hur' (1959) record. 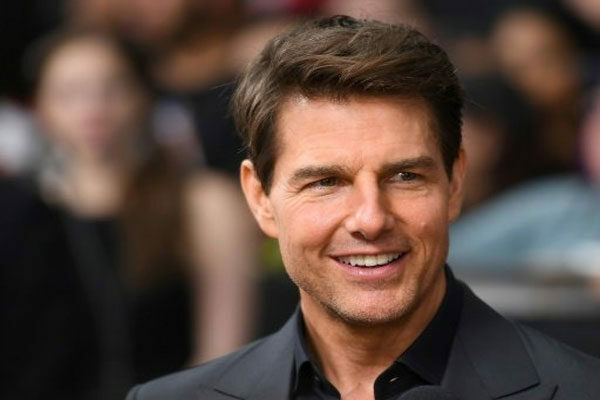 Kate Winslet was nominated but didn't win the statuette (Helen Hunt took it with 'As Good as It Gets') and Leonardo DiCaprio was not even nominated, which caused a deep sorrow in the actor. 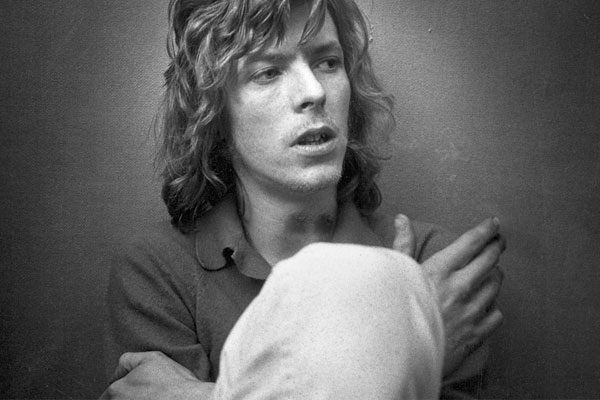 From that moment, he tried to take his career very seriously and to stop being an idol for young girls. 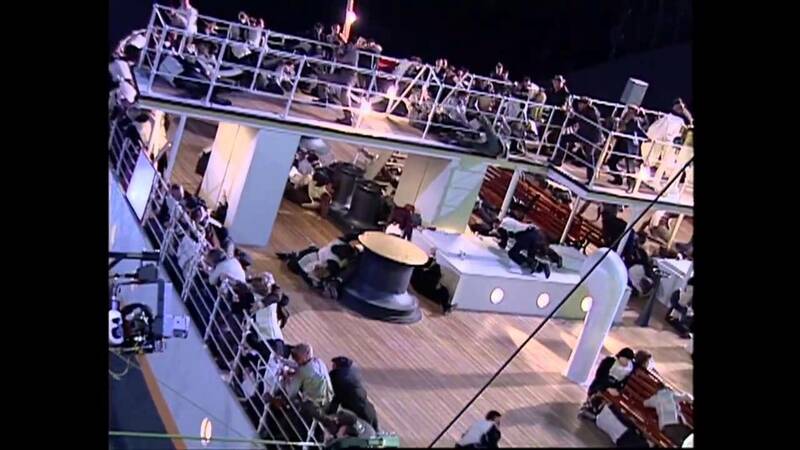 The Titanic hosted 2,243 passengers, and only managed to rescue 705. 60% of the first class survived and 44% of the second. Only 25% of the third. There weren't enough boats, so the total of people rescued were 1,178. In the story that the mother tells to her two children before the water swallows it belongs to the Irish folklore. It evokes the country of Tir na nog, which means the country of youth and eternal beauty. 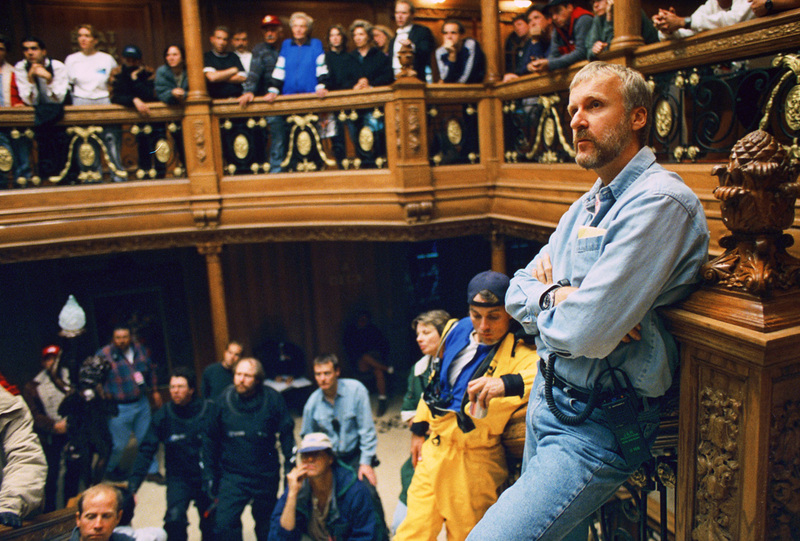 James Cameron used numerous testimonies that the survivors provided. Among them is the phrase that a father told his two daughters in one of the lifeboats: "Let's say goodbye, until i see you in a little while." 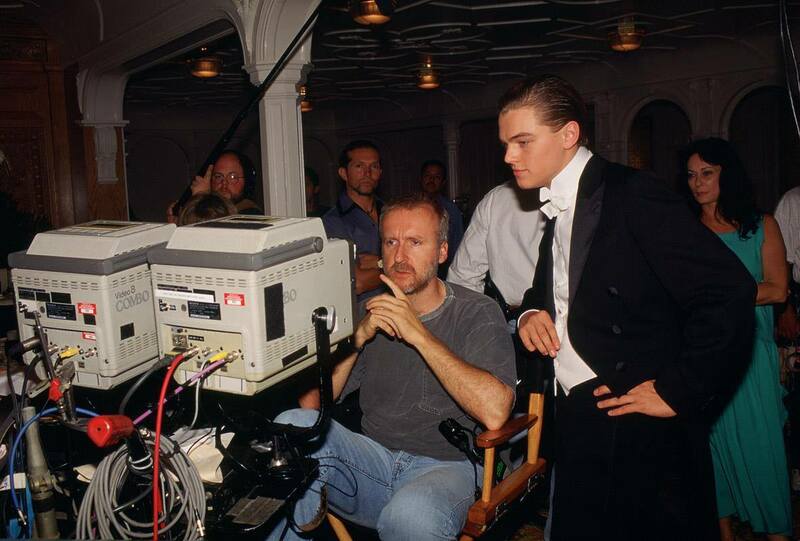 All of Jack's drawings were made by James Cameron himself. Also, they are even his hands that appear when you see them in the train draw Rose. 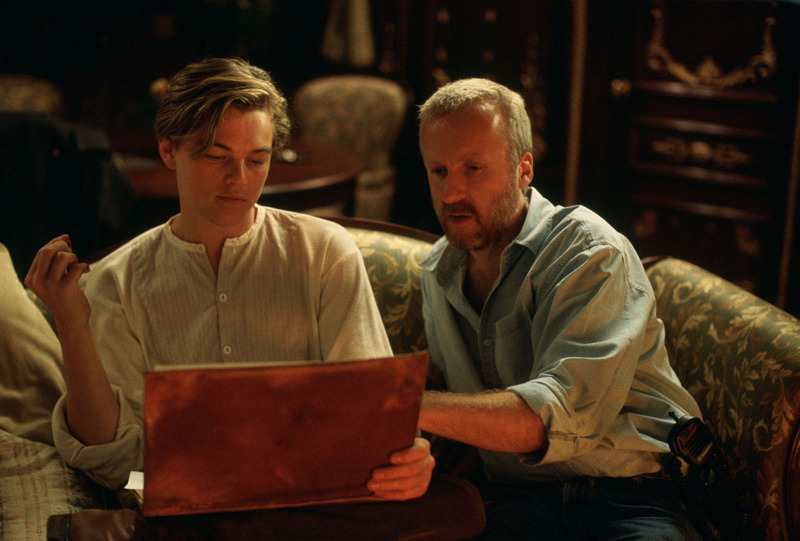 The scene in which Jack draws Rose, was for the director the most intimate of the film. 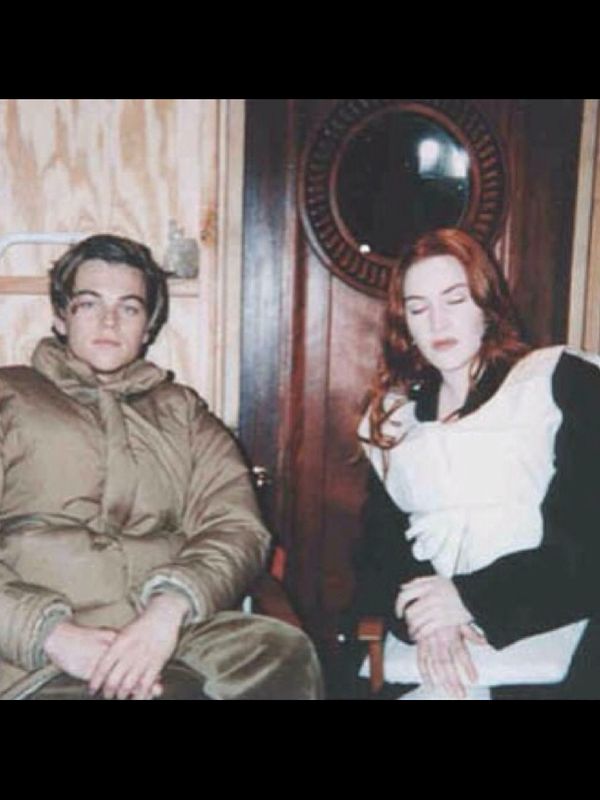 It was the first performed together by Leonardo DiCaprio and Kate Winslet, and the purpose was to break the ice between them. The scene in which a child is seen playing with a top with his father, was shot from an image taken by a photographer who got off the boat on the scale that they did in Ireland. The father and child survived the shipwreck, although the child died a few years later because of a car accident. 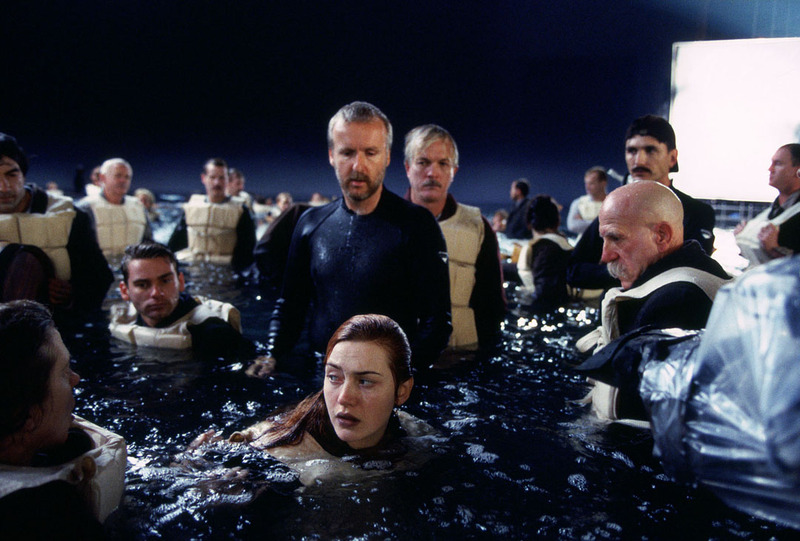 James Cameron let Leonardo DiCaprio and Kate Winslet improvise the scene in which Rose thanks Jack. "It's a very complex scene. We spent two or three days improvising, working that scene step by step before I rewrote it taking some of their considerations." 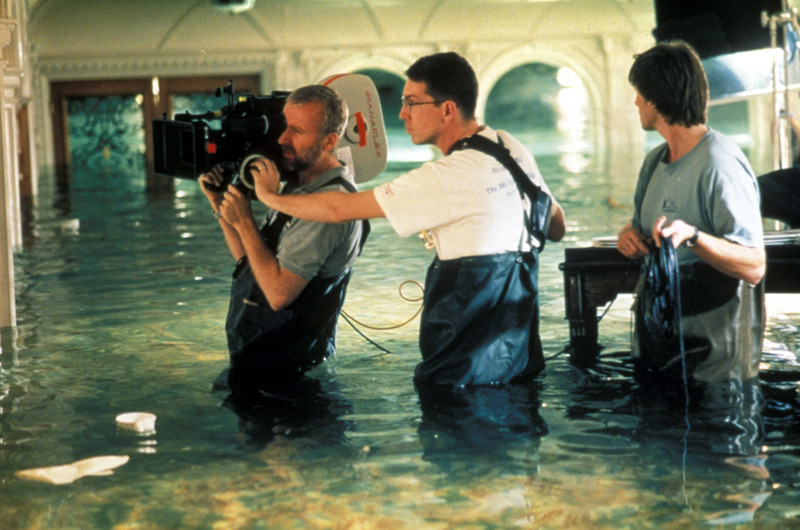 The director also mentioned his actors at the time of making the copy that he pronounced shortly before the final shipwreck: "Jack, this is where we will meet." 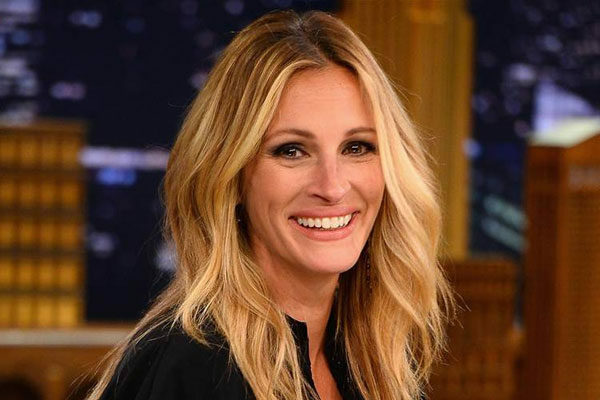 He also suggested spitting in the face of his fiance, instead of punching him with a hairpin. Room B52, 54 and 56 booked by Cal (Billy Zane), really existed. 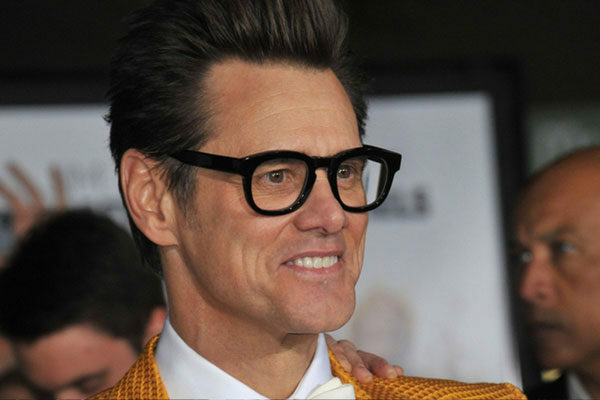 They were rented by a New York billionaire named JPMorgan, who canceled his reservation shortly before leaving. In the end it was the patron of the White Star Line, Bruce Ismay (played in the film by Jonathan Hyde), who occupied this space. 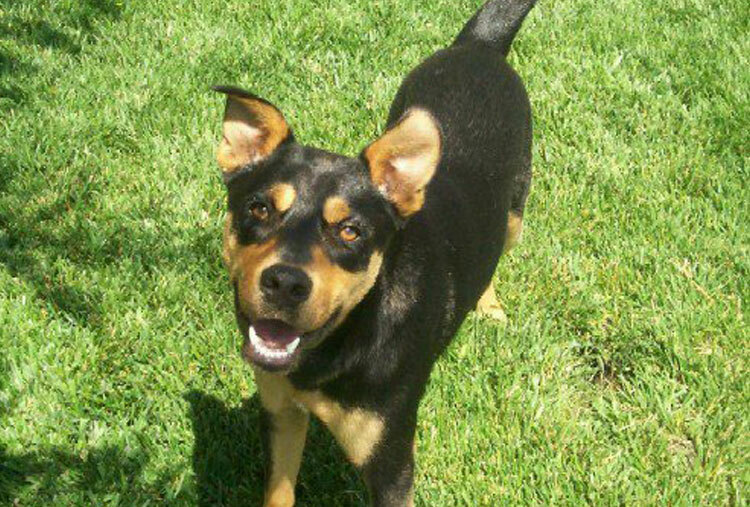 Rose's puppy was from the breed of one of the three dogs that survived the catastrophe. 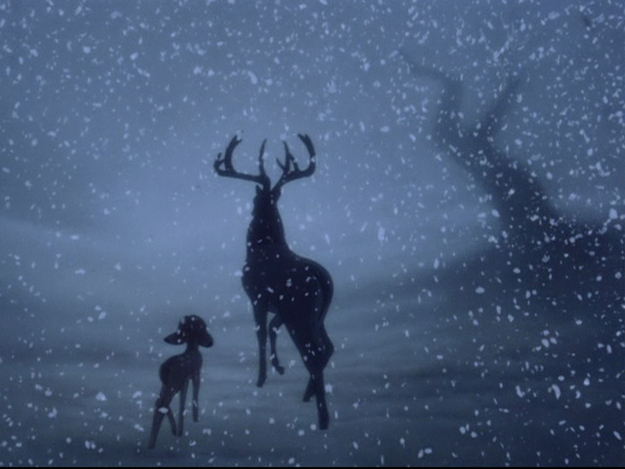 One of the deleted scenes showed how a passenger freed the animals as the ship sank. Both actors and extras, followed courses led by Lynne Hockney, who taught them how to behave according to the customs of the time. Hockney also produced 'Titanic Etiquette', a traveler's guide broadcast during filming explaining the manners of the early 20th century. 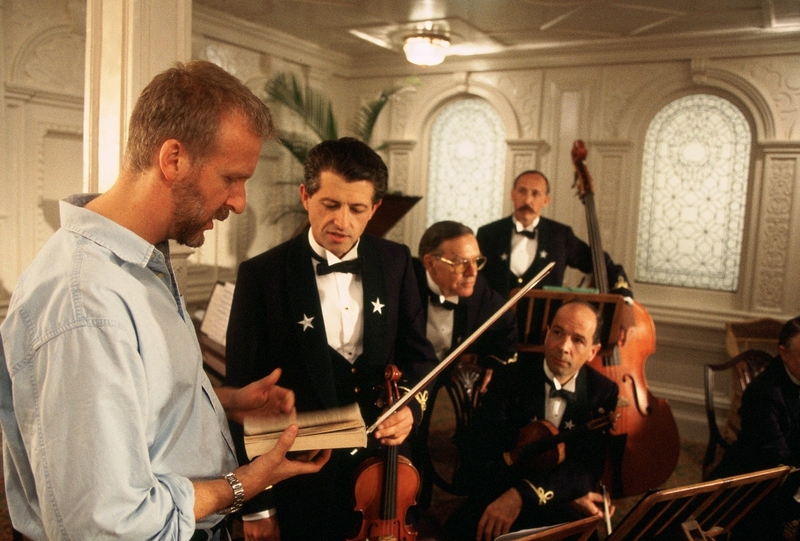 James Cameron didn't want 'Titanic' to have a lead song. 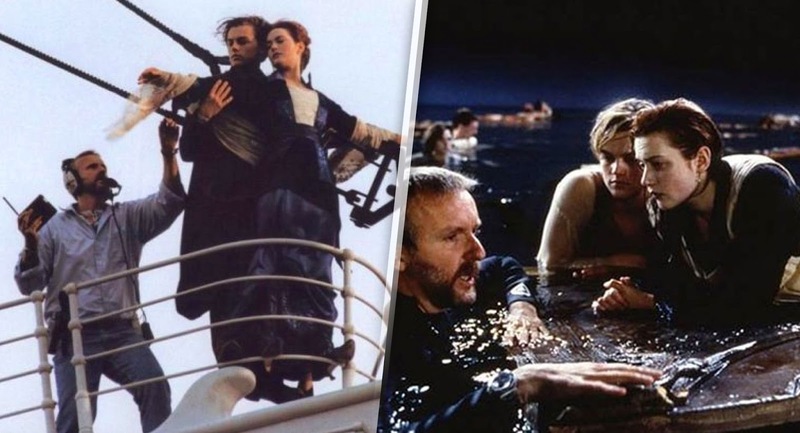 But James Horner was sure that the song he'd written with Will Jennings, "My Heart Will Go On", would work. 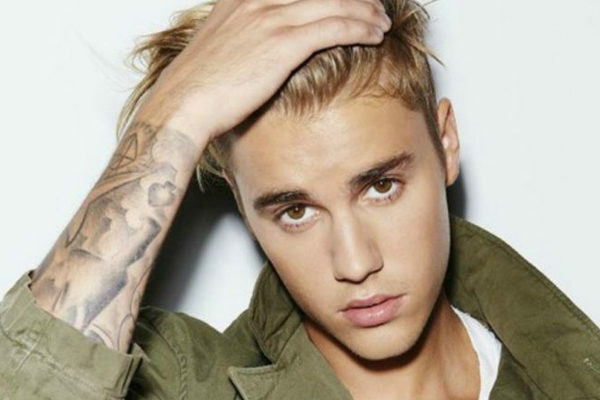 So he recorded the song secretly, in a model with Céline Dion. Actress Gloria Stuart began her career in 1932 under the directions of John Ford in 'Men Without Women'. 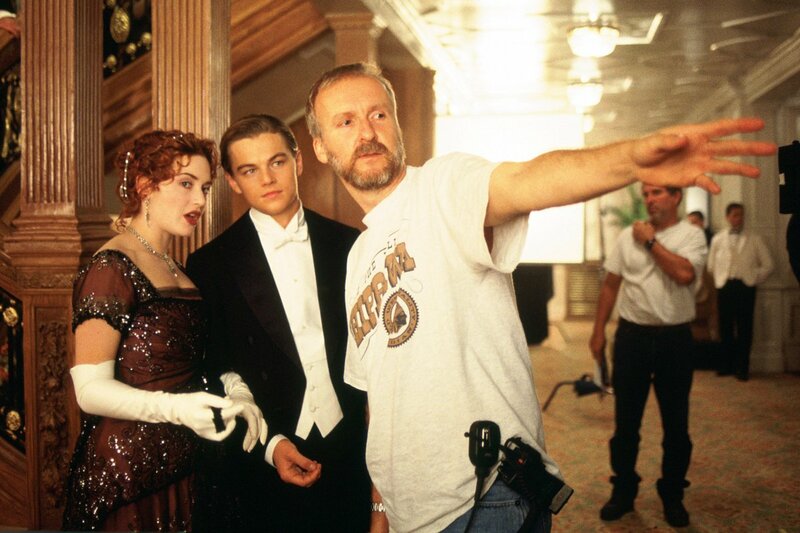 During the course of the movie 'Titanic', Rose describes herself as "poor rich girl." Precisely Gloria Stuart starred with Shirley Temple the movie 'Poor rich girl' in 1936. 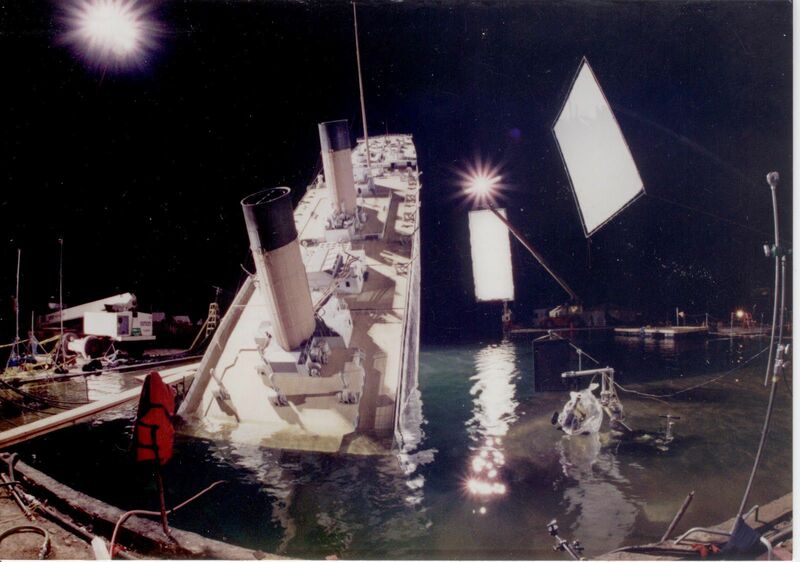 Several scenes from the film are very similar to those filmed by Roy Ward Baker in 1958 in 'The Last Night of the Titanic'. Among them, the scene in which Thomas Andrews tells Bruce Ismay that the ship will sink: "It is a mathematical certainty. 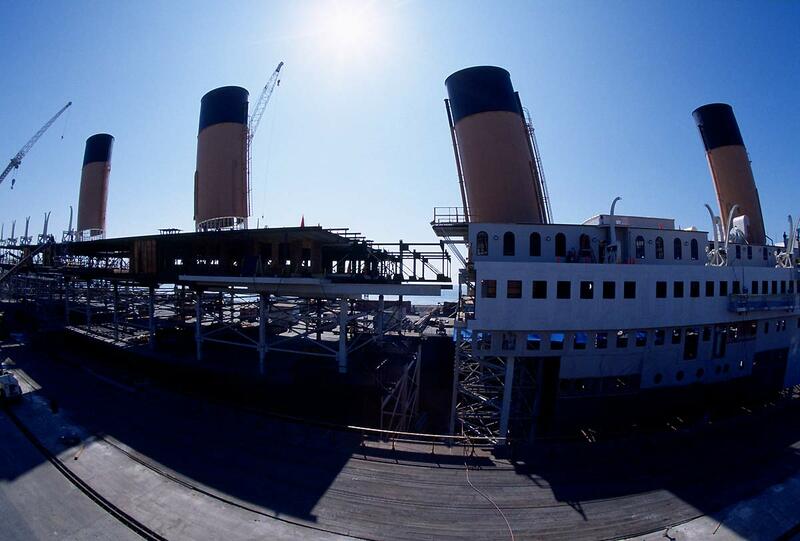 The legendary Titanic sailed on April 10, 1912 from the dock of Southampton (England) and, after making several stops, sailed the ocean at full speed to New York. On the night of April 14, 1912, at precisely 11:40 p.m., the transatlantic crashed into an iceberg that tore the ship for completely. 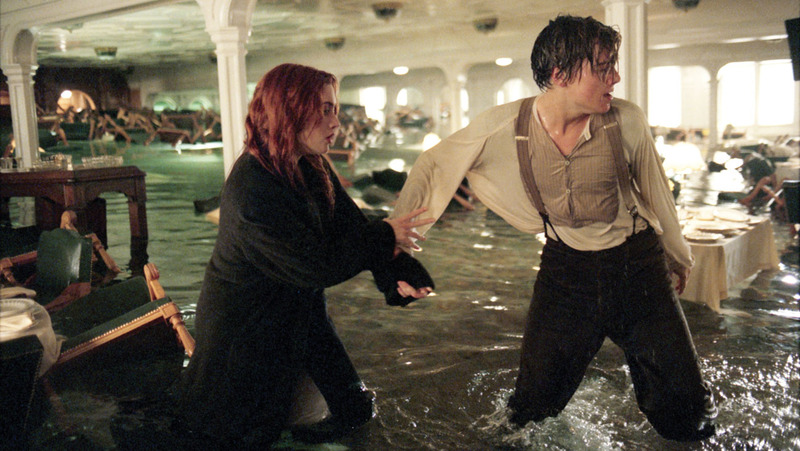 Let's see Titanic over and over again! In less than three hours later, at 02:30 am on April 15, it lay in the bottom of the North Atlantic sea the ship and more than 1,500 people lost their lives. Dogs are perfect companions because they’re friendly, fun, spontaneous, and they’re also incredibly patient. They adjust easily to new surroundings and they’re very protective of their owners, they’re easy to take care of, and the best thing of all is that they’ll always be there for you! 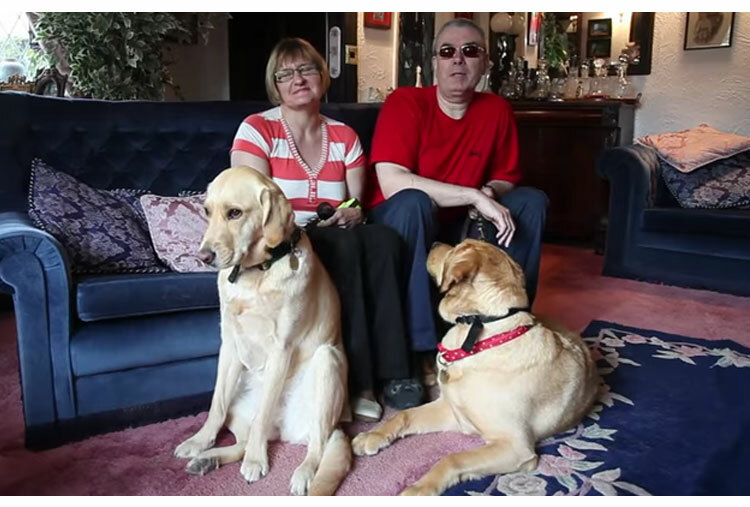 These guide dogs met during their training and became inseparable, thanks to them their owners met and got married! 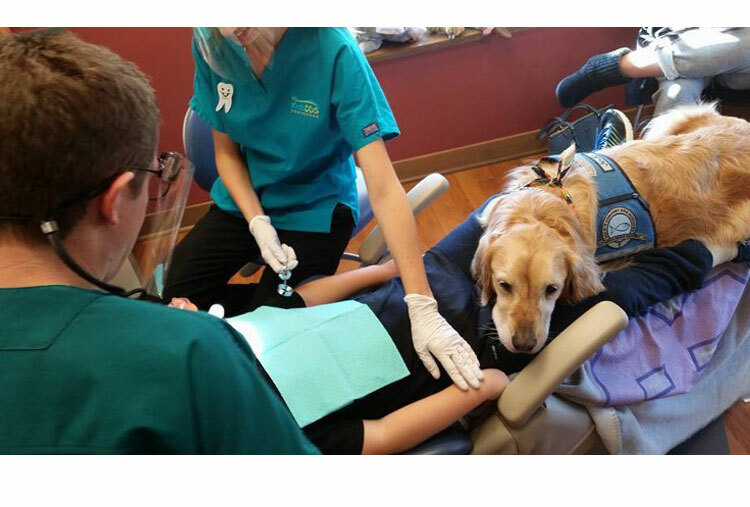 Jo Jo is a six-year-old Golden Retriever, who in the last couple of years has been helping this dentist calm down the nervous patients. Jo Jo’s owner Lynne Ryan came up with the idea to help the youngest patients during their dental treatments. 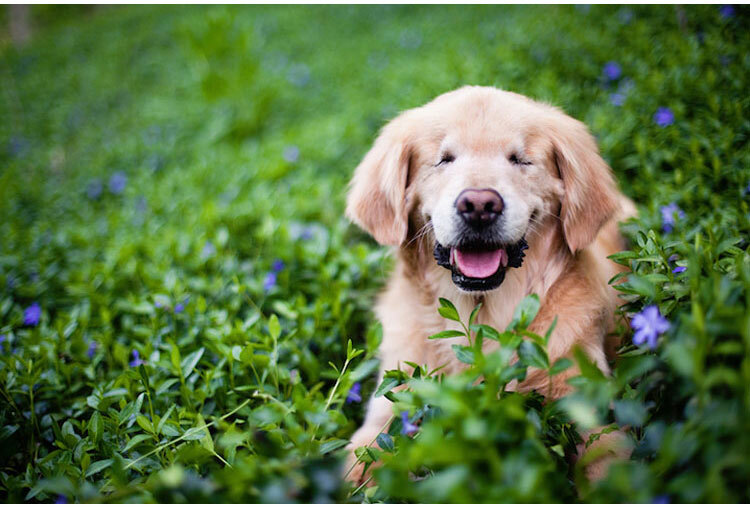 Smiley is a Golden Retriever who was born without eyeballs and spent the first years of his life in a breeding kennel. Despite having a rough start, Smiley now belongs to a family and helps people with mental disorders and disabilities during their therapies. 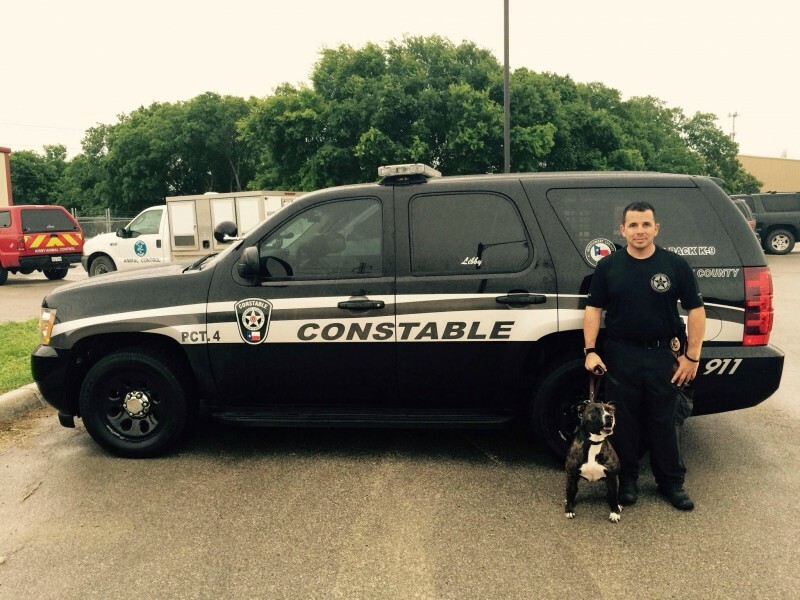 This dog saved a 6-year-old from a snake! 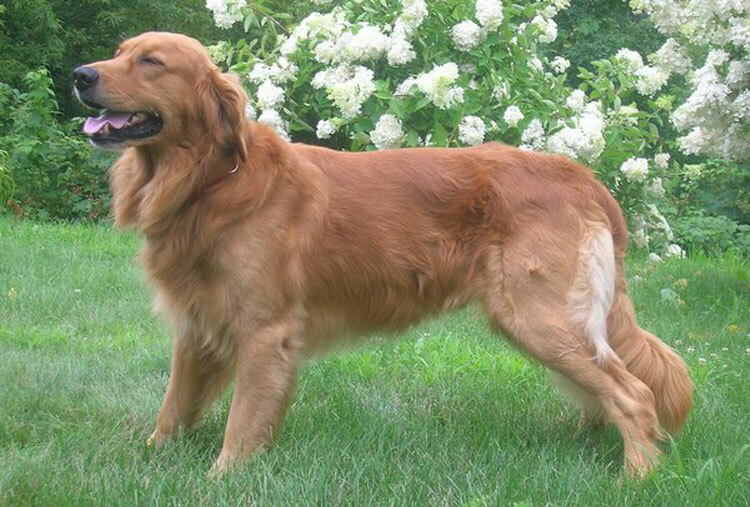 Brutis was a 7-year-old Golden Retriever when he became a hero. 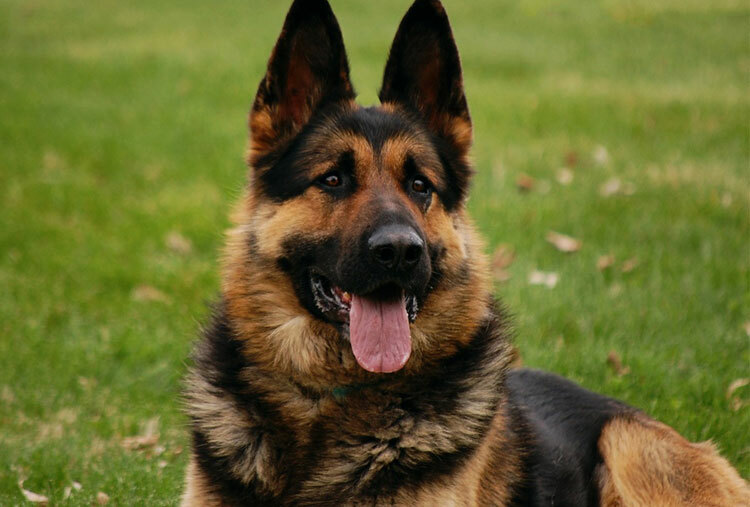 He stopped a snake from attacking a little boy and got bitten because of this, but thanks to his heroic and brave act he got the canine national medal. 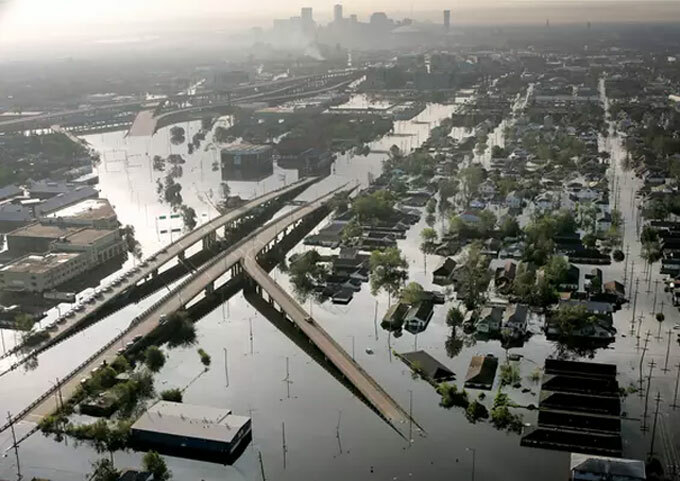 Hurricane Katrina was a devastating event for the southern states. 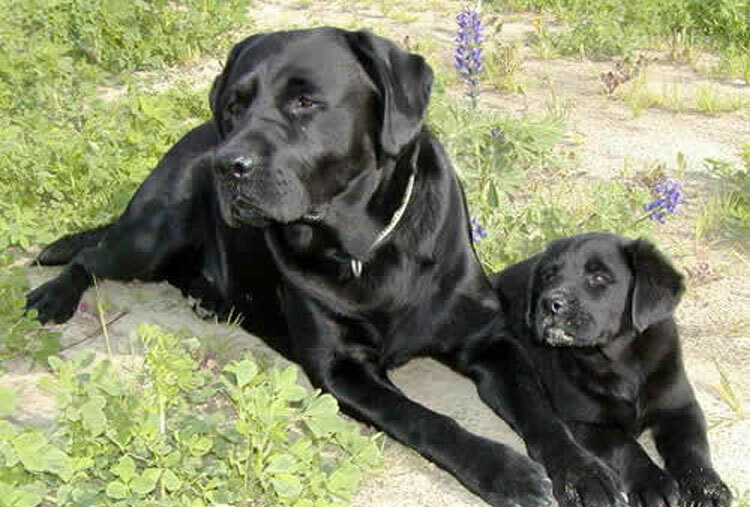 But Katrina a black Labrador Retriever saved a man from drowning before it was too late. This was definitely a very heroic act! This cute dog rescued her owners, (an elderly couple) when she found them stuck in the snow. She dug out a tunnel in order to pull the couple back to the safety of their home. 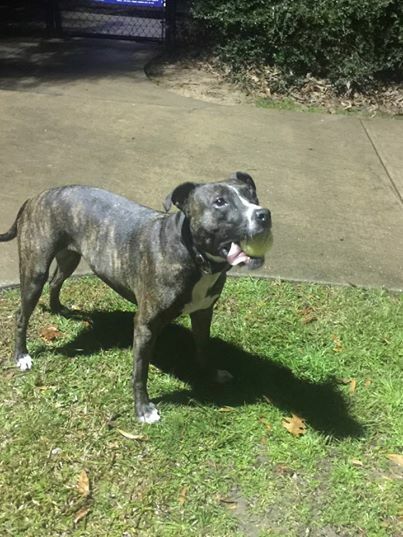 This dog named Maya saved her owner when a man was trying to attack her. 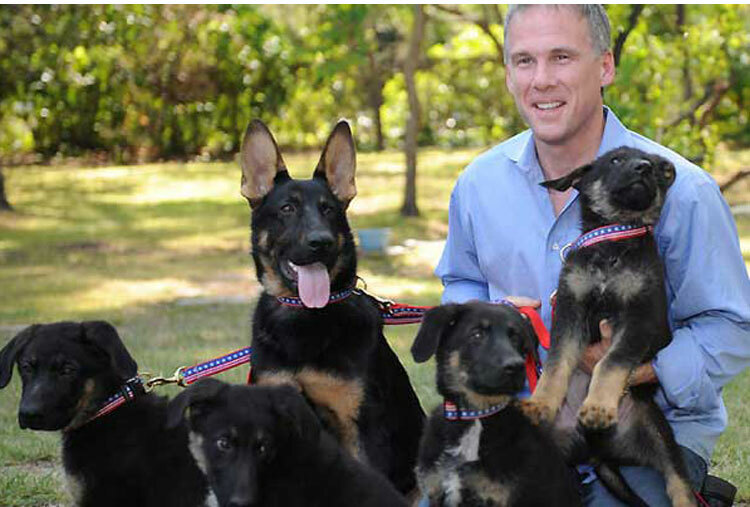 Maya got the “Dog of the year award” in 2008 for her bravery. 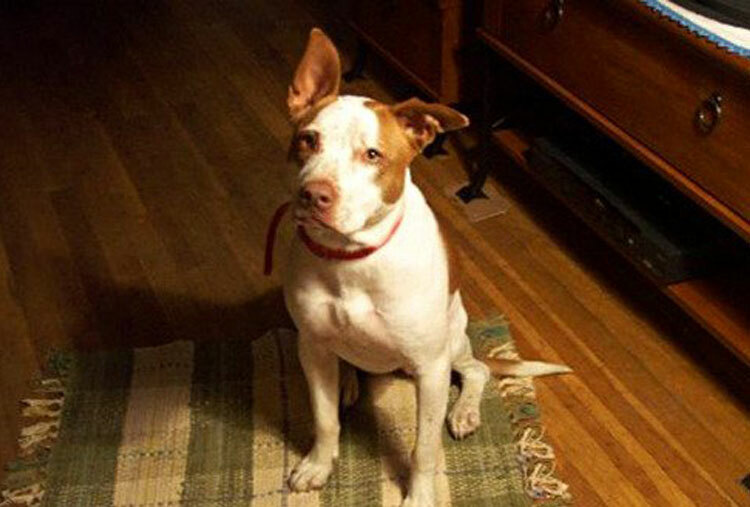 When an armed man broke into his owner's home, this dog didn't hesitate and immediately attacked the thief, he shot the dog, but he left the house without hurting anybody else. Luckily this furry hero recovered from the attack. This cute little dog helps brighten up the kids’ day at the hospital. 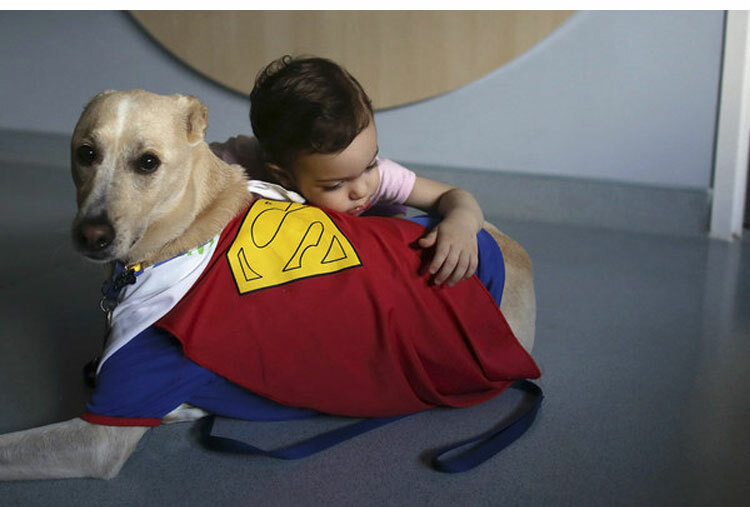 Dressed up as a superhero, he keeps the kids company and helps them relieve some of their pain. He’s a real superhero no doubt about that! This dog named Trakr, helped officer James Symington, dug a 9-meter tunnel to help rescue victims of the World Trade Center tragedy in 2001. 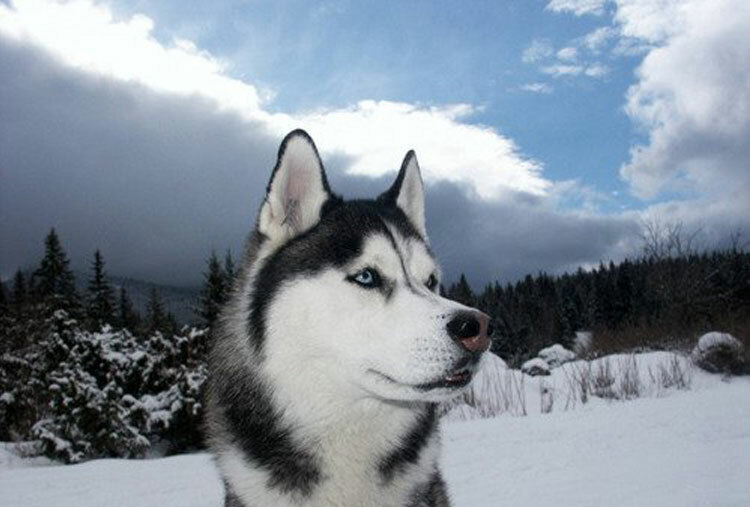 Neo is a Siberian Husky who became famous after getting help for his owner. 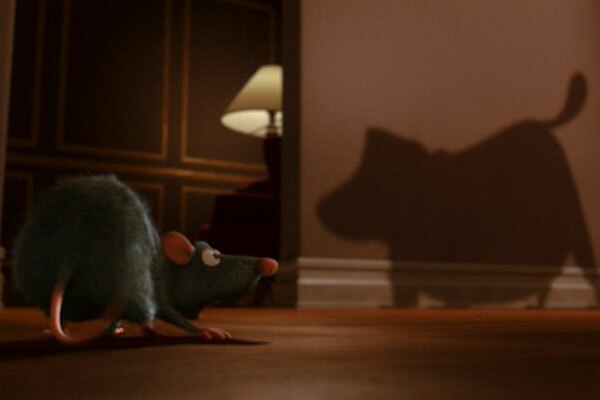 While she was suffering a hypoglycemic attack, Neo ran towards the closest building so people noticed something was wrong, and they followed him to the place where she was. 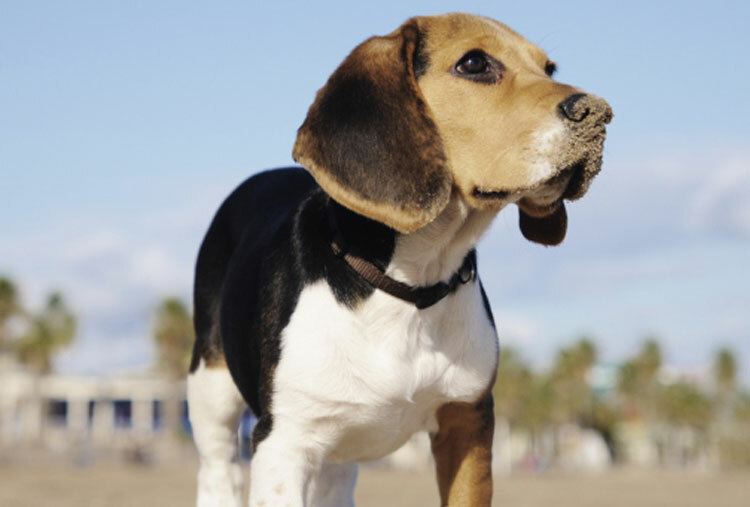 This Beagle literally dialed 911 when his owner was suffering a diabetic attack. Of course, he had already been trained to do that in the case of an emergency, but he definitely knew how to handle the situation. 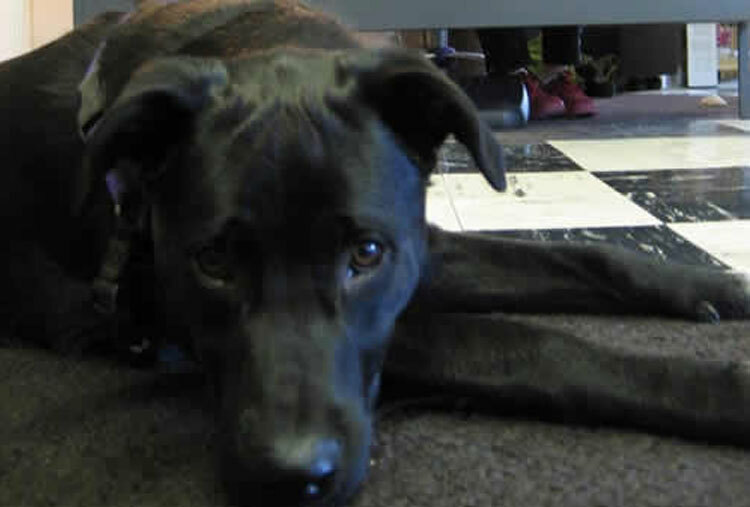 When this dog’s owner was surrounded by fire and smoke, she couldn't find the way out so Nyla bravely guided her to the exit door. How brave of her! When his owner was stuck in the 78th story at the World Trade Center on September 11th, this dog named Roselle saved his life. The building was on fire and the air began to fill with toxic smoke, so this dog guided his owner to a safe place before the building collapsed. What a clever dog! 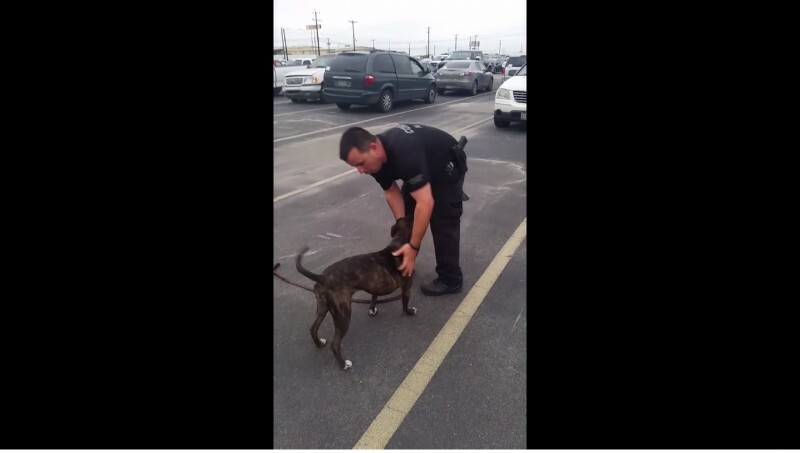 This dog saved a woman’s life after she was reported missing a few days before. On his first mission, Kaze found the woman in a coma, underneath a bridge. According to the Police, if Kaze hadn’t found her, she would’ve been dead in less than an hour. 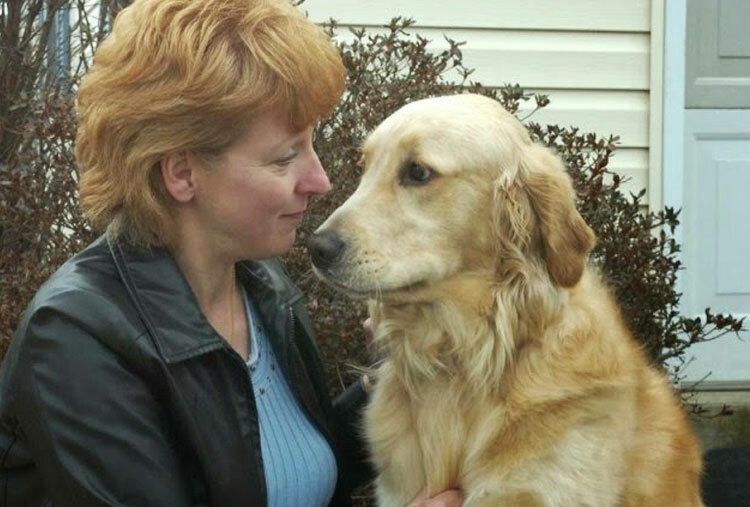 Patty saved her owner from drowning during a duck hunt. After the boat they were on turned over in the North of the Atlantic, this little dog allowed his owner to grab her tail while she was vigorously swimming against the current, towards the closest shore. 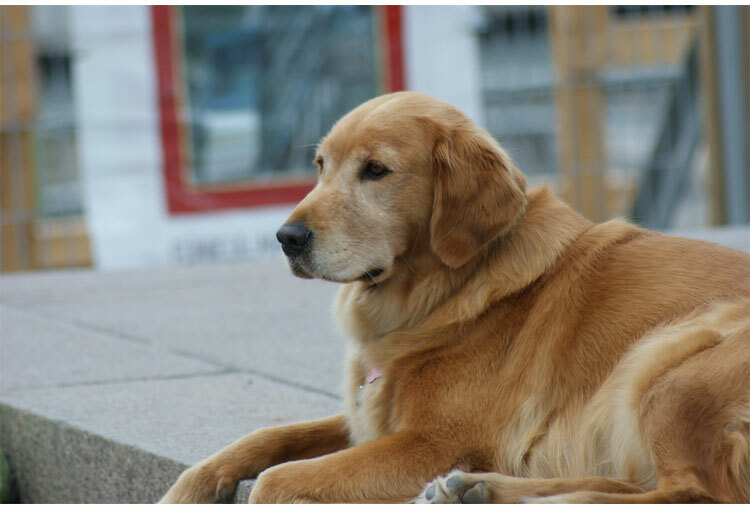 Toby is Golden Retriever who saved his owner from drowning while eating an apple. 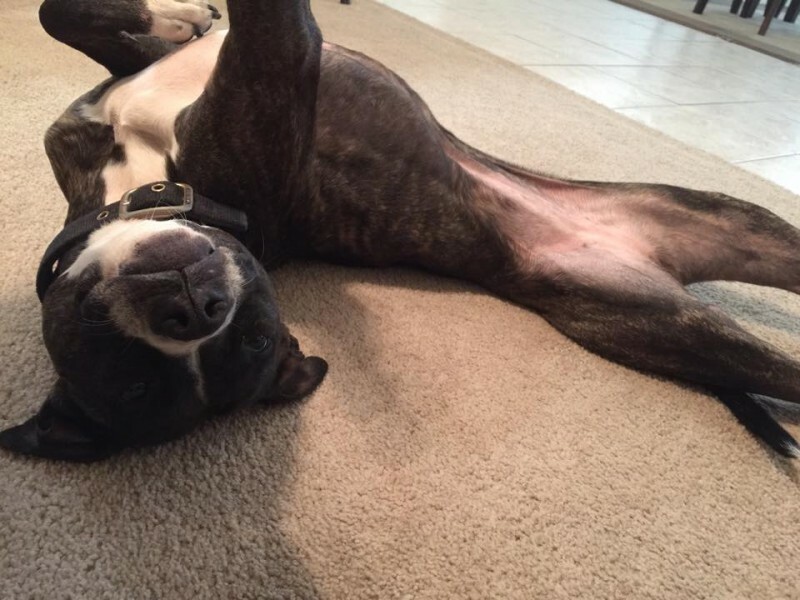 When it was too obvious that she was choking, the dog started jumping on her chest until she got the piece of apple out of her throat. 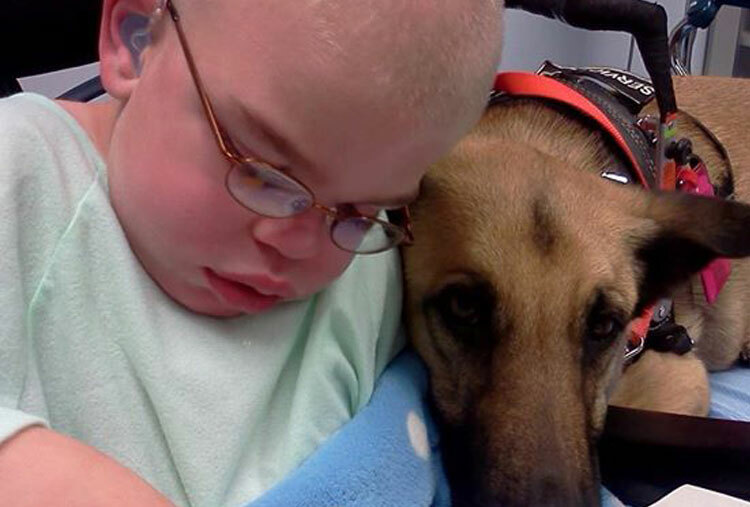 The parents of this kid were told that dog therapy was not appropriate for him. 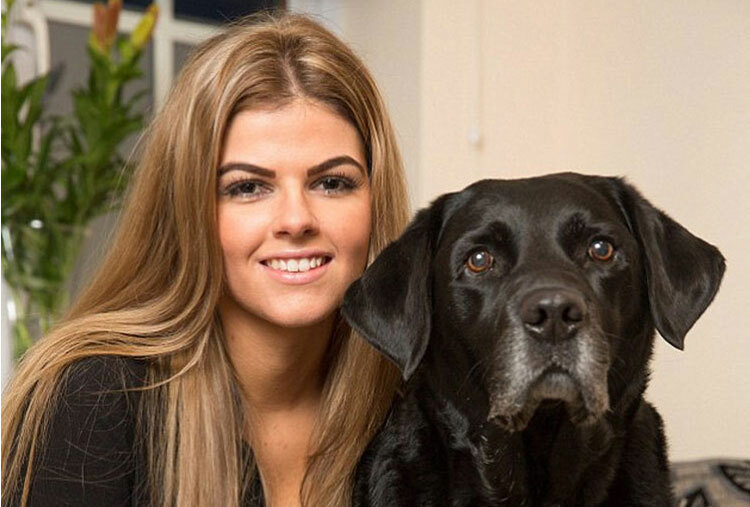 But this clever dog proved them wrong. 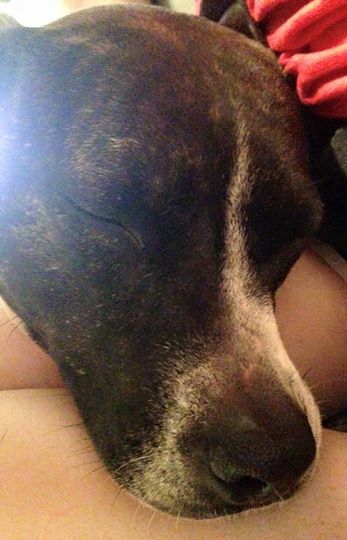 Without a doubt, this proves how strong a bond between a human and a dog can be. 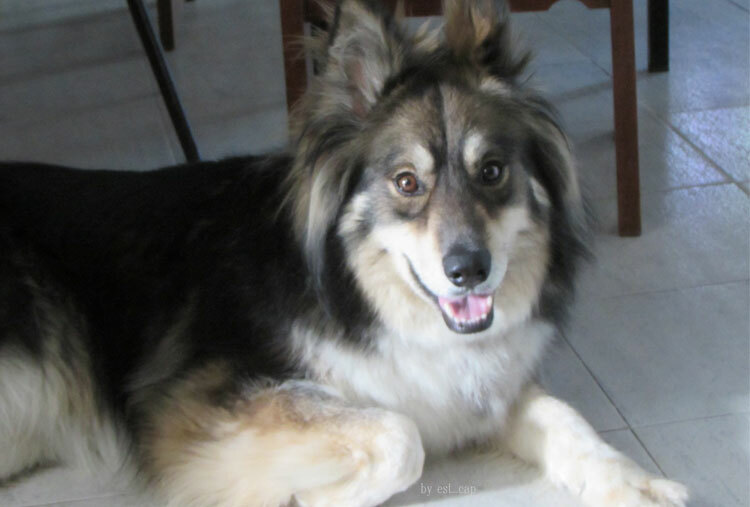 His owner was declared dead for about 30 minutes after suffering a heart attack. 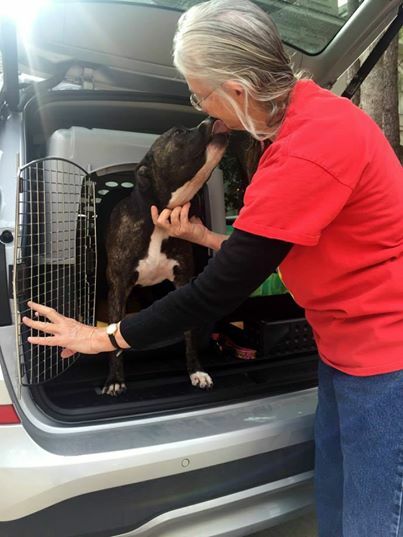 But she was saved by the dog when he started howling for help. 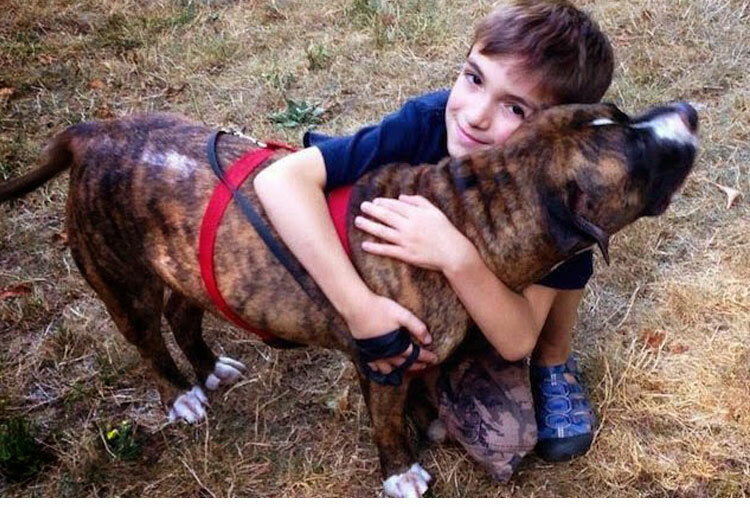 An eight-year-old was saved from a deadly bee attack by a Pit Bull. The dog grabbed the kid by the pants and took him to a safe place, away from the bees. How brave of him! 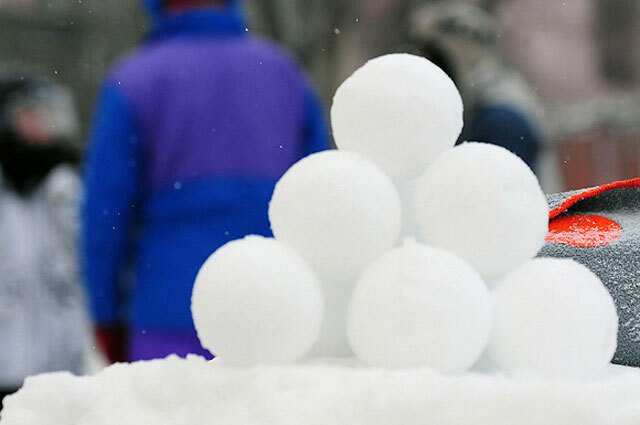 Some people are crazy about winter and ever more crazy about the circumference of the snow ball. 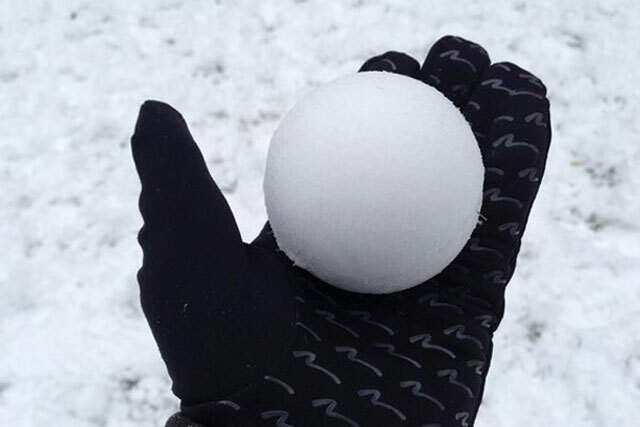 They create a perfectly circular ball with no dents in it before crushing it in their hand. 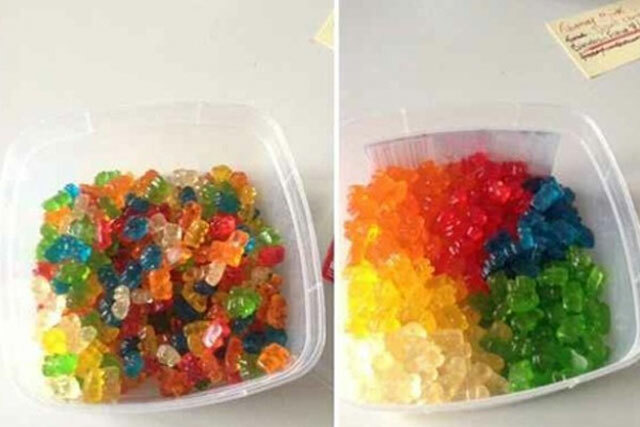 Some people have the compulsion to organize everything they eat, even gummy bears. 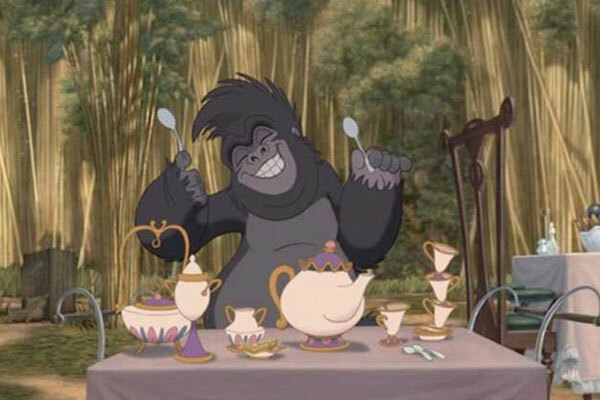 That includes placing food groups in different categories on their plate. That also means creating extremely detailed nutrition or eating plans. Cooks can easily slide into the realm of OCD. 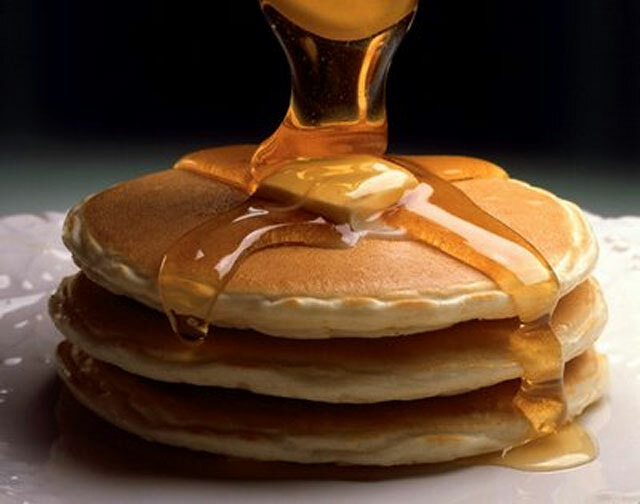 Creating perfectly circular pancakes is an obsession of many cooks, even though the syrup messes things up once it is on the plate. 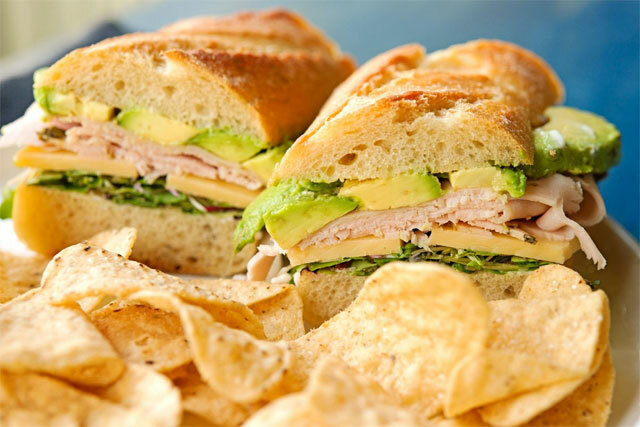 Getting the bread, the meat, the lettuce, mayo and the other toppings in line and perfect easily becomes an obsession. The millions of different sand which combination also creates endless ways to innovate on this type of obsession. 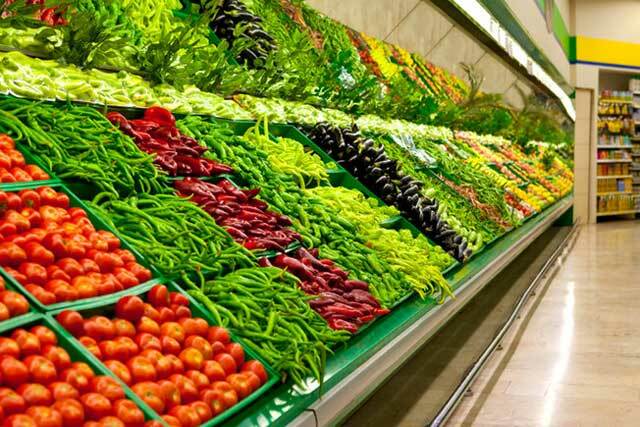 Organizing colored produce is an obsession for many people. 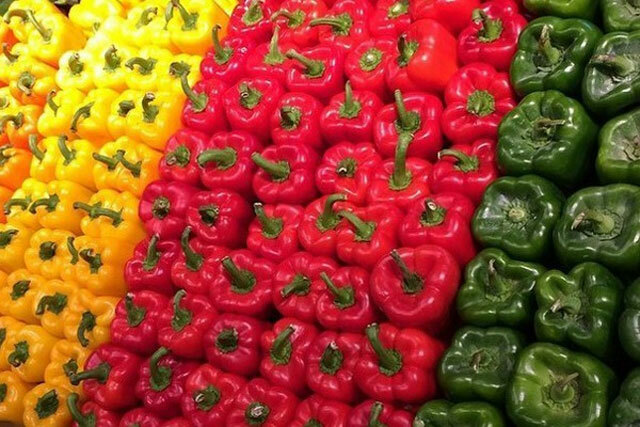 As bell peppers have a stark color and the same exact type of vegetable, they are an appealing item to organize. That also extends to the lunch or dinner plate. 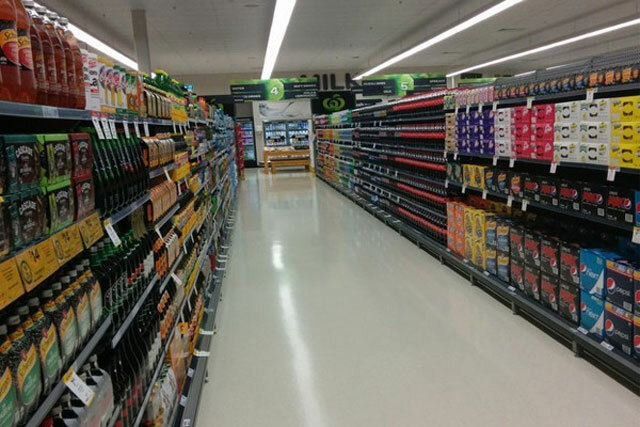 The super market aisle is perhaps the most multi-varied section of any retail store. 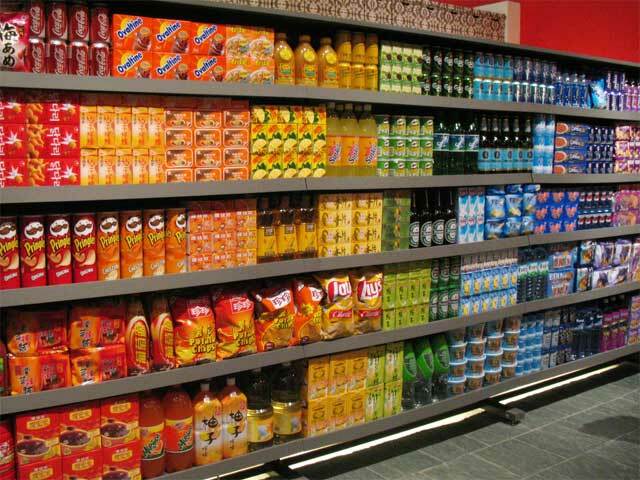 Each aisle has hundreds or thousands of products in need of detailed organization, which is perfect for and obsessive. They really have to have people with OCD in supermarkets, I don’t think many people have enough time to sort each aisle in this way so symmetrical and almost with the best color match. Definitely this is something that will be ruined after they open the doors. Similarly, bars are the most varied area of any restaurant. 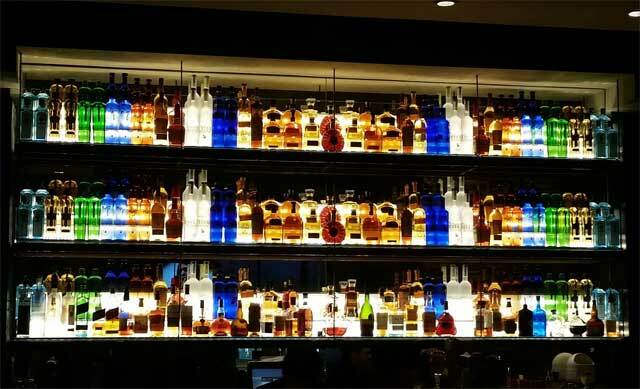 There are thousands of different types and brands of alcohol, all with their own look and feel. 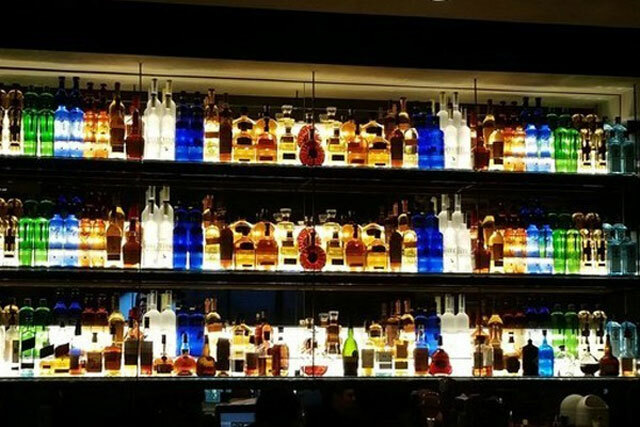 As a result, obsessives can spend hours organizing a good bar. Marks on a page are common places that interest obsessives. 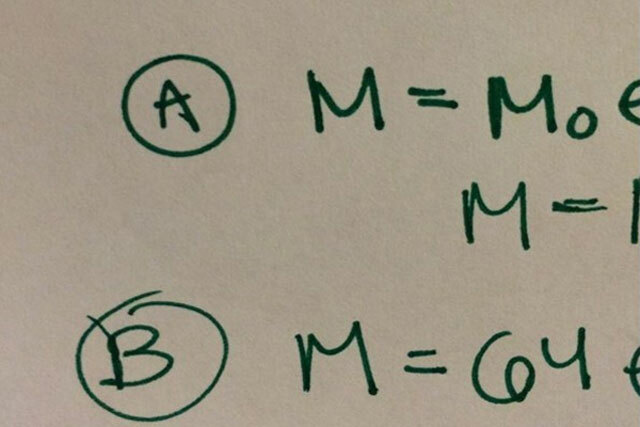 The perfect circular mark on a page of home work is a good place to start. 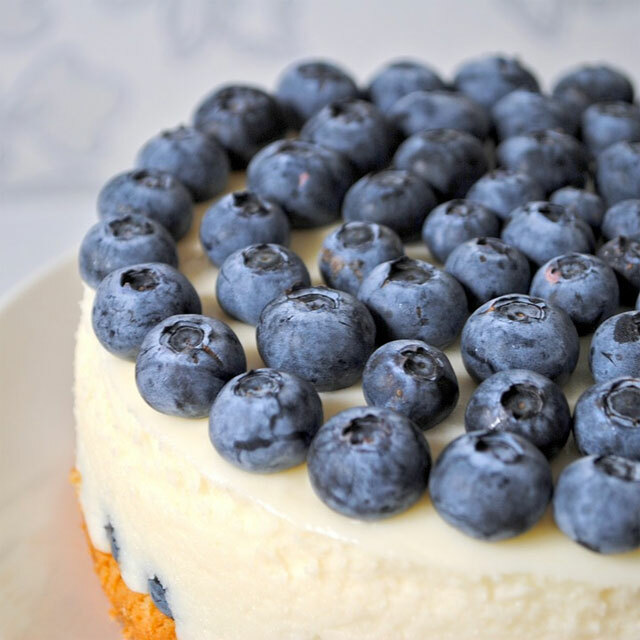 Baking is another type of cooking that is easy to become all encompassing. 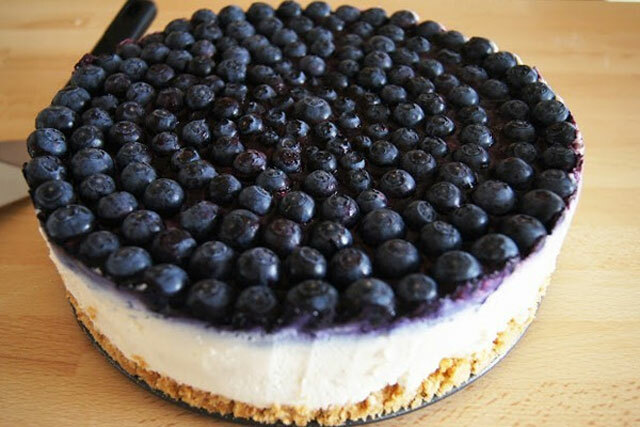 Some people find the perfect circular blueberry cake the most interesting thing they can spend their time on. 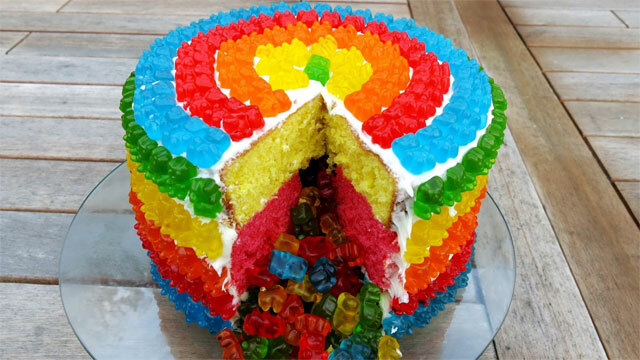 No matter what the cake, they can find an interest in making it perfect. 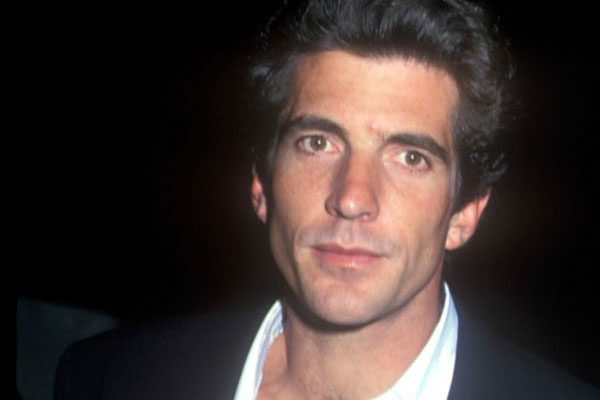 Cleanliness and hand moistorization are common hangups for people with OCD. Some people enjoy putting moisturizer on their hands, their arms, their face, their legs and their feet every fifteen minutes. The result can be quite a mess. Architecture is both the process and the product of planning, designing and constructing physical structures or buildings. Over time, it has evolved thanks to new ideas, innovations, and technology. 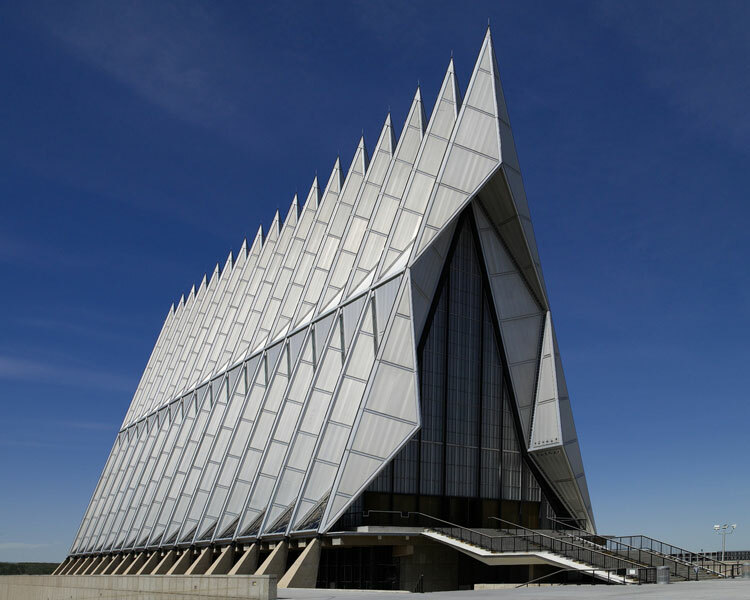 In the past, architects built gothic buildings made of concrete and stone. Nowadays, designers try to minimize and optimize building materials. Either way, architectural works are often perceived as cultural symbols and works of art. In this post, we’ll share with you the coolest and bizarre buildings in the world that look like they belong in comic books. 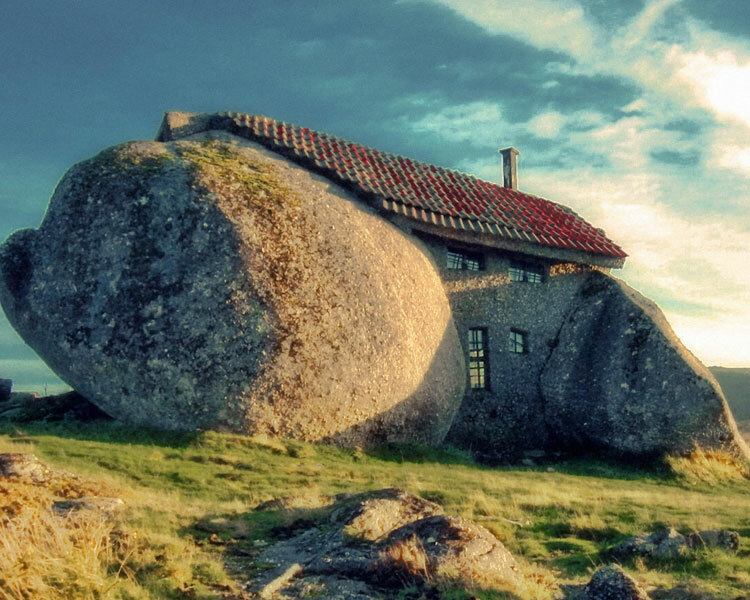 This bizarre house is known as “Casa do Penedo” and it is located in northern Portugal’s Fafe Mountains. It used to be a holiday home for a Portuguese family, but it became a tourist magnet after it was transformed into a museum. This amazing house has bulletproof doors and windows and even a swimming pool! 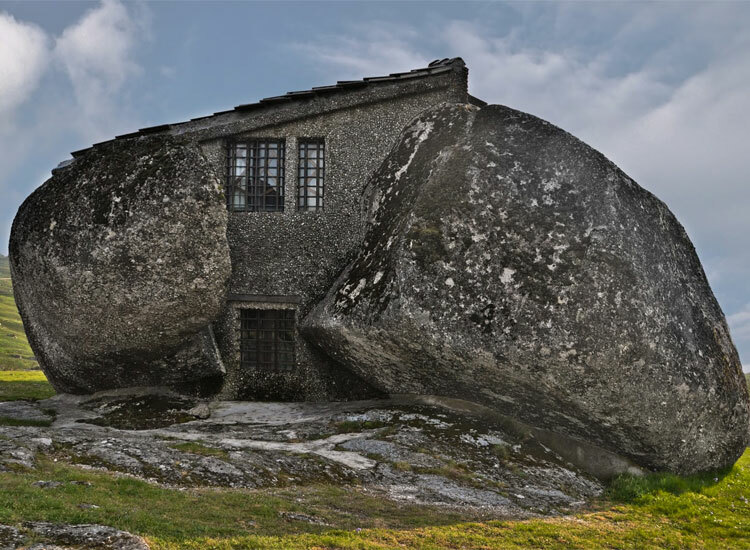 Most people would agree on the fact that this is a real-life Flintstones house, it is nestled between four granite boulders and it offers a great view since it is located on a 2,600 feet mountain. No one knows why the original owners wanted bulletproof doors and windows, but it is definitely a safe and unique house. Casa Batllo is a unique building located in Barcelona, it was redesigned by Antonio Gaudi in 1904 and its local name is “Casa dels ossos” which means House of Bones. The building’s unusual tracery, oval windows, and sculptured stone make it a real work of art. Its façade is decorated with a colorful mosaic made of broken tiles. This house was bought by Josep Batllo in 1900. 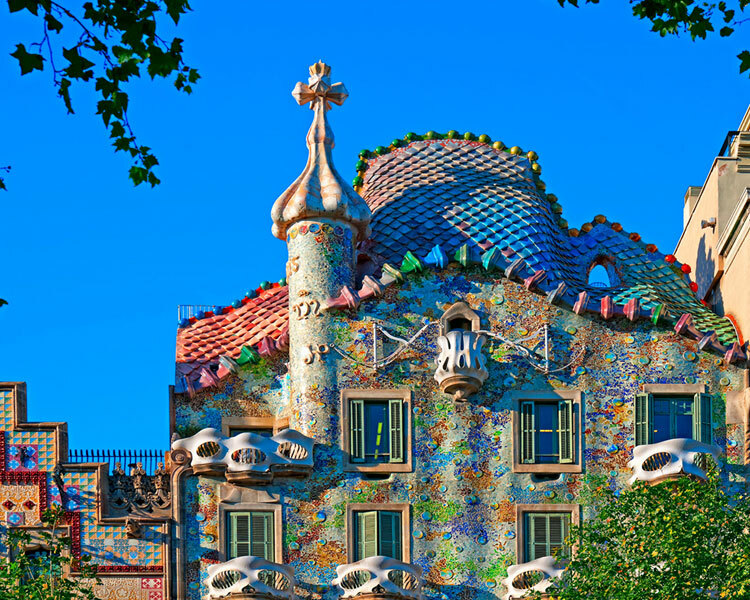 Its unique design made the house undesirable to most buyers but the Batllo family decided to buy it because it was located in the middle of Passeig de Gracia which was known as a very prestigious area in Barcelona. 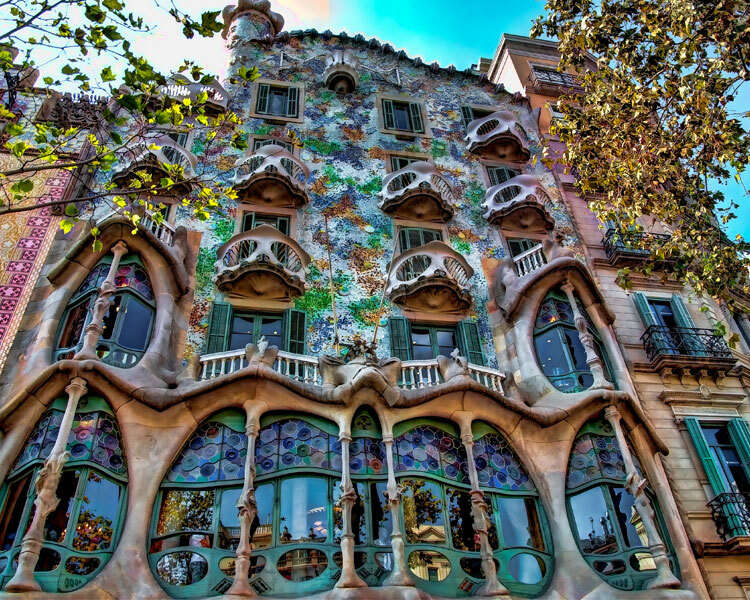 Gaudi redesigned the house in 1904 and turned it into the architecture wonder it is today. 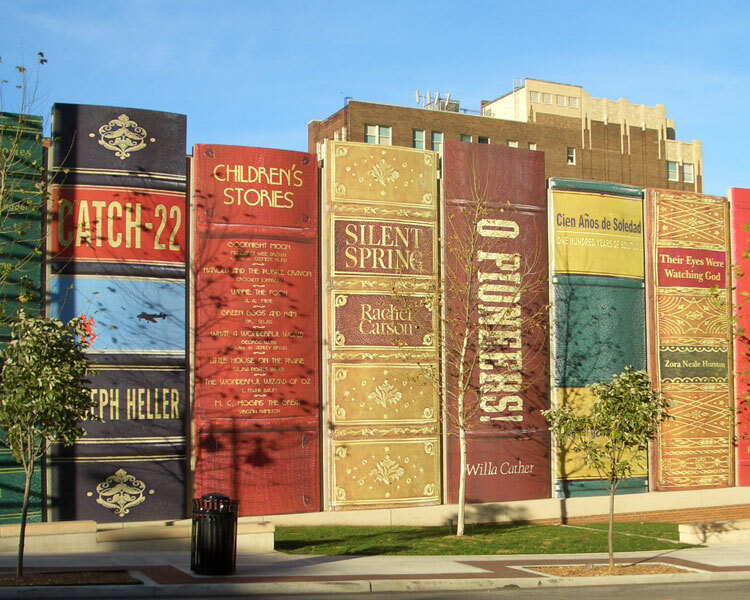 This unique library located in Kansas is famous for its façade which was designed to look like a row of books lined up on a shelf. Many community members voted on the titles to be displayed and 22 volumes were chosen including “The Lord of the Rings” and “Fahrenheit 451”. 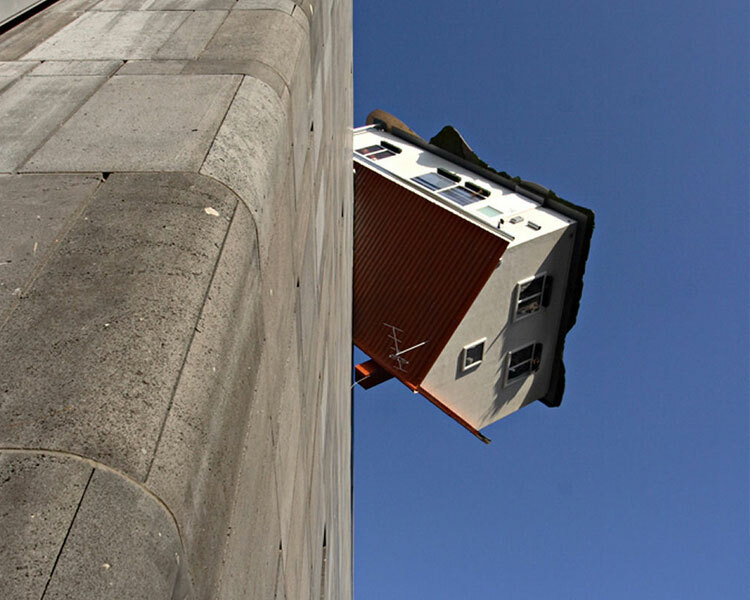 The “House Attack” is an artistic installation on the external side of a building in Vienna, Austria. It was designed by renowned Austrian artist Erwin Wurm. 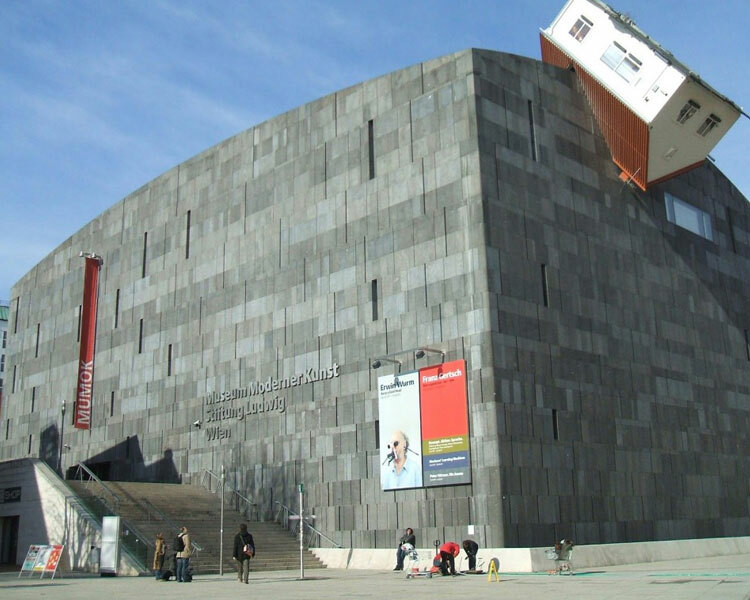 The MUMOK building is the largest art museum in Austria, with art collections from the 20th and 21ft centuries. 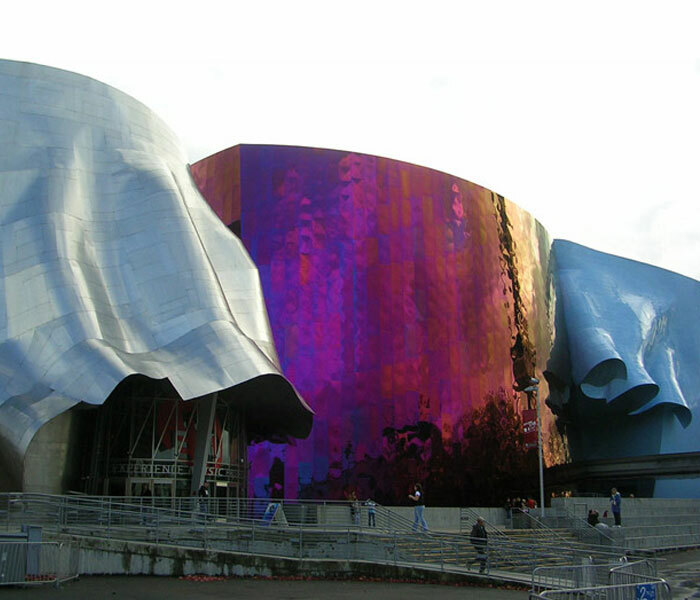 The artistic installation was opened on October 19, 2006. It represents a family home which hits the façade of the museum as if it were a bomb. 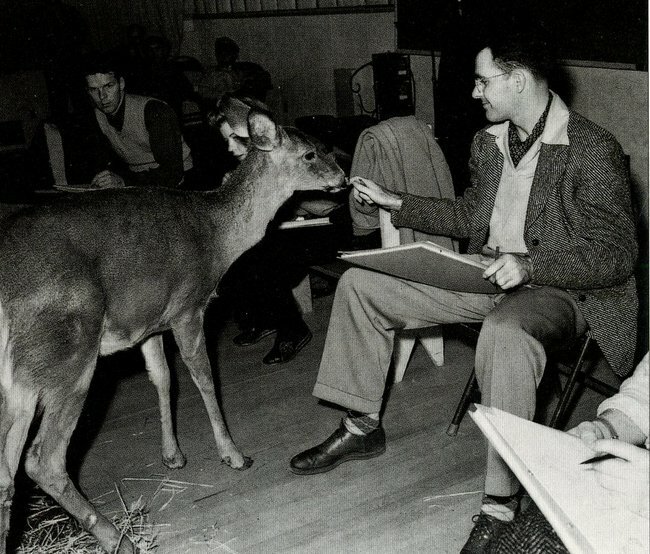 The artist likes taking simple concepts and then adding physical deformations to trick the eye and the mind. 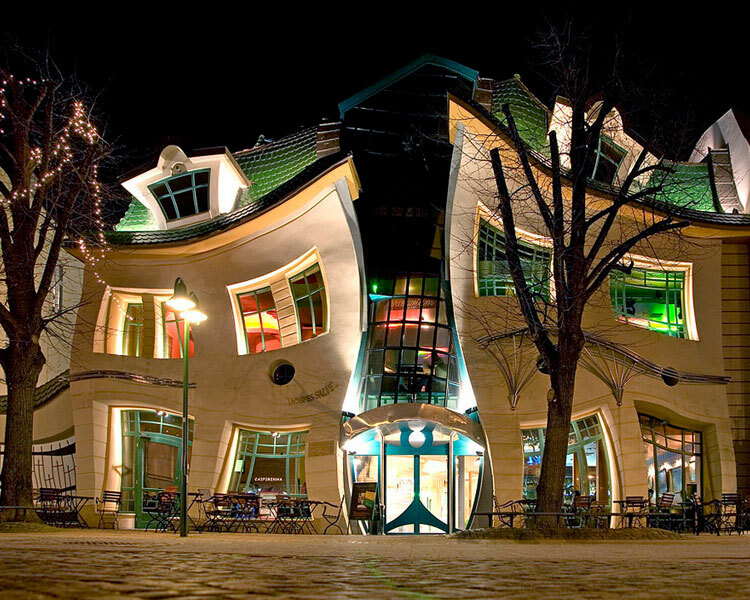 This bizarre building is located in Sopot, Poland. It was built in 2004 and it is part of the Rezydent shopping center. 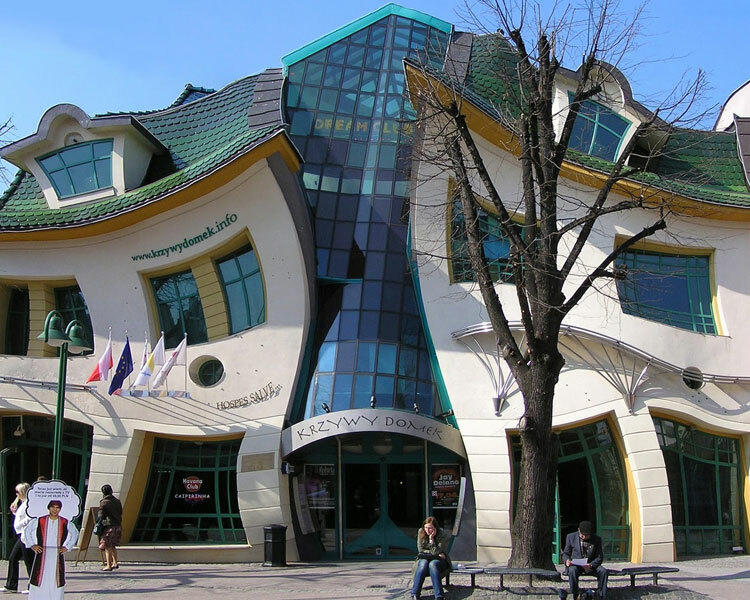 “Krzywy Domek” is Polish for “crooked little house”, the building was designed by Szotyńscy & Zaleski, who were inspired by fairytales illustrations. This awesome building is three stories high and it has become Poland’s most photographed building. If you ever visit “Krzywy Domek”, make sure you enjoy a drink at the Wonky Pub. The architect who created this building is quite a genius! 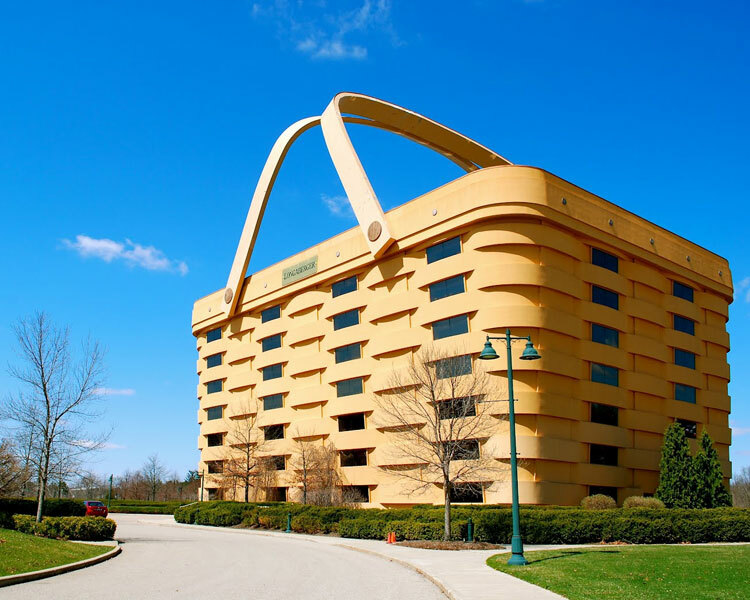 The world’s largest basket is actually an office building which houses the headquarters of Longaberger Basket Company. 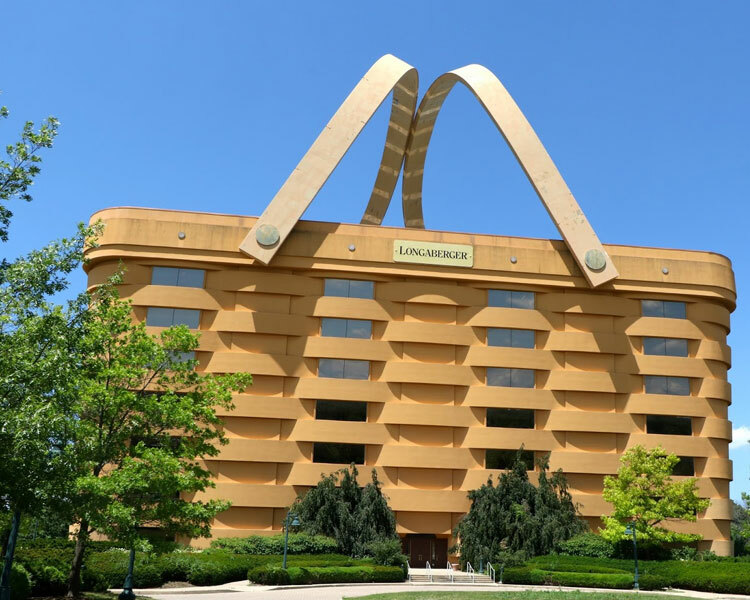 The basket building is 160 times larger than Longaberger’s Medium Basket. It cost $30 million and two years to complete. 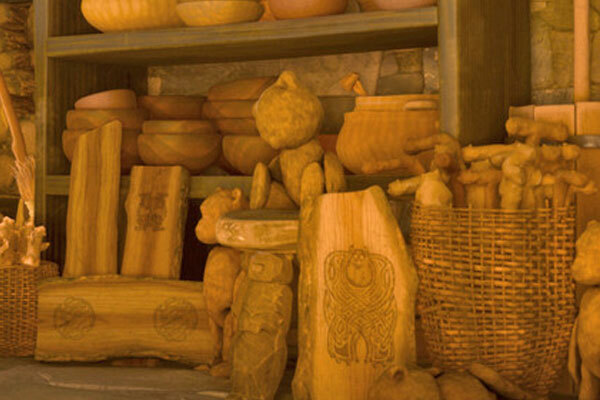 Longaberger Company is an American manufacturer of handcrafted maple wood baskets. It is located in southeastern Ohio and it was founded by Dave Longaberger. It must be really cool to work inside the world’s largest picnic basket, don’t you think? “Hallgrímskirkja” is a Lutheran church located in Reykjavik, Iceland. 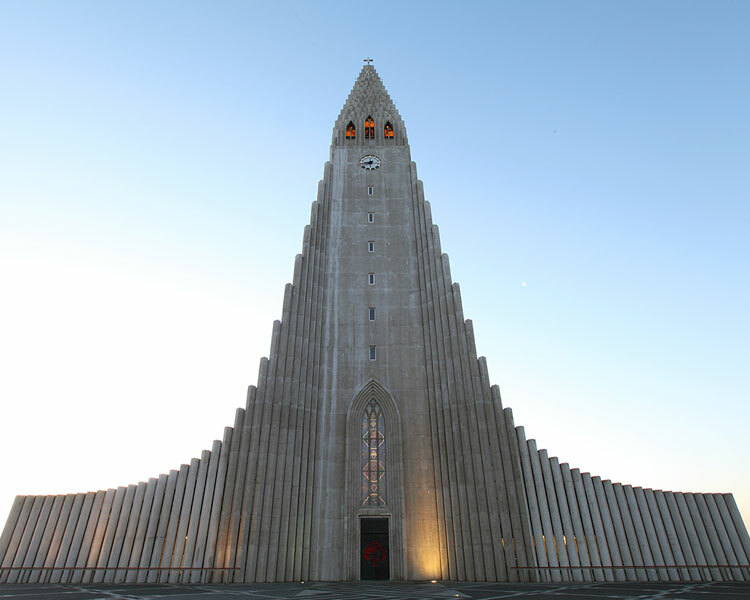 It is the largest church in Iceland and the sixth tallest architectural structure in Iceland. 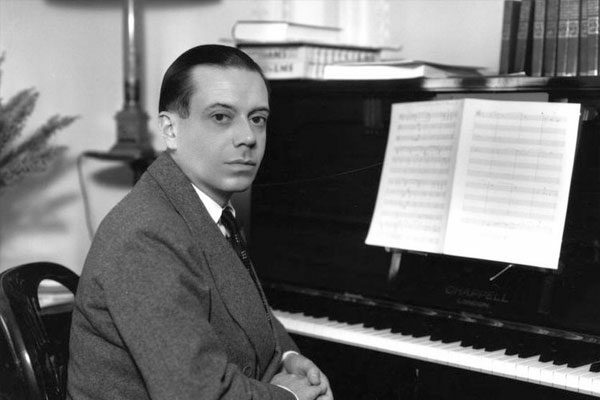 It was named after a poet called Hallgrímur Pétursson, who is the author of the “Passion Hymns”. It looks like lava flows! This Lutheran church was designed by Guðjón Samúelsson in 1987 and it took 41 years to build the church. The architect wanted to resemble the basalt lava flows of Iceland’s landscape. The church houses a large pipe organ by the German organ builder Johannes Klais. 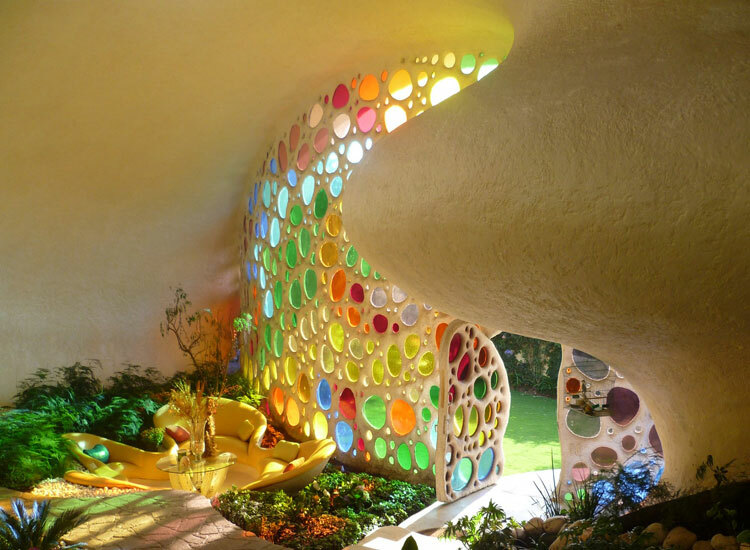 The Nautilus house is located near Mexico City; it was designed by Javier Senosiain. 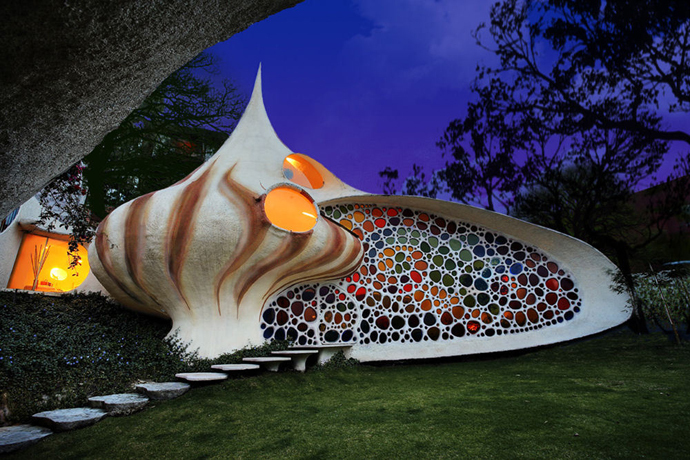 This shell shaped home has a unique design because Javier wanted to bring the aquatic life into architecture. Javier Senosiain says this house is the perfect example of Bio-Architecture, which is based on the natural principles of organic forms that create harmony with nature. This awesome house belongs to a young couple with two children, who were tired of living in a conventional home and wanted something unique. 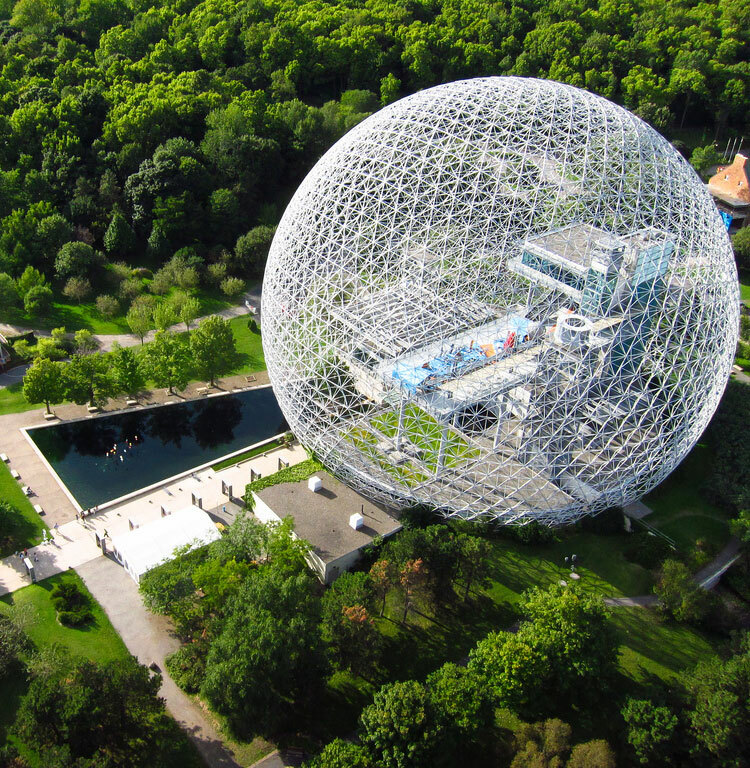 This awesome building is a museum in Montreal which is dedicated to the environment. 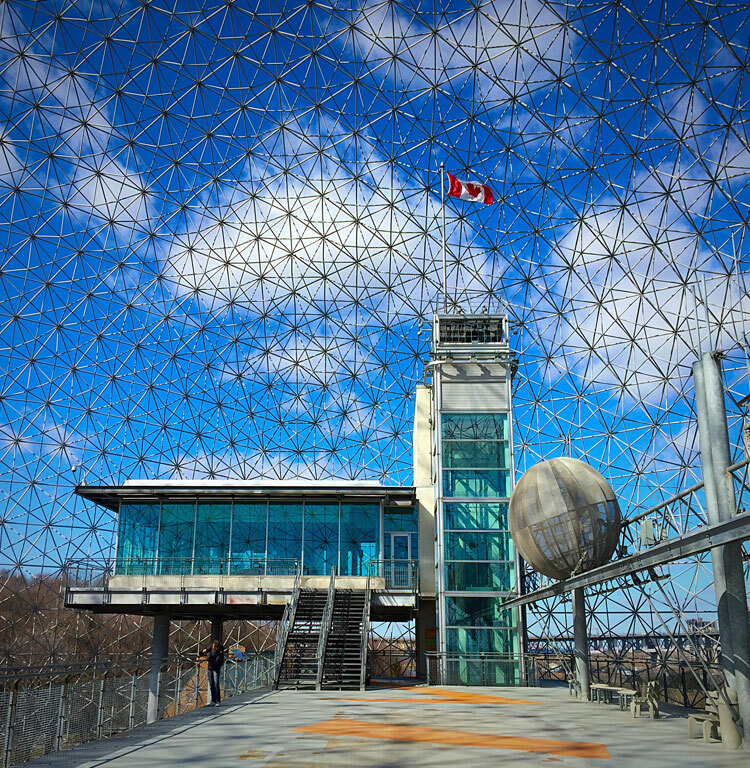 The building was designed by architect Buckminster Fuller. And it was purchased by Environment Canada for $17.5 million! Now it is an interactive museum of the waters of the Great Lakes-Saint Lawrence River regions. In 1976 there was a huge fire that burned away the building’s transparent acrylic bubble, but the hard steel truss structure remained. The structure was featured in the “Battlestar Galactica” television series episode “Greeting from Earth”. 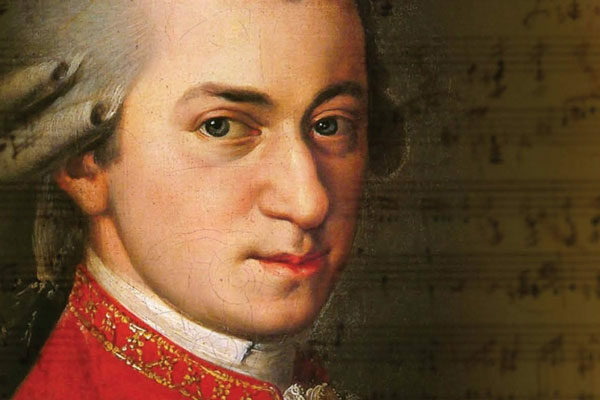 If you are a fan of music, you’ve got to check out this place! 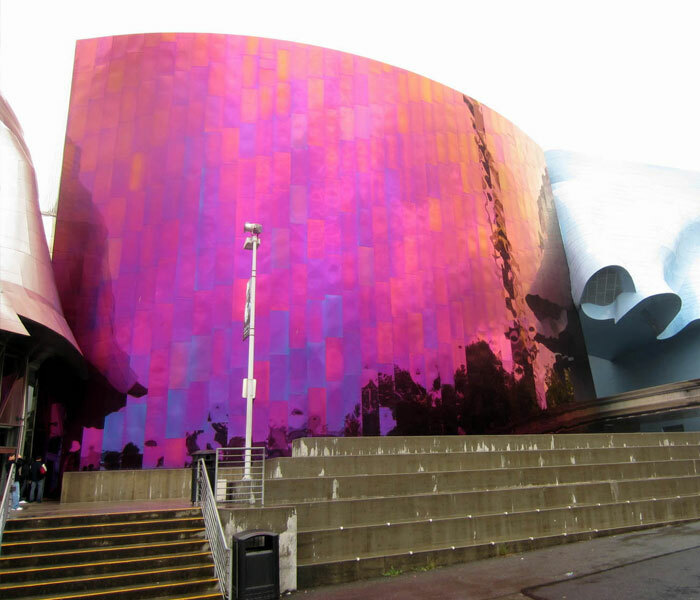 The Experience Music Project Museum, which is dedicated to contemporary popular culture, is located in this building. It houses many exhibits, interactive activity stations, sound sculpture and educational resources. Among the many exhibits, you’ll find the largest collection in the world of rare artifacts, hand-written lyrics, and personal instruments of musicians like Jimi Hendrix or bands like Nirvana. The museum also holds a giant guitar sculpture made with 500 different musical instruments. Sometimes it gets a little bit too complicated when it comes to traveling with your little ones. Planning a vacation must take into consideration not only an interesting destination for all, but also the activities you plan to do in the trip. You should think that kids get bored more easily and that they also demand more attention than anyone. Here we are going to share some cool tips that will help you with your kids while traveling. Hope it work for your family as it did for mine! What could be worse than arriving to your vacation location when it’s raining? With little kids, this, can be a nightmare. It helps to find beforehand a couple of nice indoor parks or activity locations that kids can go indoors. 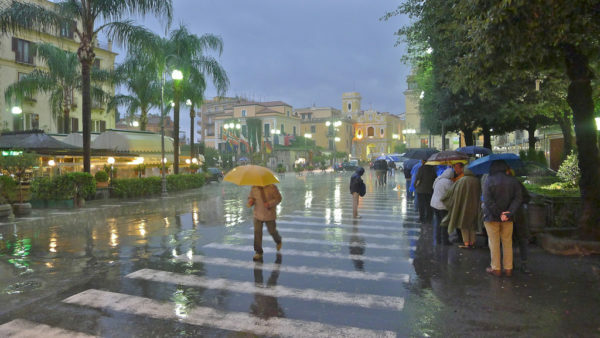 In Sorento, Italy, really near the town center there is a place called “Parco Giochi” where you can go and play. There are jumping beds and cool slides to enjoy. Of course, a vacation with kids is not complete if you don't visit a toy store. Try to find unique stores where you can freely explore and that are an experience to visit, rather than chains or generic stores. 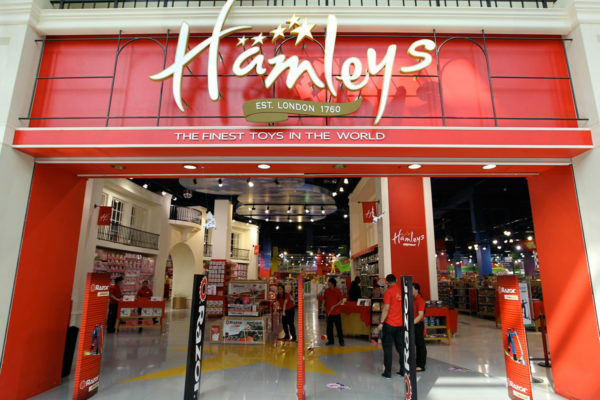 In Prague, for example, there is a huge toy store that is called “Hamleys”! It is not cheap at all. However, kids can play with everything while they are in there. Trying to avoid all the “mommy buy me this, this and this” you’ll definitely have the greatest time. There are plenty of destinations around the world, besides amusement parks for kids. 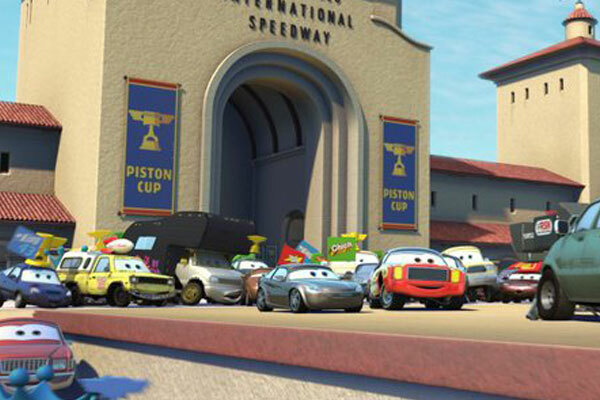 Try to show them a new experience, or a unique location with fun sightings. In Spain, one of the top family locations is a small coastal town called Sitges, which is on the outskirs of Barcelona. It's easy to walk through the small streets, it is full of restaurants, the beach is in the center of the city. In summer, it gets a little too crowded but it is not a problem at all. When traveling with kids, having the right tools and equipment will make your life easier. If you're doing a beach trip, we highly reccomend Water shoes! It is not funny trying to keep your crocs on and your little children’s too at the same time. 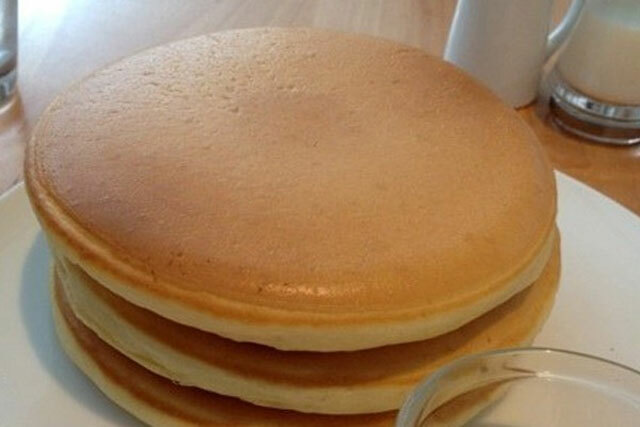 This will save your day! Promise from mom to mom! How can I take them everywhere I go? When you have more than one kid it gets almost impossible to walk around calmly therefore I am here to save your day! 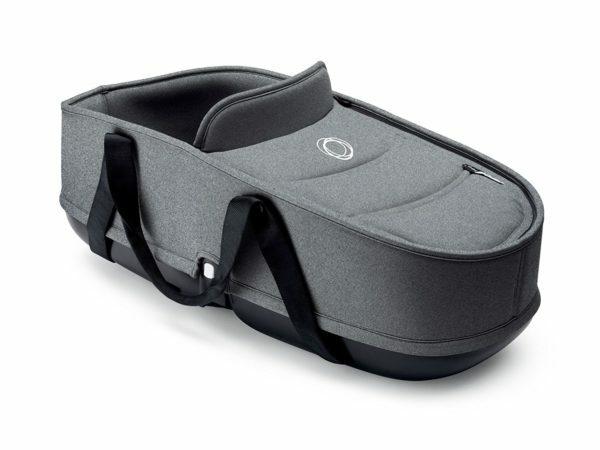 You should definitely buy a baby carrier, if you have small children. 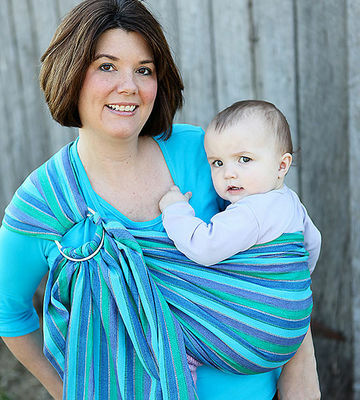 They are a lifesaver and will keep you both comfy. If you have an older child, umbrella strollers are the way to go. 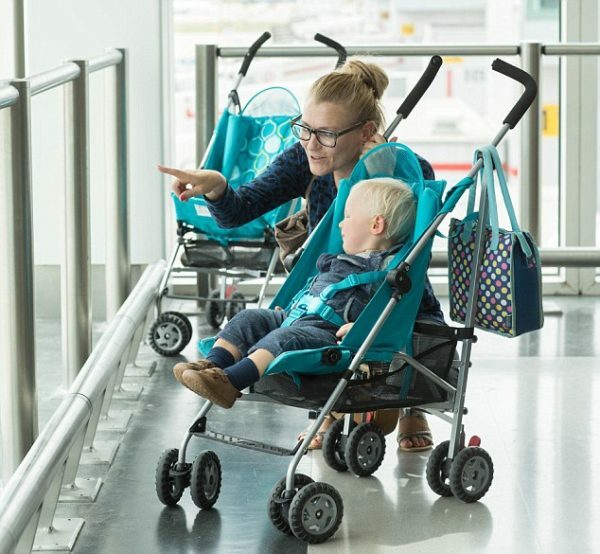 When traveling, try to go with a stroller umbrella, as they are lightweight and more practical to carry around. If you're visiting a big city rich with history, don't forget to include museums as indoor activities. For rainy London, the Tate museum is a go-to location, it has a big kid area where they can and enjoy some cool activities. Then you can also visit some cool food markets where you can try different flavors that your children will definitely enjoy (Borough market, Spitalfields). Don't forget the healthy snacks! 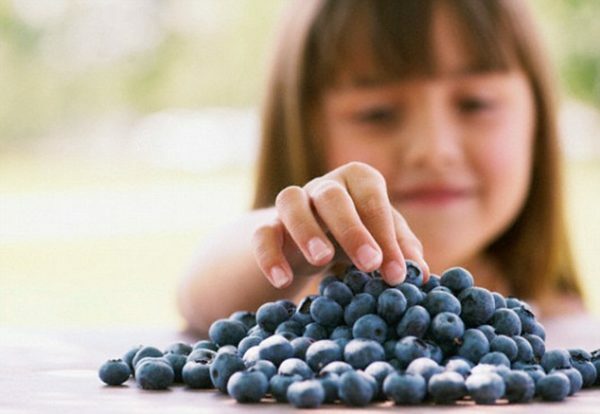 Traveling is never an excuse to feed your children junk food all day - take some time to find a fruit stand and if possible, get some blueberries!one of the best snacks in the whole world. 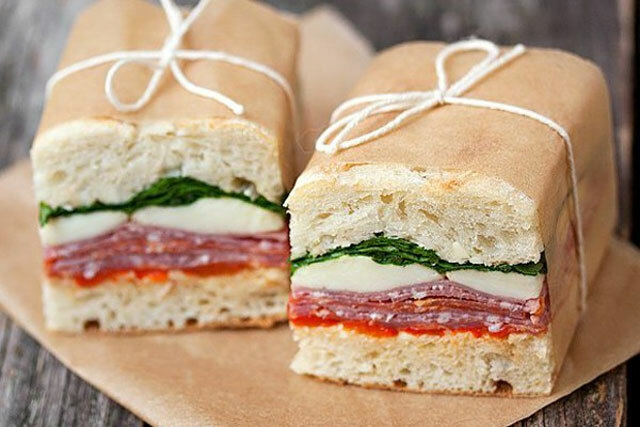 Healthy and funny to eat. You can tell them that they are green on the inside which will bring their interest. They are also quite easy to wash, just a water bottle and you are all done! 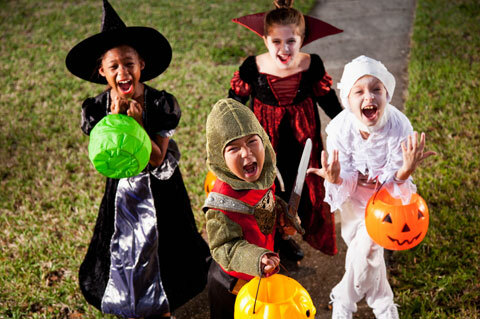 You can spark a child's interest in an activity that would otherwise be boring by dressing up for it. Guided tours or history museums are way cooler if you are dressed up for the ocasion - and it doesn't have to even be a proper costume, a couple of well-chosen items from their own closet can do the trick. A fantastic activity for kids, if you ever get the chance, is to take them to a field where they grow produce and to go and pick some of it. 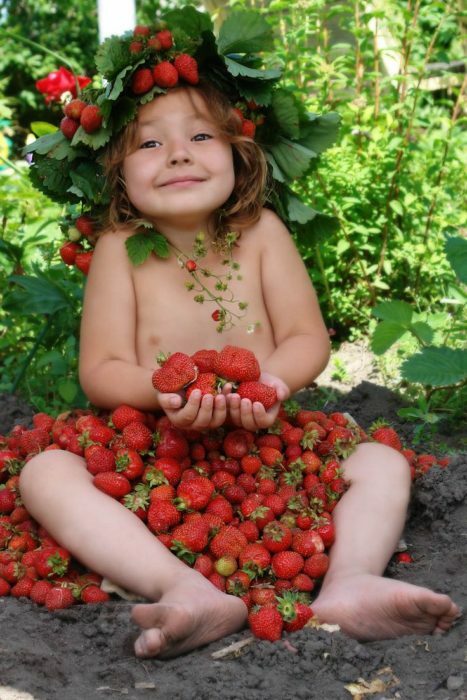 In the US, there are lots of parks where you can easily collect strawberries with your children. Then you can take them home and do a cool shake or even lay down on the park and eat them right from the ground. Don’t forget to wash them a little bit! When possible, try to include as many cool outdoor playgrounds as you can - it's a great way to burn energy and keep kids happy. 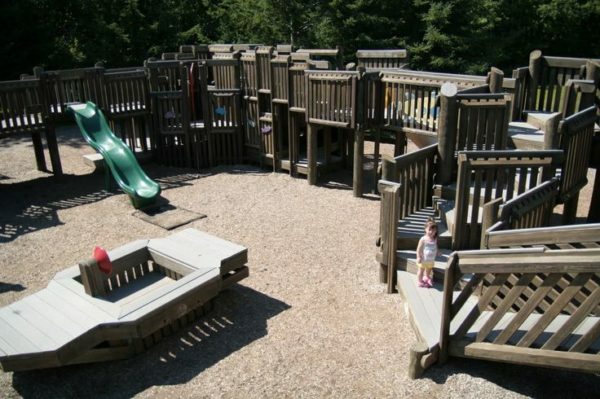 If you are in the Boston area, Action Cove is a cool place to go play outdoors with your children. 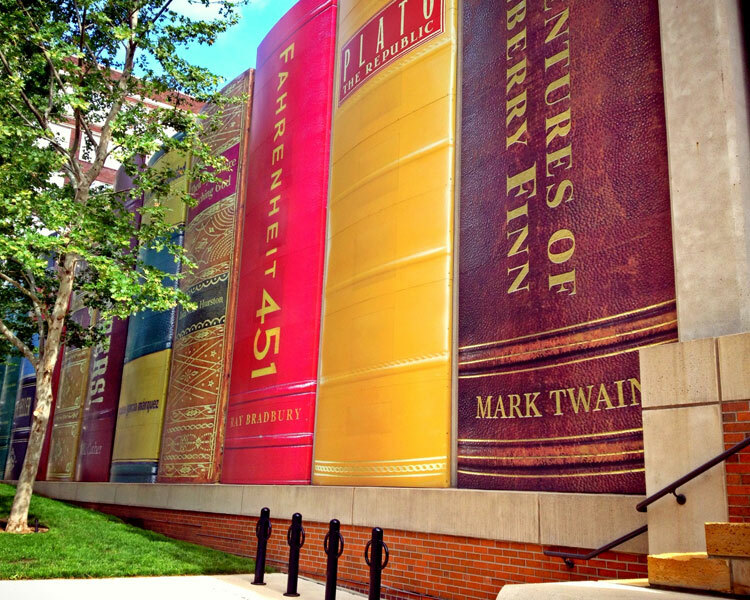 It is 45 minutes from the city of Boston and it is full of funny things for them, they’ll love it. 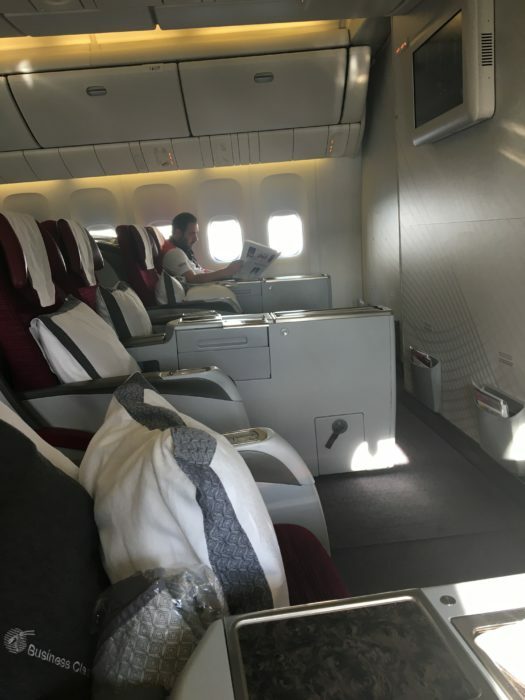 When it comes to traveling by air, the best thing you can do try and pick the front row, if possible. It will help you moving around more freely as well as taking more things on board. Sometimes little kids need more than one small carry on. We all know that! Experience if possible the outdoors and go spend time with your kids in a natural setting - this is a great opportunity to have them learn something about our planet. 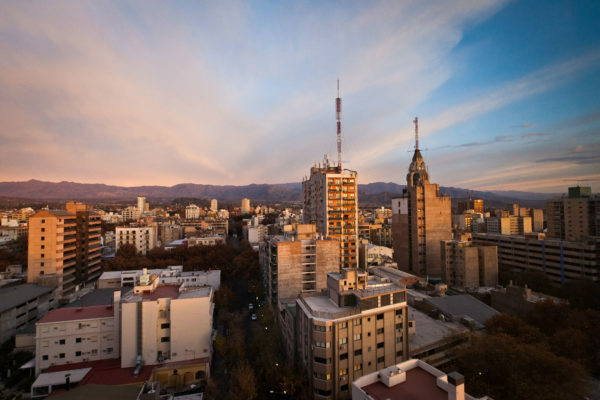 Mendoza, in Argentina is a great place to do this, and it's a great place to go with little kids. Awesome sceneries and it is not far from the capital. Valle de Uco is one of the most beautiful + accessible places to go. 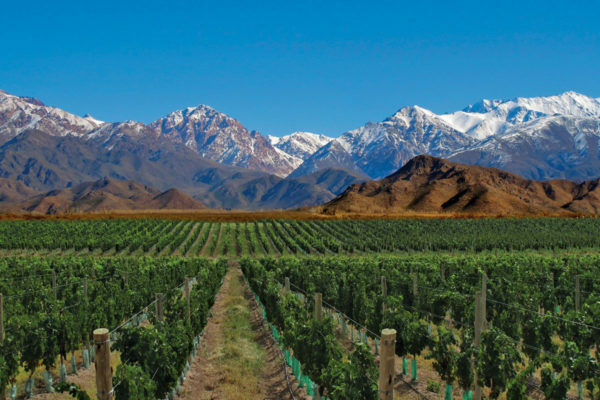 However it is 1 hour and a half from Mendoza’s capital city. If you don’t have a good time with your children in the car this is not too far away. However, you can also prefer just staying in the capital which is beautiful too. Cold weather should have to trump your vacation plans. It is possible to manage little kids in cold weather. 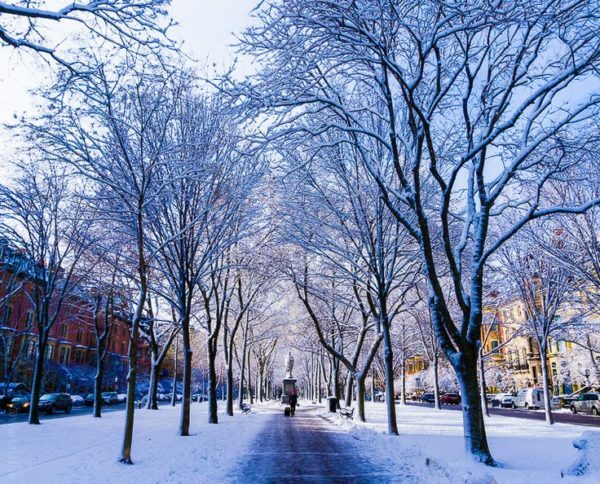 Boston is one of those places that looks even prettier during wintertime, beautiful snow all around! You should visit it on January and you’ll get to see something like this. Don’t let the winter scare you when it comes to little kids! You should only be prepared and everything will be all right. Something I highly recommend is buying a sleeping bag that can be attached to your stroller and a warm jacket, then, you are all done! It's important to create ever-lasting memories with your children, and if you can, try to have a one-on-one experience with them. 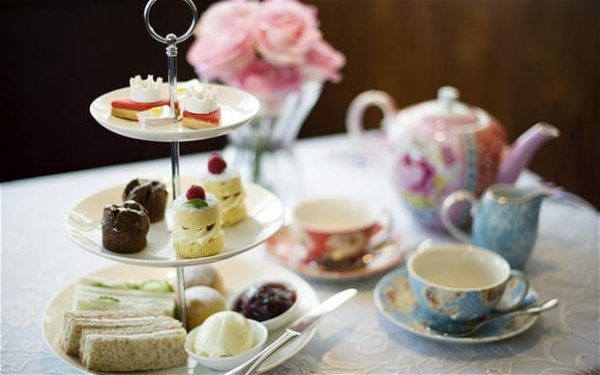 If you have a little girl, you can’t miss the five o’clock tea if you are visiting London. I highly recommend it. There are lots of beautiful places where you can find all different food halls. If you want to do some shopping while on holiday - make it worthwhile for your kids so that they don't become restless and cranky. 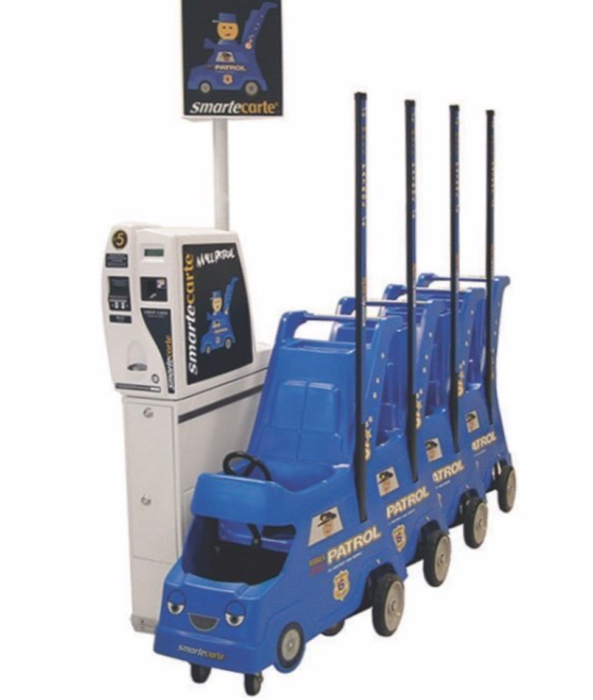 Something as simple as investing on those cool strollers at the mall is something th at will go a long way. Grab this 5-dollar stroller and everything will be all right. Believe me, they will just love it. It's important that you guve kids space and let them be kids - they are experiencing and discovering many things for the first time, so let them! 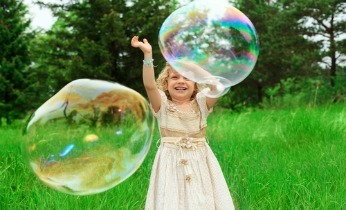 In lots of places in Europe you’ll see people on the streets playing with huge bubble makers! You should not keep on walking. Kids love it and it is a great activity to enjoy outdoors. A great way to have a hassle-free vacation is going to an all-inclusive resort. They are packed with activities for the kids and they will have a blast without much planning or effort from you, so you can also unwind. One of the best ones we've visited was in Mallorca, the best entertaining team in the whole world. 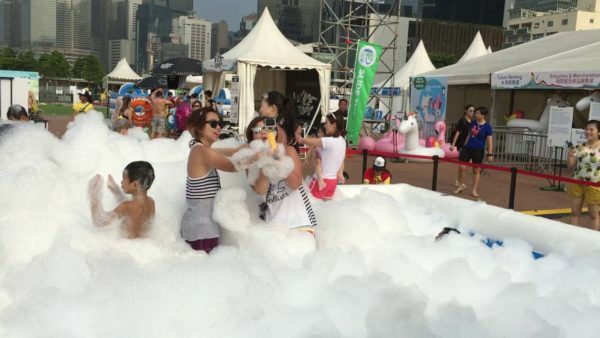 They even organized a huge foam party that was really fun for everyone! There was a cool DJ too, so parents and little kids can have fun. Win-win! 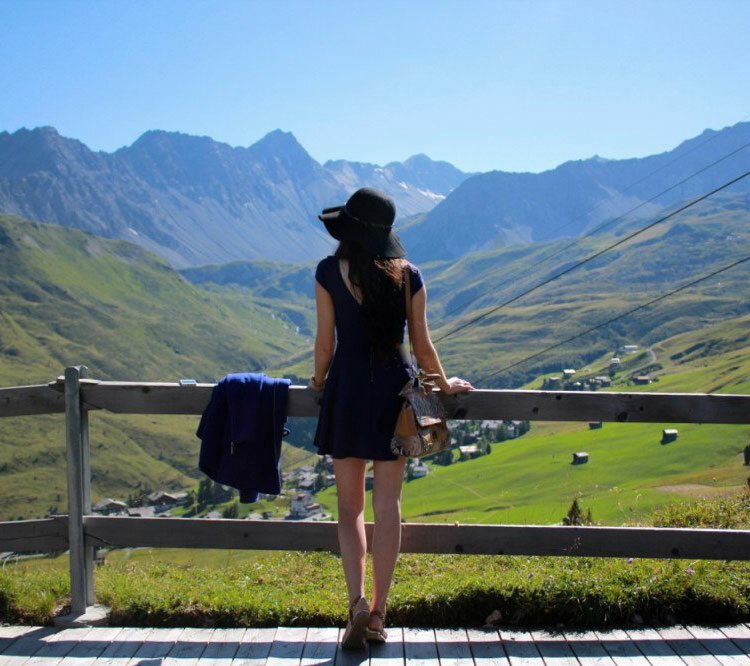 This girl is just 24 years old and she has already traveled to more than 50 countries! 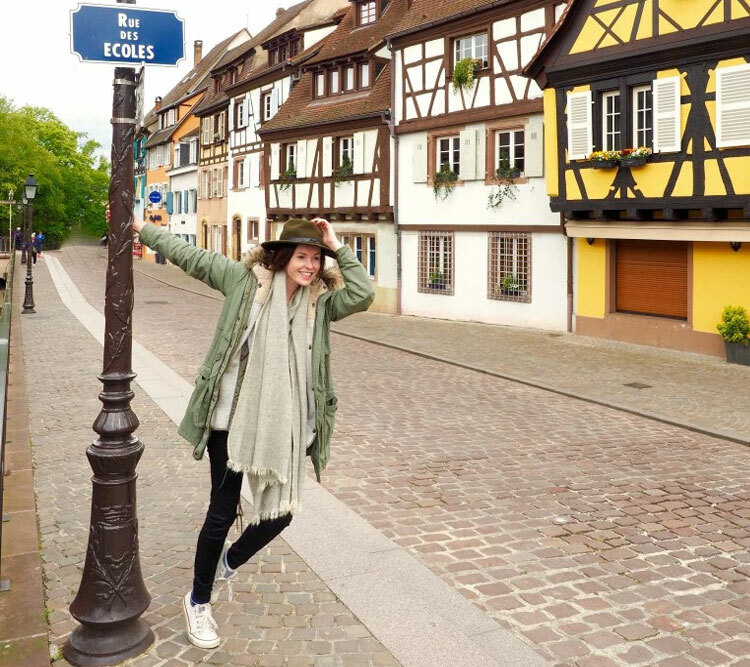 Brooke Saward is a 24-year-old girl who on the day of her college graduation decided to book a one-way ticket to London and she’s been traveling the world ever since. 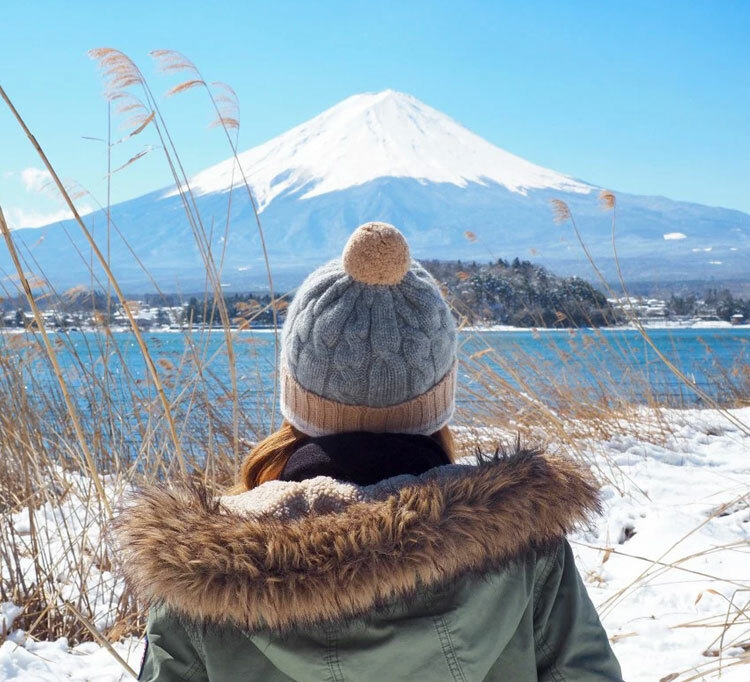 She created her travel blog “World of Wanderlust” in which she shares all her travel tips, lifestyle tips, and DIY projects; Brook wants to inspire all those who want to travel and live a more adventurous life. In this post, we’ll share with you some of Brooke’s pictures which were taken in the most amazing places in the world. 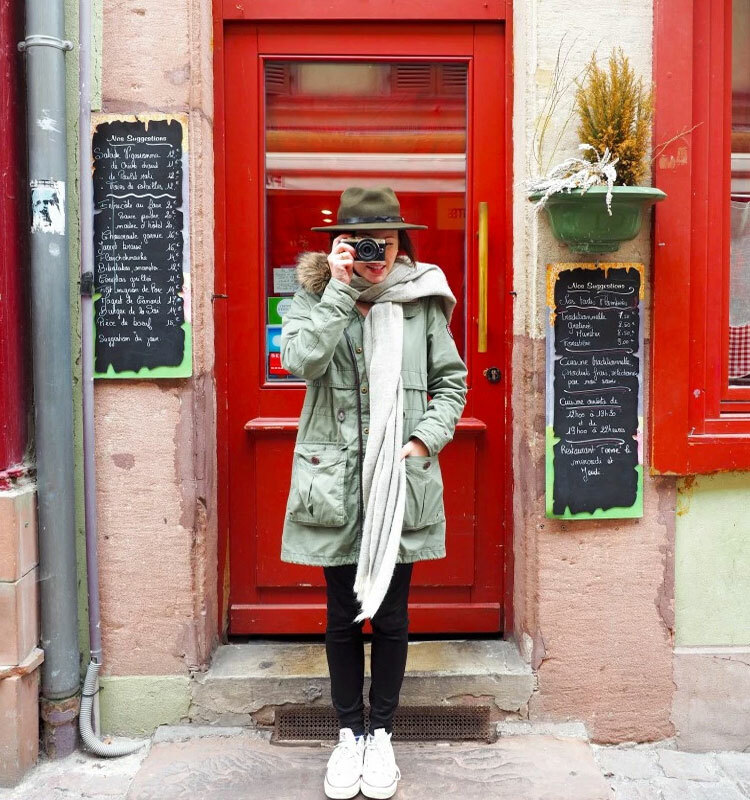 Maybe after reading this post, you’ll be just as inspired as we are to travel the world! Brooke Saward says that she had always been encouraged by her parents to “do what you love” because happiness is our most precious possession. When she was done with school, she knew that she didn’t want to be stuck behind a desk all day so she decided to book a flight to London in order to find the answers she was looking for. Brooke had already started blogging a year before, but she only thought of it as a hobby. 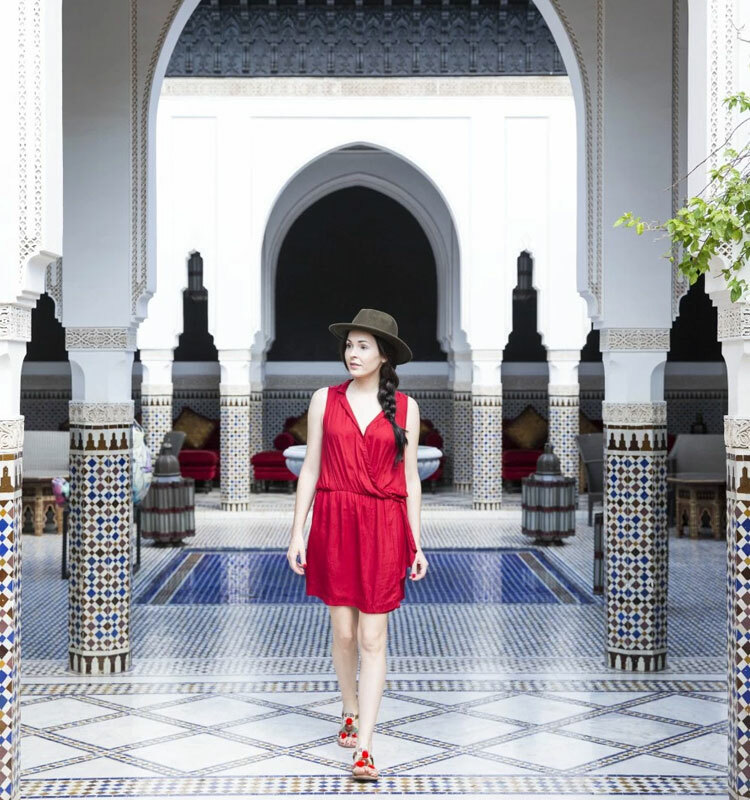 She spent six months overseas before turning her blog “World of Wanderlust” into a business. According to Brook, she was spending more money than she was making so when she saw other bloggers turning their blog into a business, she decided to give it a try. 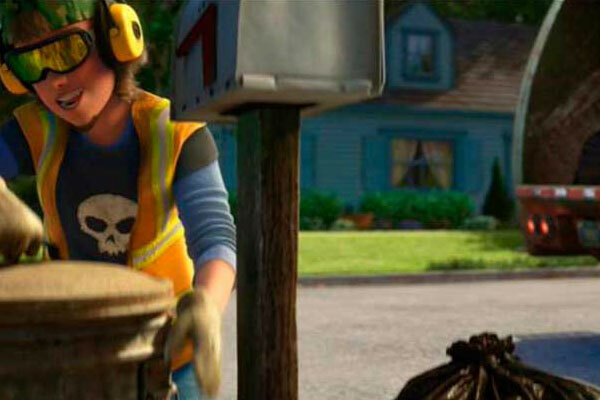 The road to success hasn’t been easy for Brooke. “It has been one crazy ride to get to where I am now – plenty of sleepless nights, spending every spare second of every day blogging, photographing, editing, taking videos, responding to emails, consulting with brands… But I love it so much!” says Brooke. Brooke wants her blog to inspire all those who are thinking of starting a blog, try something new or take up a new hobby. There’s something extraordinary about going to a foreign country, meeting new people and experiencing new things. It is definitely a life changing experience for all those who are brave enough to go on a trip by themselves. 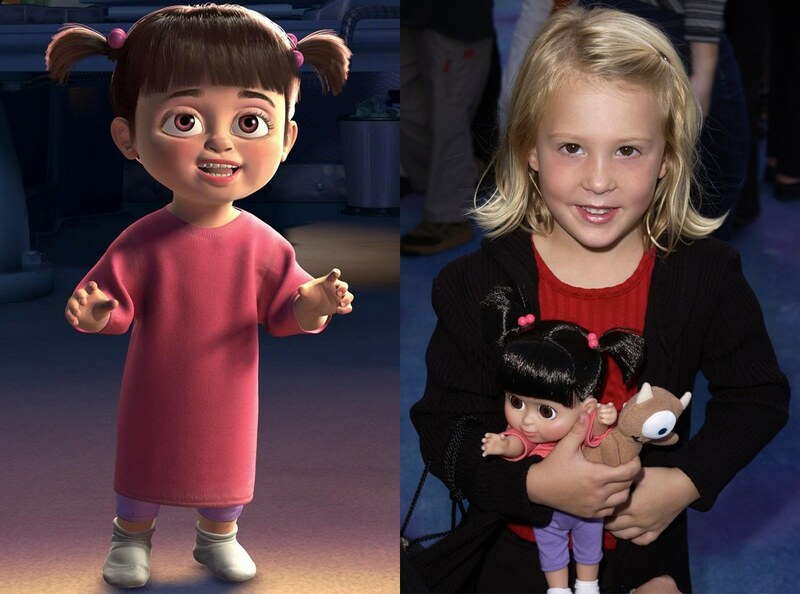 Brooke has traveled to many countries in Europe. 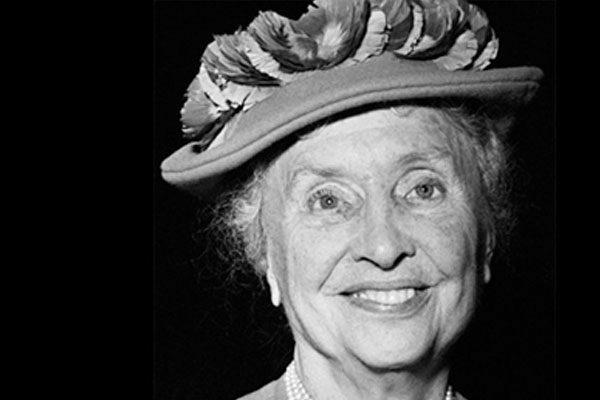 In the picture above, she is standing next to London’s famous phone booths. 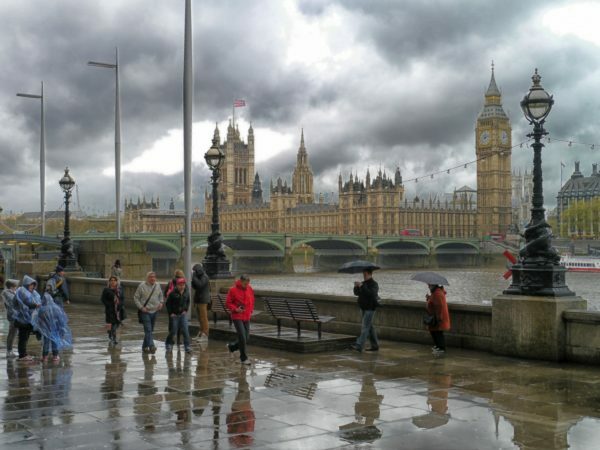 The British capital is known as one of the most cosmopolitan cities in the world; there are many museums and music performances that make London’s cultural scene unique. Paris is one of the most beautiful cities in the world. The City of Light has many magical avenues with wide streets and incredible architecture. Taking the best pictures in Paris is definitely a must! 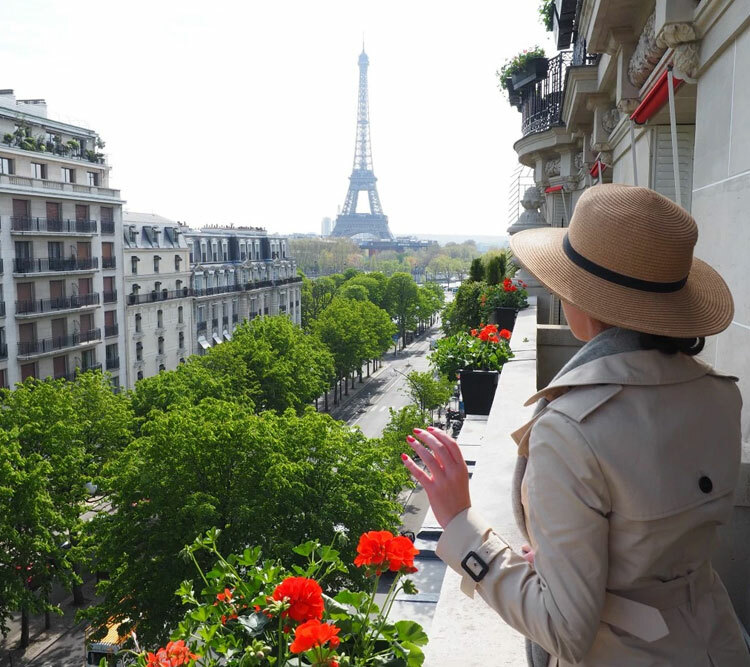 The picture above was taken on a balcony at the Hôtel Plaza Athénée, one of the most iconic hotels in Paris. Transylvania is a region located in the central part of Romania. It is known for the scenic beauty and its rich history. If you like Gothic style architecture, you can find many well-preserved monuments such as the Black Church in Braşov and many other cathedrals. Colmar is a picturesque place located in France; it was the last town to be freed after World War II. Most of the old buildings are well preserved, and there is a German influence in its architecture. 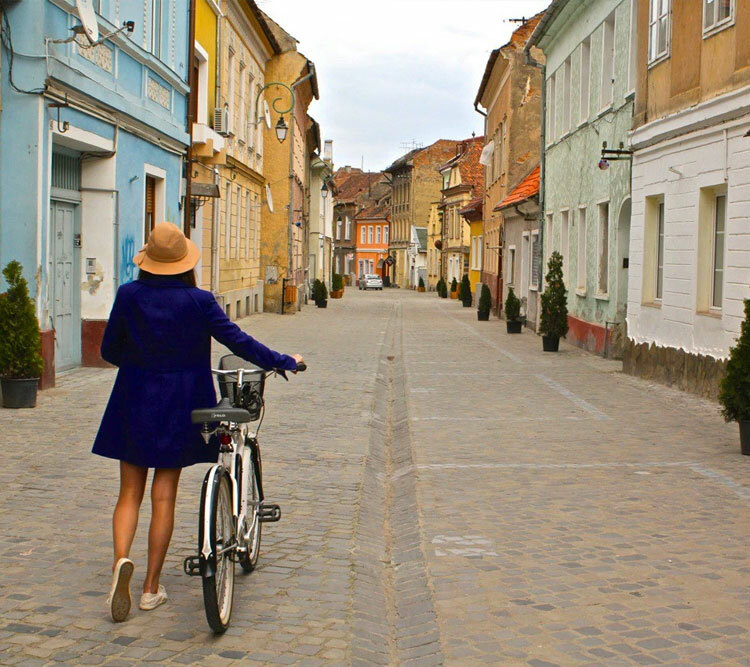 Brooke recommends wandering the streets and alleyways which are filled with local souvenirs, antiques, and pastries. When Brooke visited Hong Kong, she was surprised with how many markets, multi-storey shops and street vendors there are. She recommends visiting PMQ which is one of Hong Kong’s most popular concept store locations. You can find many youthful and unique things here! 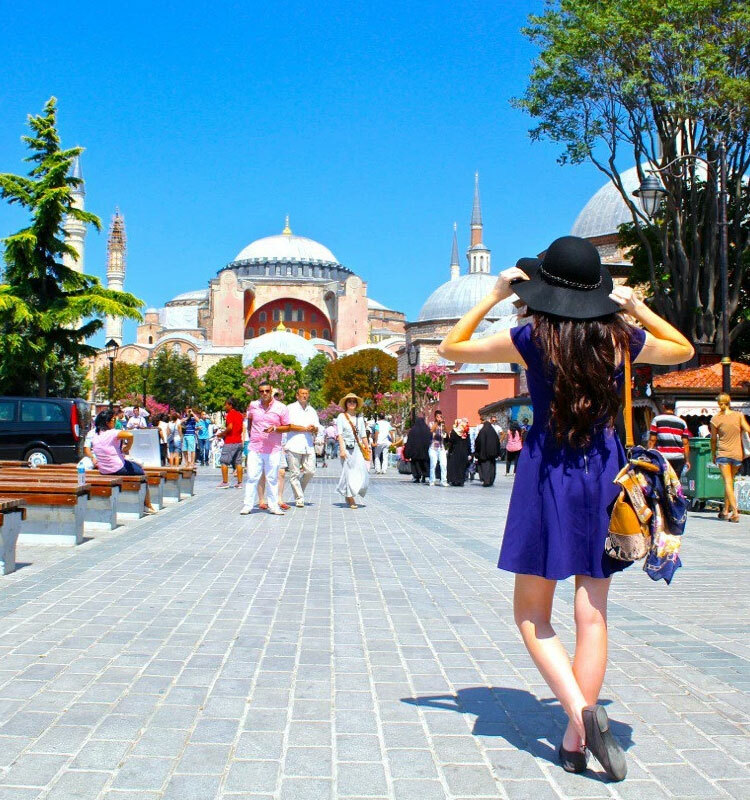 Brooke says that Istanbul is one of the most intriguing, inspiring and charming cities she has ever visited. “This city is so full of fascination at every turn, that it can quite easily become overwhelming, whether visiting for a couple of days or a couple of weeks.” says Brooke. Stockholm is the capital city of Sweden; Brooke says that there is a special charm about it that captures your heart. The city is full of pastel buildings and there is a unique mix of old meets new. 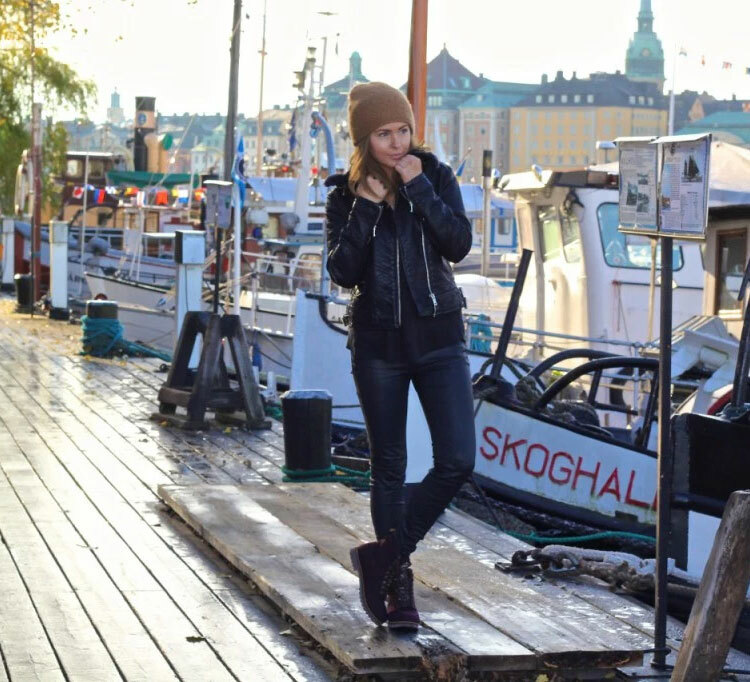 If you are visiting for the first time, Brooke recommends Strolling through Gamla Stan which is the most picturesque area; you can also visit the Vasa Museum which is home to many 17th century ships. Brooke visited Norfolk in Australia, it is a small 34.6 kilometers squared island located 1600 kilometers off the coast of Australia. If you are a nature lover, you should definitely visit this place, and if you are more into history, there are many museums you can visit. 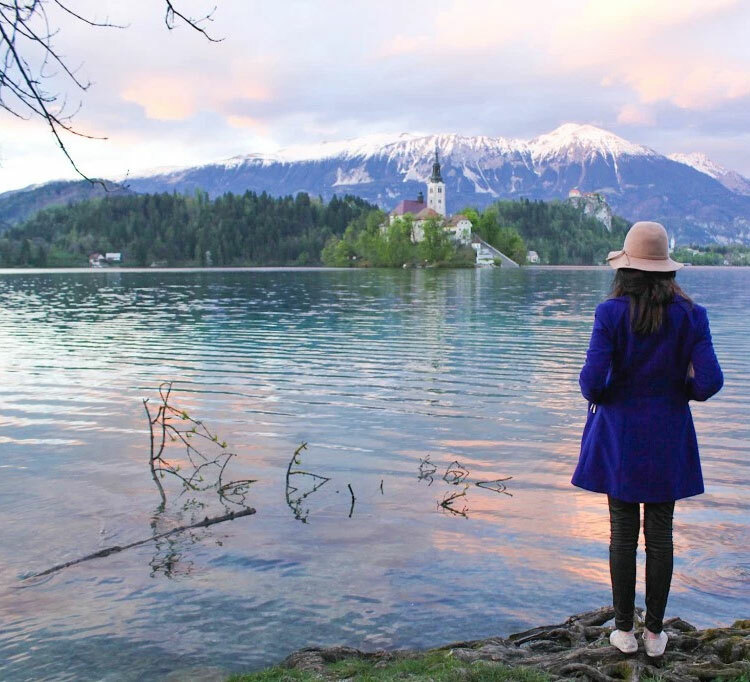 According to Brooke, Bled looks like a real-life fairytale town, it is located in Slovenia and the lake you see in the picture above is the biggest attraction in the town. There are many water activities such as rowing. Judging by this picture, it looks like a very romantic destination. 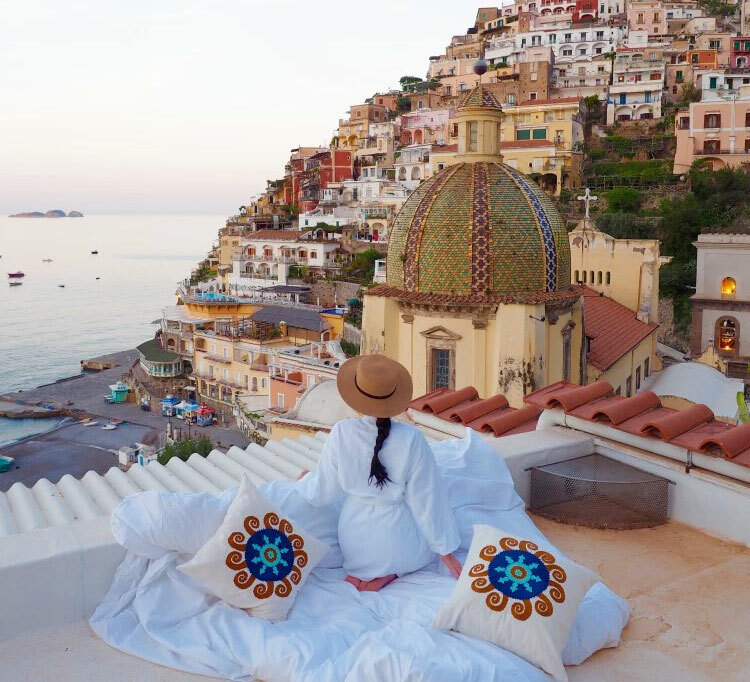 Italy is full of beautiful places to visit; Brooke says that Positano is the most picturesque town on the Amalfi Coast and we agree with her, just look at this picture! 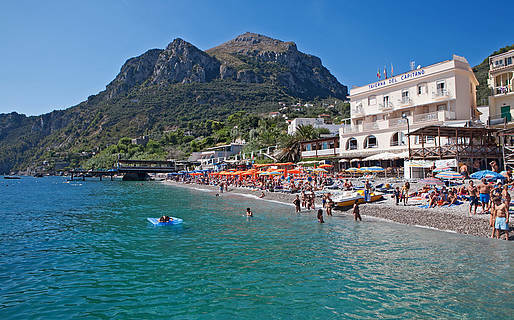 She also recommends visiting Sorrento, which has many great restaurants and you can easily mingle with the locals. 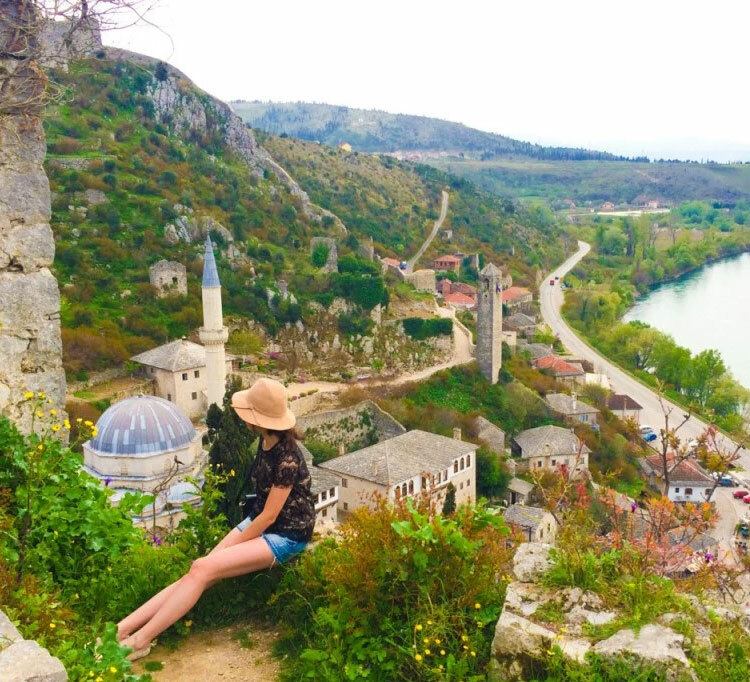 One of Brooke’s biggest travel secrets is to visit Bosnia and Herzegovina. Since it is not a popular travel destination, she recommends visiting this place with a friend. The best way to get around is by bus and don’t be afraid of speaking with the locals, Brooke says they are among the loveliest locals in Europe. Lake Como is located near the Southern border of Switzerland. 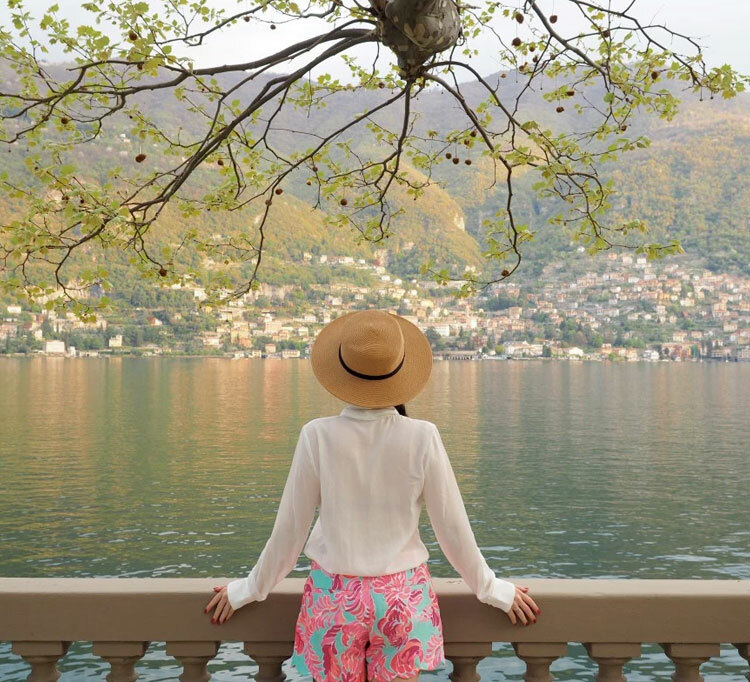 “If you are staying in Como and wish to explore some of the small lakeside villages and towns, then head down to the ferry pier and take one of the public ferries to where you want to go.” says Brooke. Zurich is a beautiful town located in Switzerland. 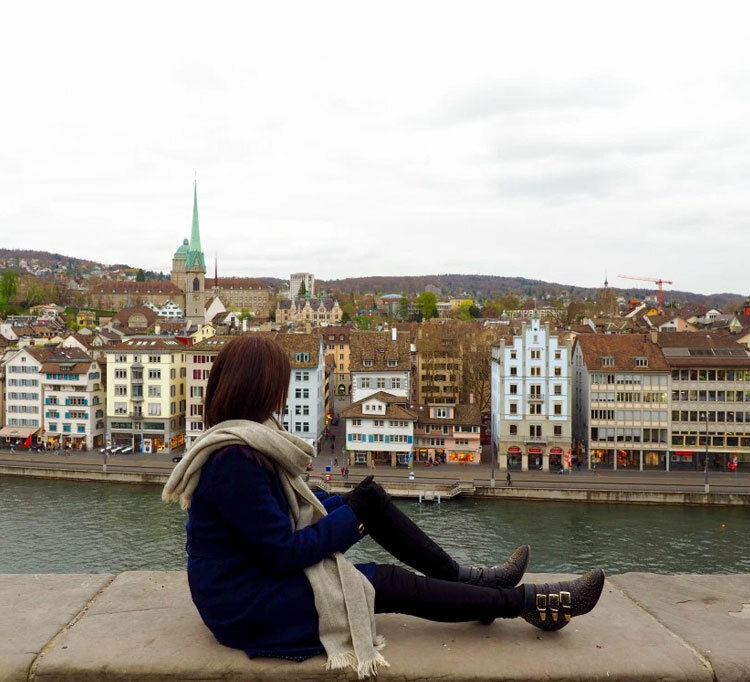 Brooke recommends visiting Lindenhof Platz which offers great views of the river and old town. According to her, Augustinergasse is the prettiest street in Zurich because of the colorful buildings and their architecture. Brooke says that Tokyo is one of the world’s most incredible cities. It is the capital city of Japan and it was ranked first in the “Best overall experience” category of TripAdvisor’s World City Survey. The one thing you have to take into consideration is that Tokyo was ranked as the 11th most expensive city. Kyoto is a city full of charm, temples, shrines, and gorgeous natural scenery. 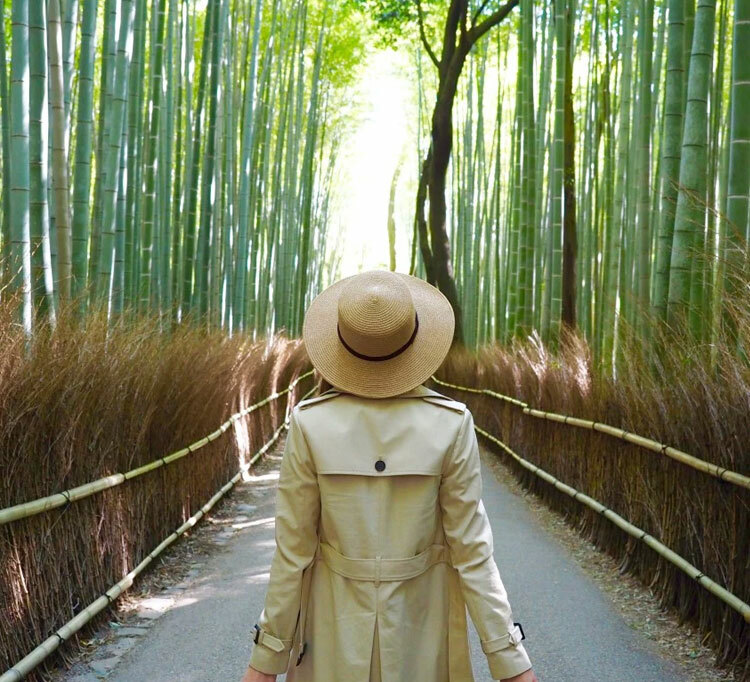 According to Brooke, you need at least three full days to discover Kyoto. Arashiyama is an amazing bamboo forest with no entrance fee so it is a great place to visit. Sanjūsangen-dō is a Buddhist temple with 1,001 statues that’s also worth the visit. Brooke says that Saint Petersburg is her favorite city in Europe. She recommends visiting Peter and Paul Fortress if you want to learn about Saint Petersburg’s history. Russian pancakes and Russian dumplings are also a must! If you’d like to see more about Brooke’s travel, you can visit her blog “World of Wanderlust”. Dreams are a really confusing and serious situation, they have a big importance i our lives, and sometimes they can be really complicated to understand, making us question how and they happen, discover here all the things you didn’t know about them. 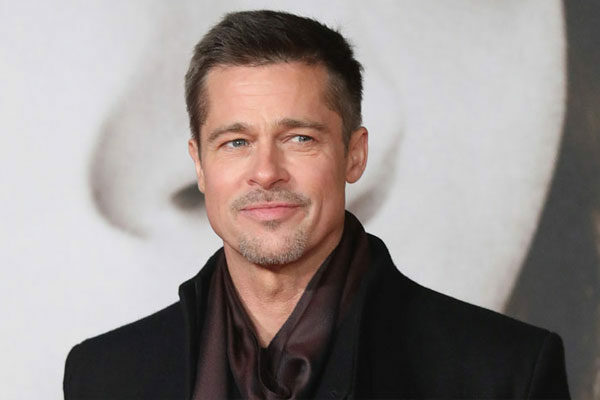 Each person interpretates the dreams as they want, and many of them think that each dream has a meaning and tell us something important, so check out this facts we have about the dreams and you might understand them a little bit better. There are some people who confirm that they don't ever dream, but this is because they forget their dream 5 minutes after waking up, reason why you should write down all the things you remember after waking up or jsut forget them for the rest of your life. You might think that you've dreamed of unknown people, but that is just impossible, because when you dream all the faces you see are memories of the people you've seen, confusing right? 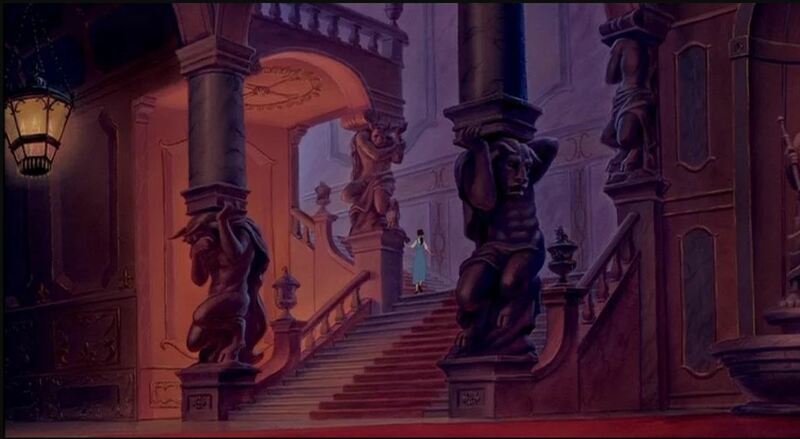 But yes, it doesn't matter if you only saw them for a second that face might appear in one of your dreams. When we wake up we only remember the last part of our dreams, and that only the 10% of them, and it has been proved. Yes, there are images that you will never remember. ¿Is it possible to not dream? 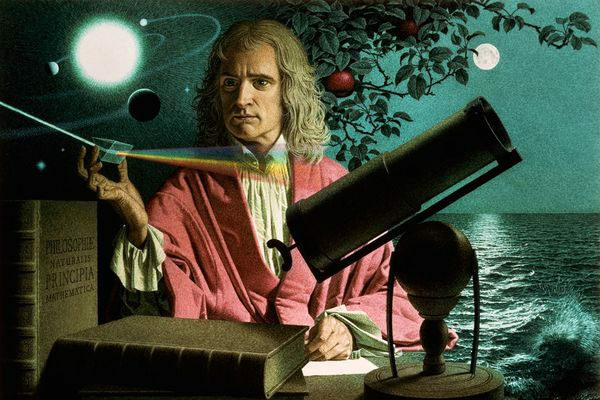 Many people question themselves this, and there are some that are completely sure that they don't dream; although, or at least you suffer from a several psychological transform, each person in the universe dreams. The only problem is that they don't remember. 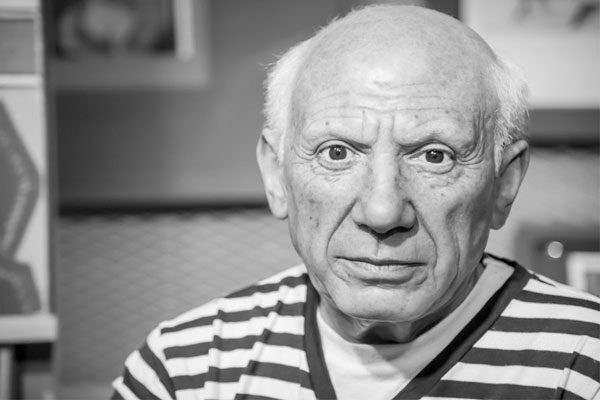 A study made in 1960 confirmed that people dreamed in black and white, at that moment nobody knew the reasons, but after the observation they found the answer. When the study was made again in the new millenio, they came to the conclusion that people dreamed in black and white because they sat for many hours watching the tv and it was the reflect of what they watch. 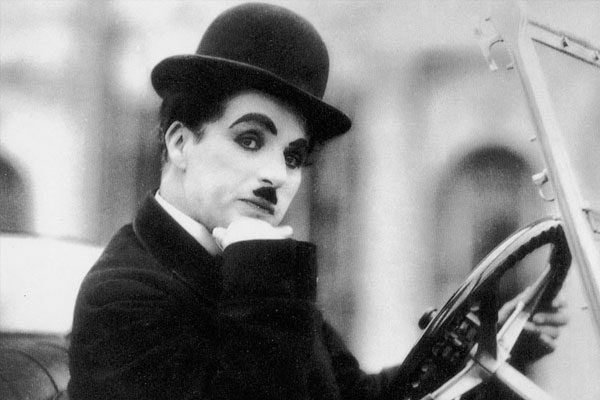 Nowadays the images are in color and so are people's dreams. 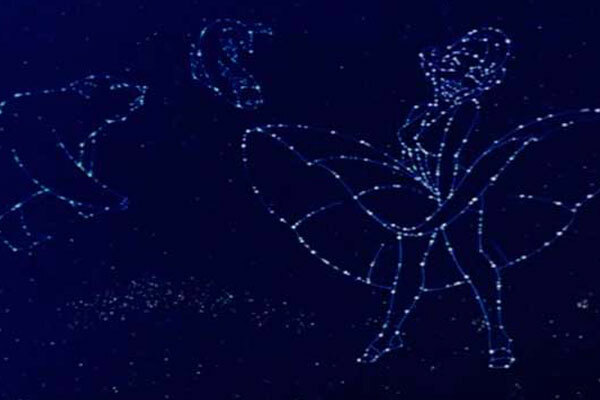 ¿How many dreams can you have in one night?
. 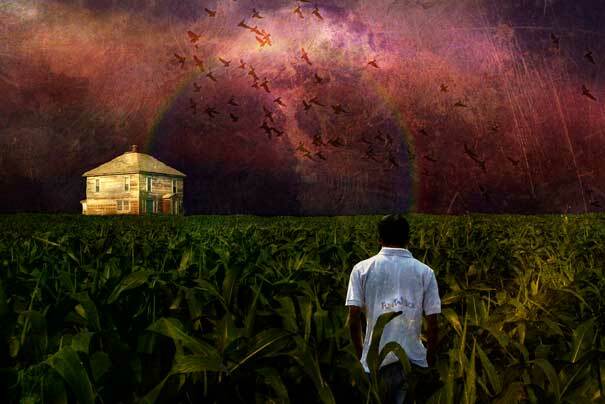 According to studies with people that sleep around 6-8 hours has 6 to 8 lucid dreams, each one completely and with an interesting story; although, we only remember one or two dreams, and mostly they are the last ones we have. 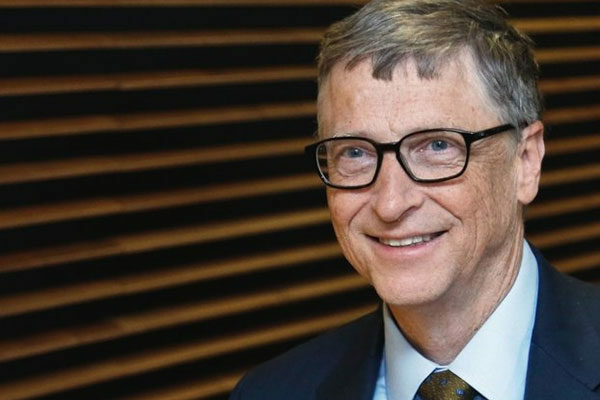 The biggest inventions ever made by genius were made thank you to their crazy dreams, and you follow their steps too, because might be the future creator of something amazing; for example, the insulin, the sewing machine and some periodic elements. 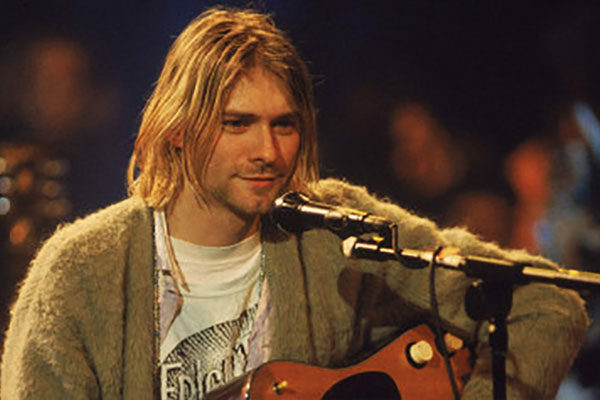 ¿Who do i know if i am dreaming or not? Sometimes dreams can seem so real making us doubt if we are actually dreaming or not, but there is a technique that actually works and it can help you to know if it’s just a dream. Look for a book or a clock in your dream, because when you are dreaming you can't read or see the time, also, your hands will look blurry. Some people have premonitions during their dreams, and doesn’t matter how dumb and crazy it might seem each character in your dream, each one is trying to give you a message about your past or future. If you can interpret them, you will understand better your emotions and fears. ¿Do dogs and cats dream too? Many people thinks that dreaming is just for humans, but many studies have revealed that just like us, cat and dogs dream too. 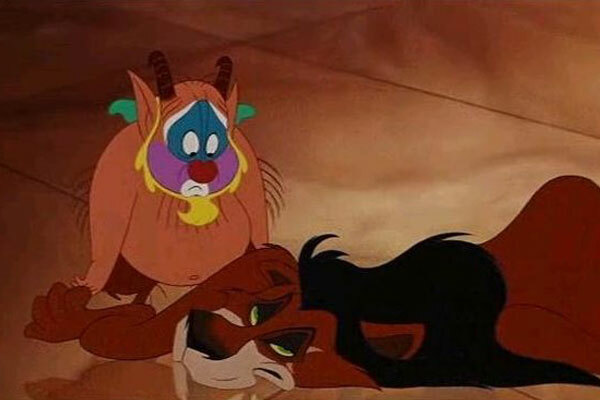 Pay attention to your little friend next time it takes a nap and see all the moves it makes. The extraordinary and interesting condition of the sleepwalkers happens because they have really deep dreams and they believe that they are actually living it. In some situation many people has done crazy things, as cheating, and also created incredible pieces of art, and not of them remembers nothing after waking up. The experts say that sleepwalking is linked to genetic defect, because in all the cases there is a medical history of the member of their family related to this condition. This also happens between identical twins, so check out your family's medical history. 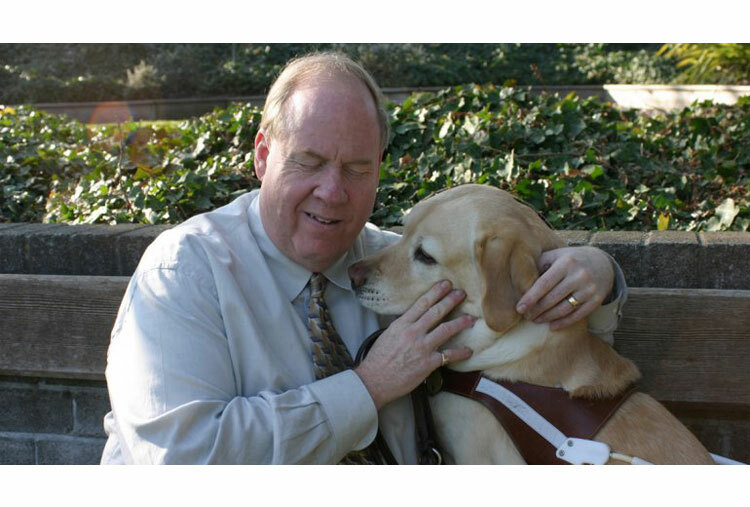 ¿How do blind people dream? There is no exception, we all dream as we said before, including blind people. If the person lost its vision, its dreams show all the remembered images, but if the person was born blind, then the dream that person has are really curious, all the smells and sounds are really clear and strong. 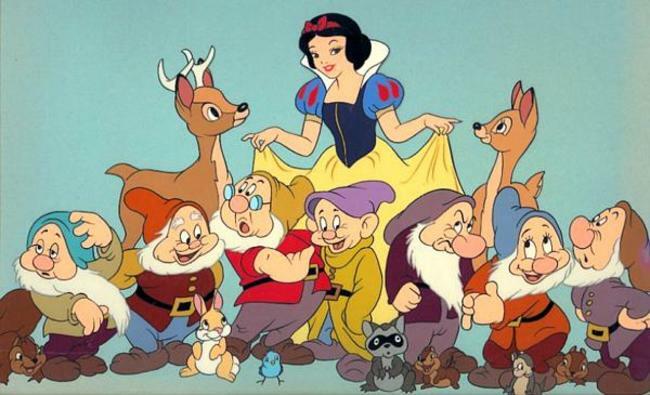 Do Girls and boys have different dreams? 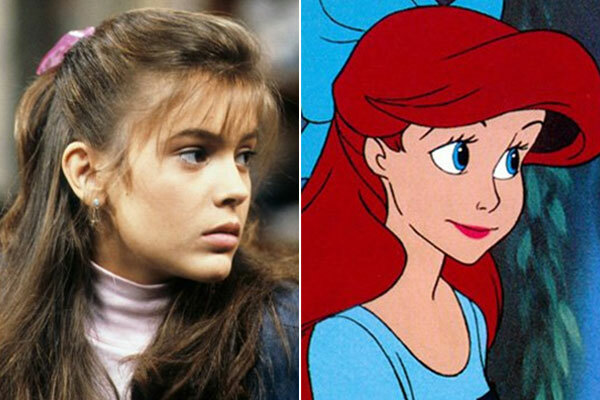 It has been scientifically proved that girls have different dreams from boys, the style varies a lot; for example, guys have the tendency of dreaming thing related to violence, sexuality or personal achievement, on the other side girls usually dream of their deepest feelings, family, friends and childhood. 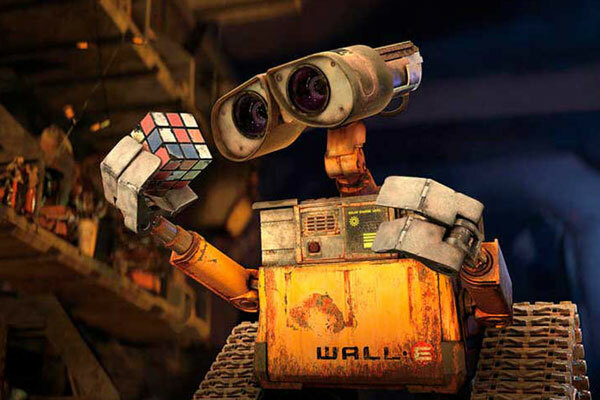 ¿What is the function of our dreams? Believe it or not dreaming is really important. Their main function is retaining images, memories and experiences, so it’s like a typo of therapy to organize all the memories, faces and information you need to keep in your mind, and taking out all the things that aren't necessary and are just taking space. Some study talks about the theory that understand the dreams, how they organize our memories, and help us get prepare to face life; in other words, the subconscious that tries to tell us things and how to react in some situation of our lives through the dreams, making up imaginary parallel worlds. Our minds interprets external stimulations and it makes them part of our dreams; this means that sometimes we can listen to a sound and incorporate it to our dream. For example, you can be dreaming that you are at a concert while there is music playing in the back of the room. It is known that on average, a person usually dreams a third part of his life; also, it is estimated that a person dreams about 6 years on his entire life. 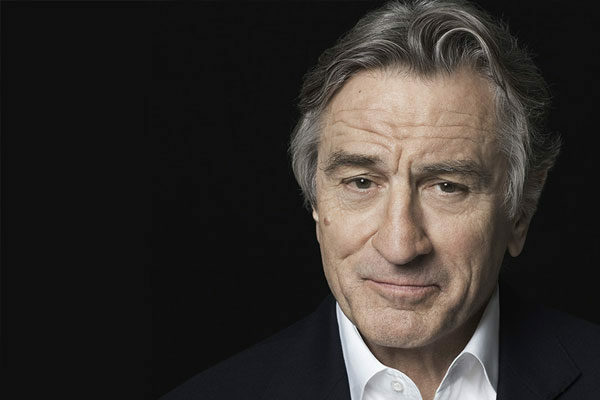 We can also mention a really important fact about the dreams, each one lasts no longer than 5 minutes. There are some incredible dreams we never want to wake up from, but it’s said that the 60% of the times the dreams become nightmare, making us feel anxious and stressed.